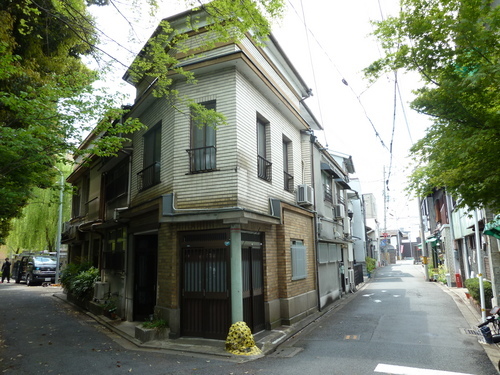 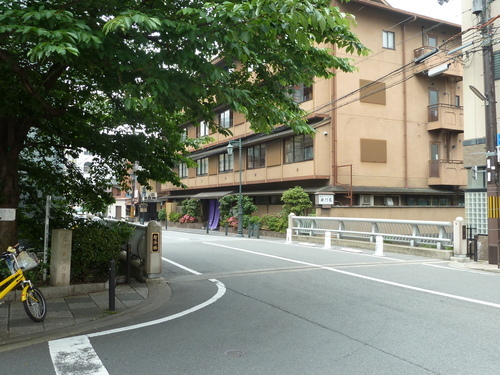 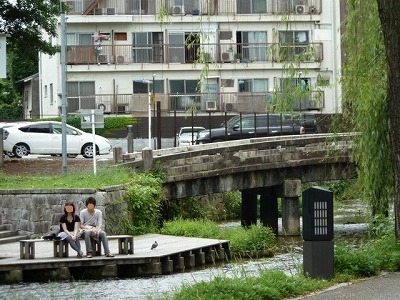 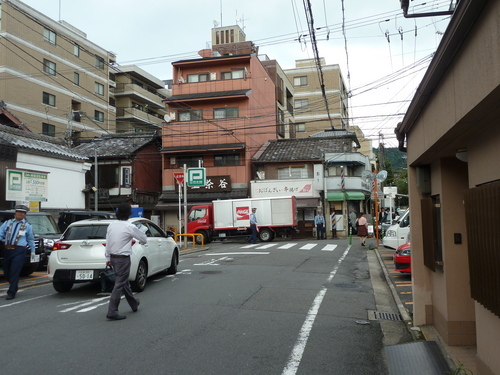 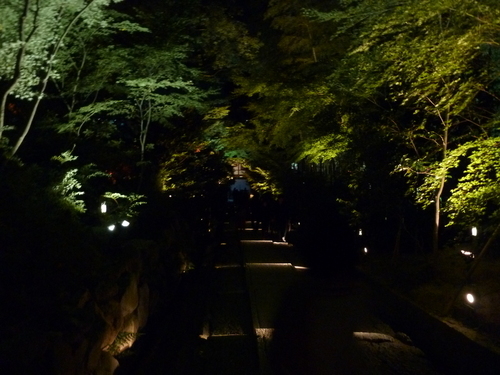 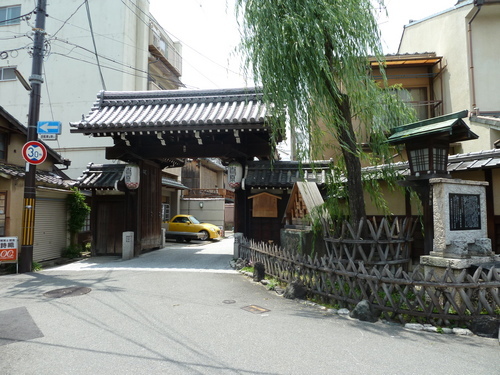 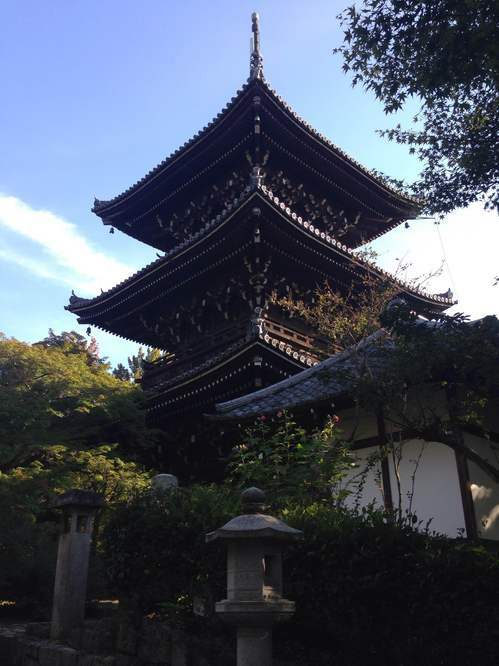 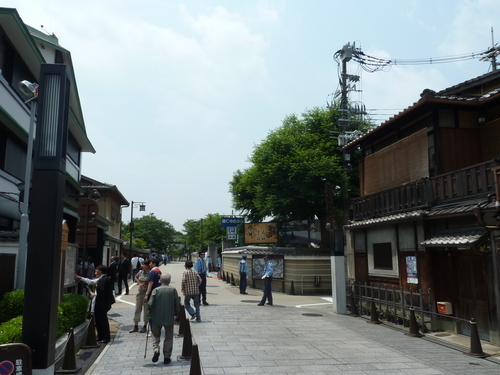 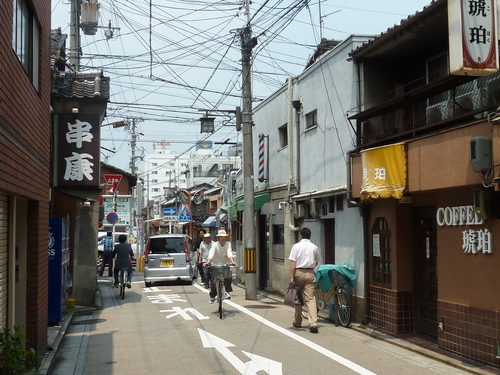 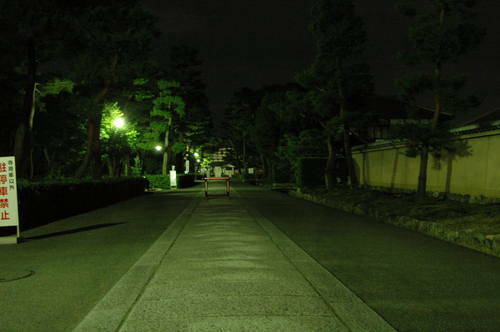 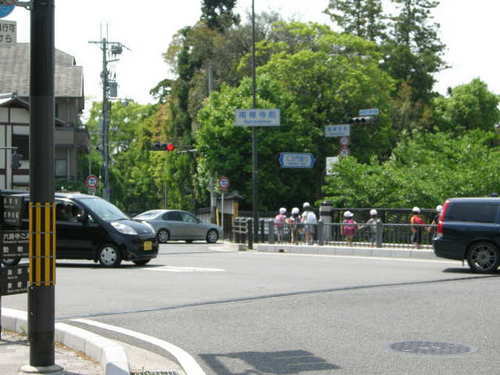 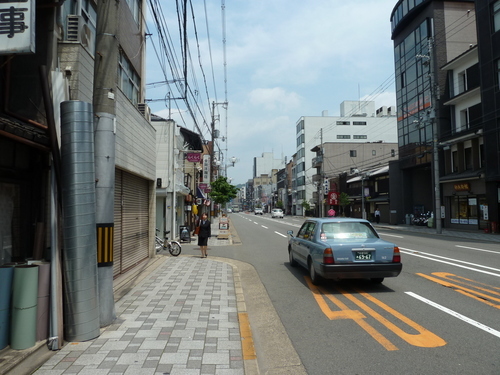 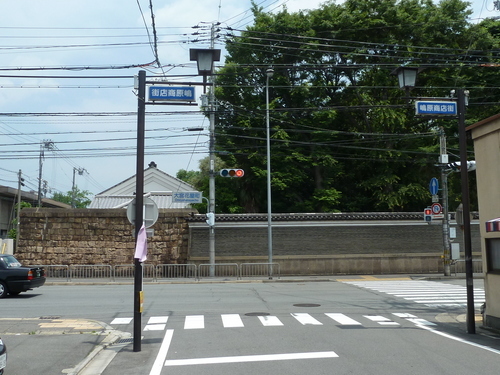 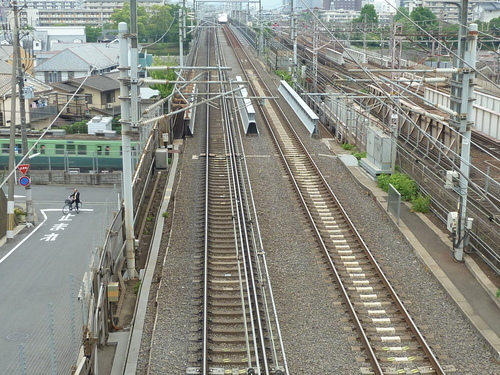 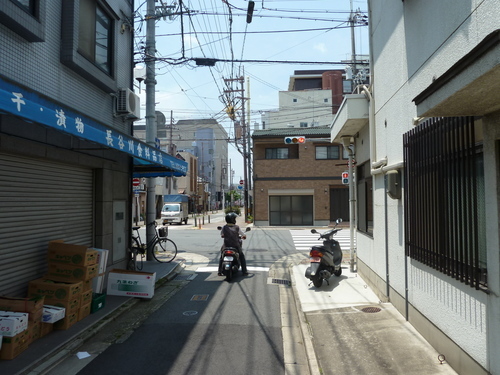 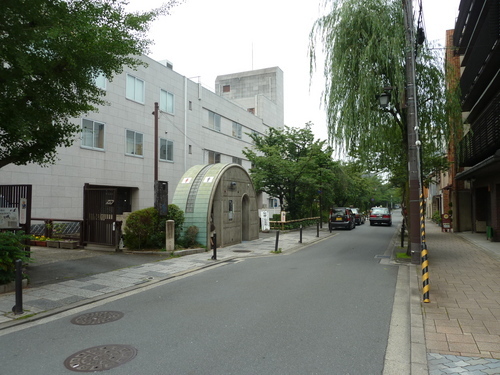 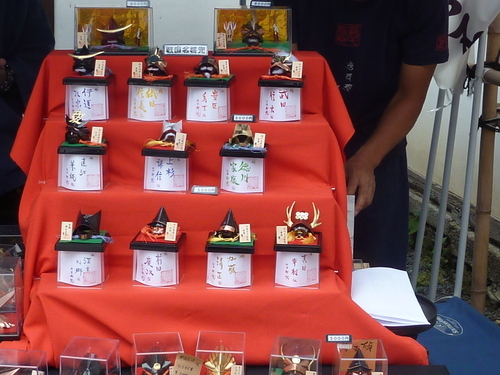 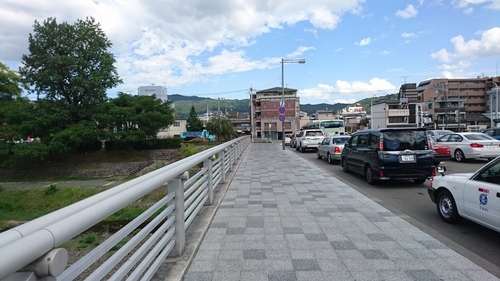 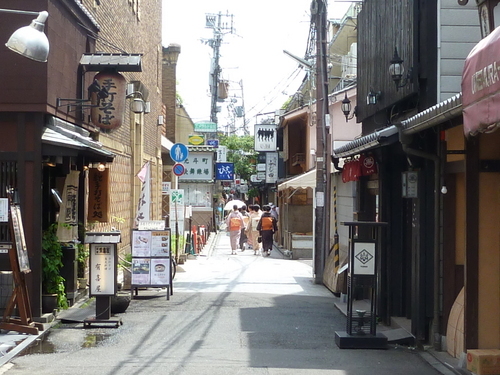 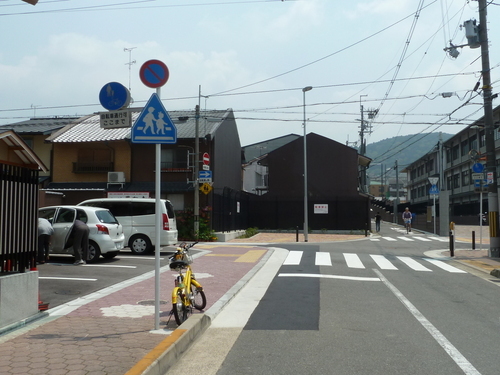 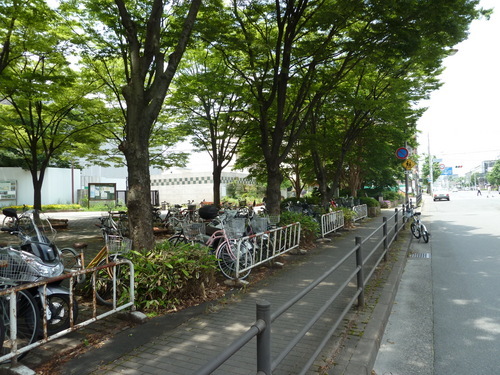 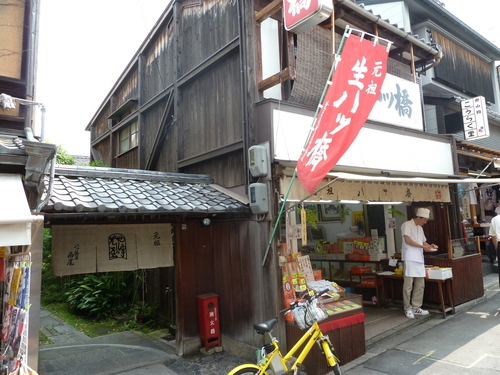 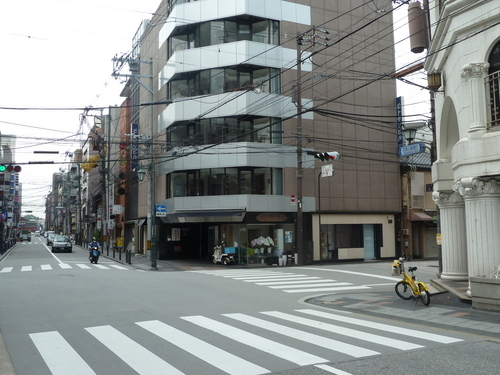 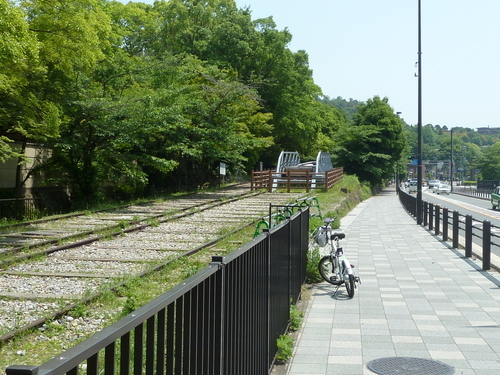 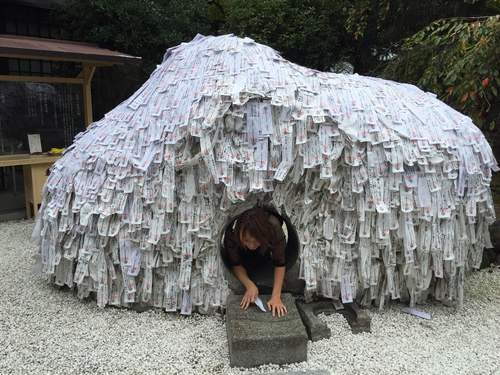 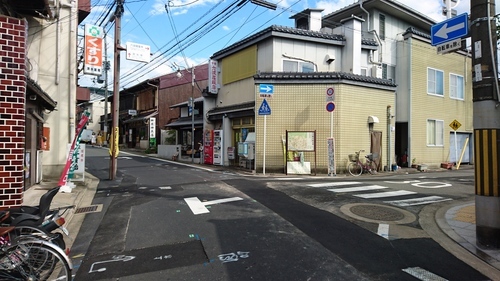 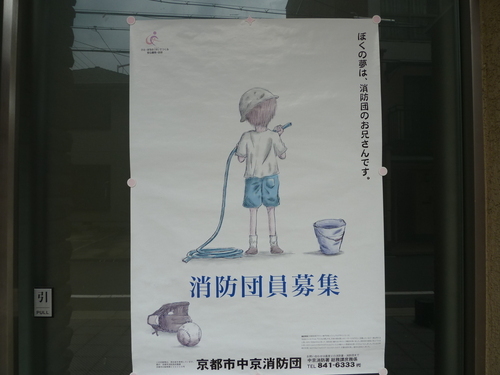 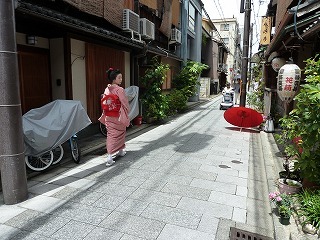 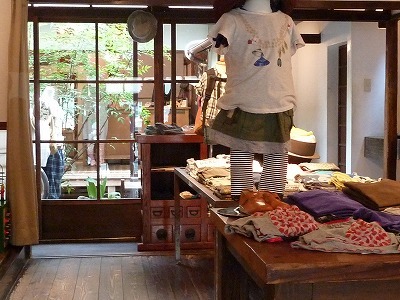 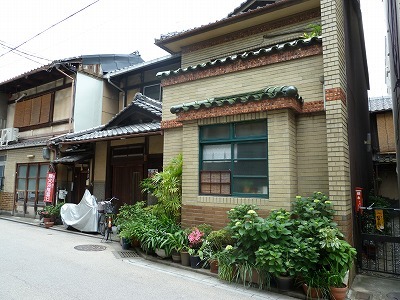 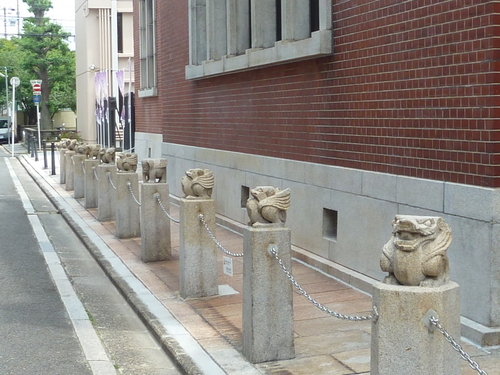 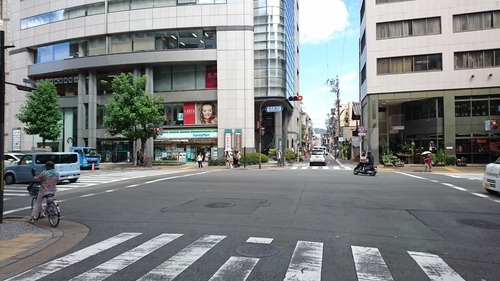 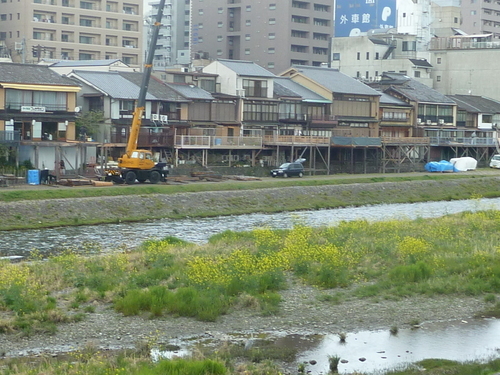 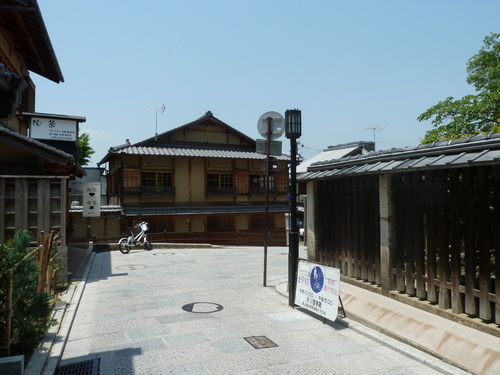 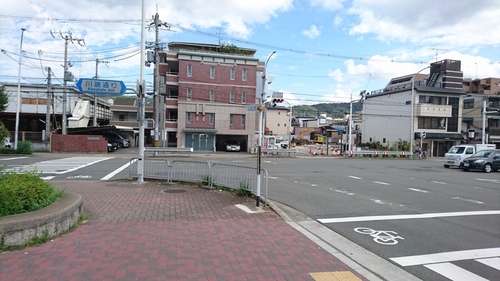 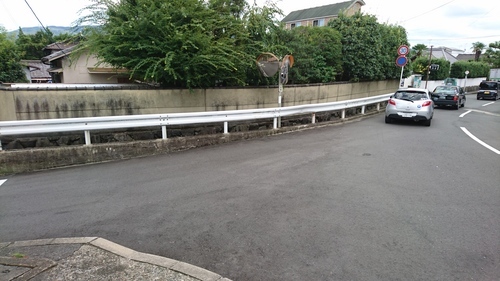 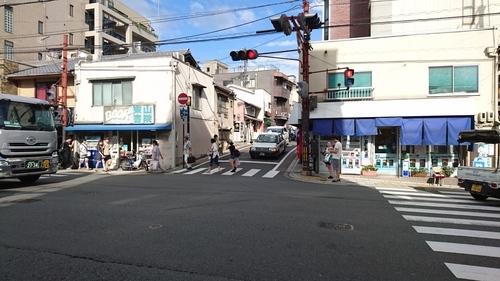 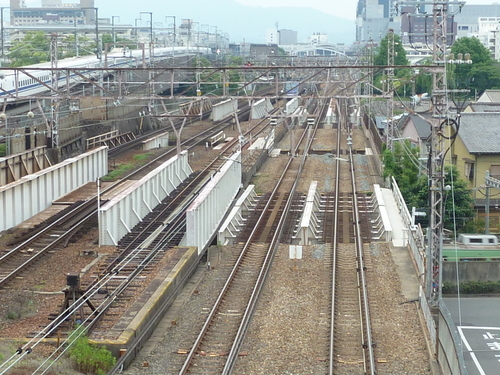 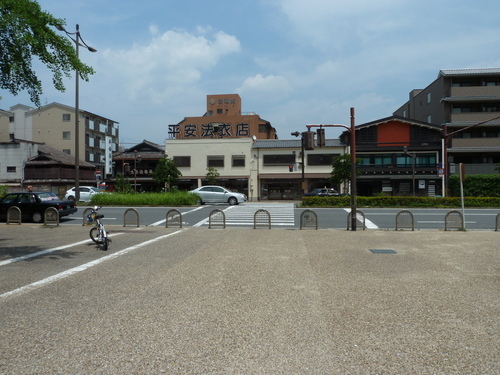 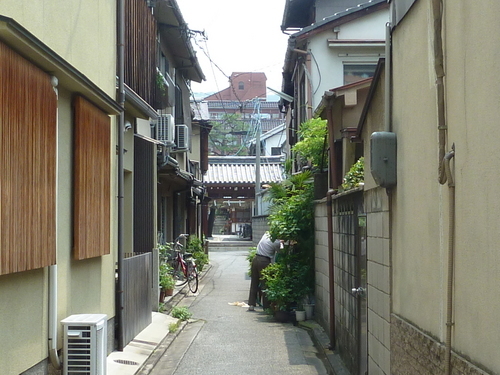 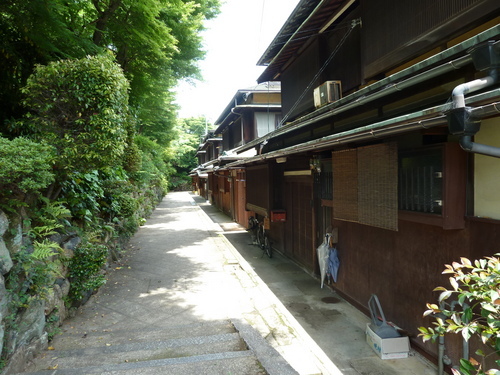 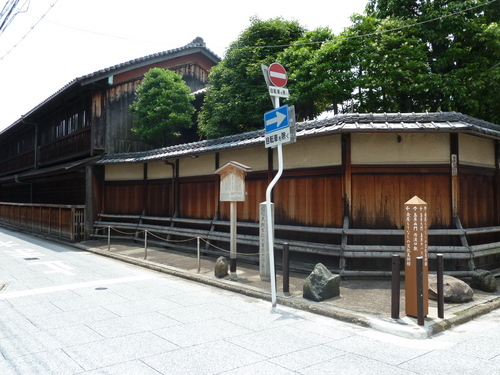 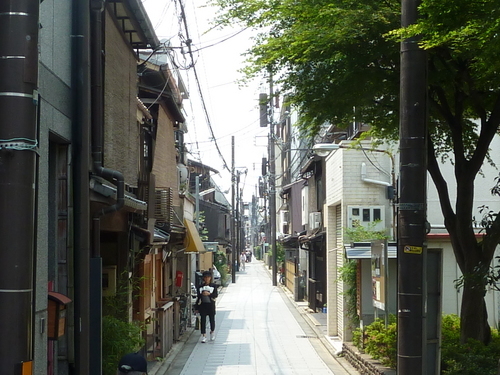 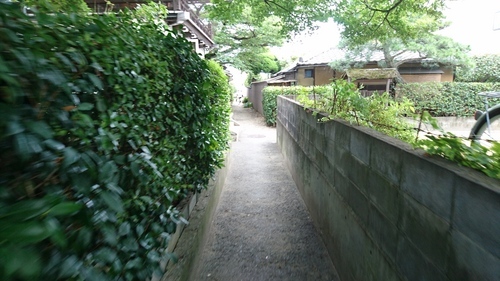 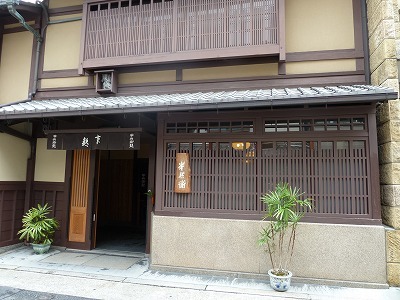 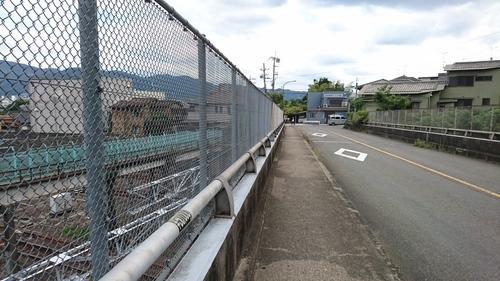 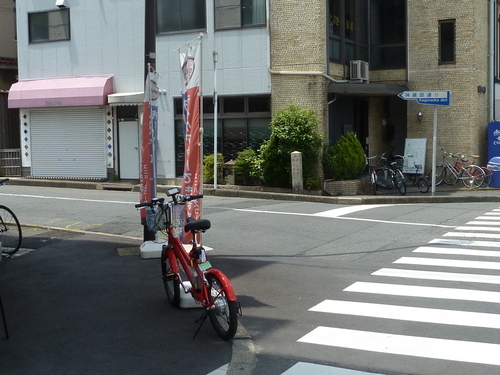 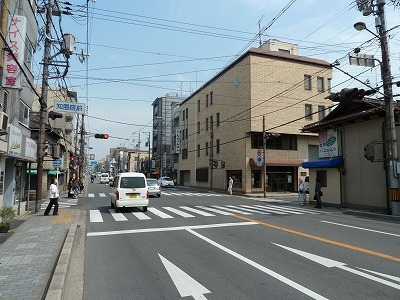 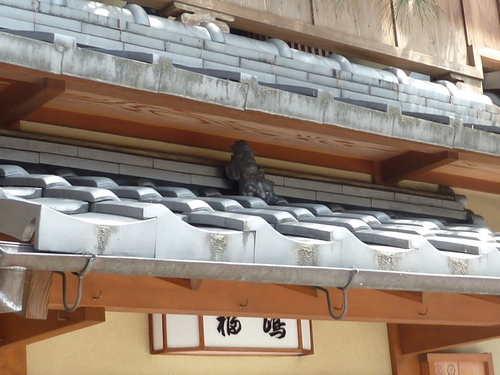 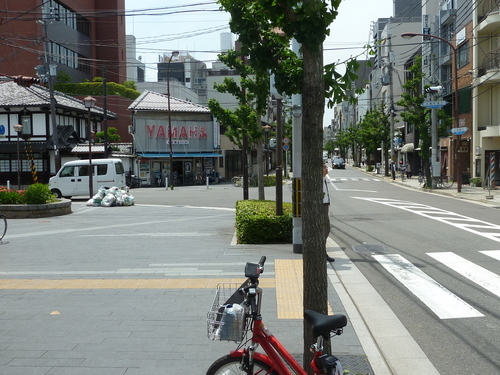 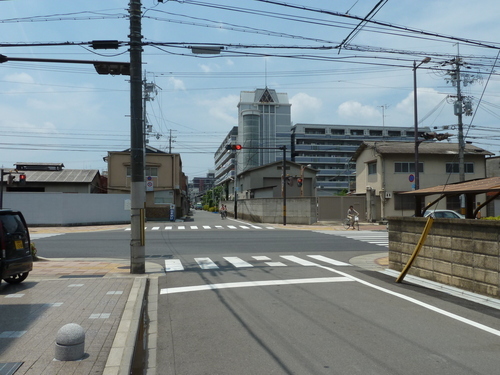 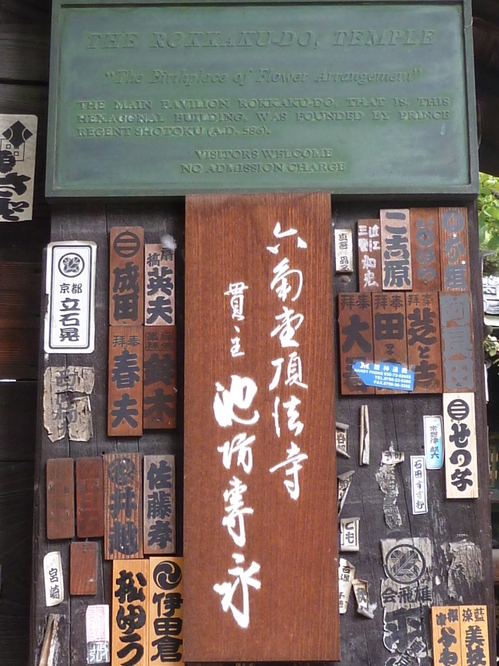 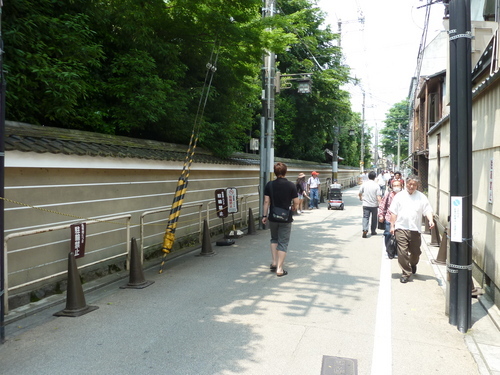 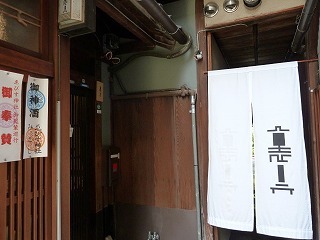 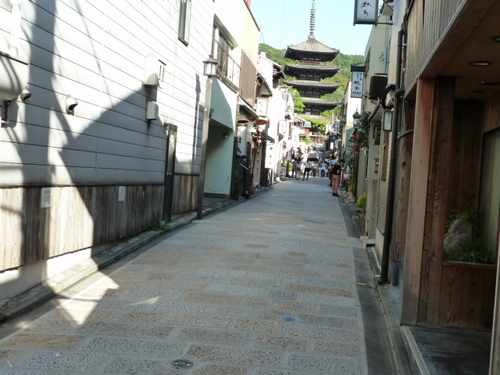 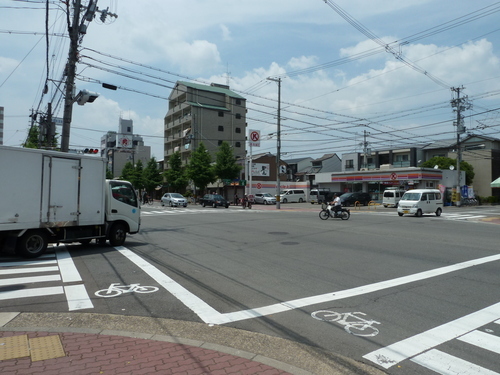 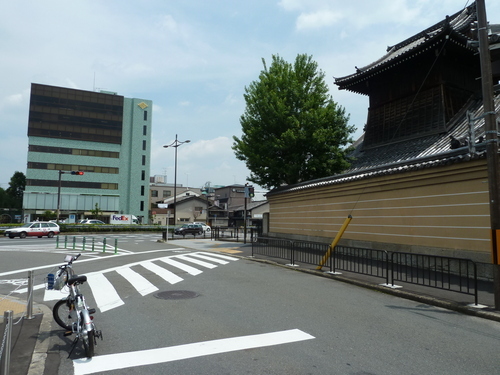 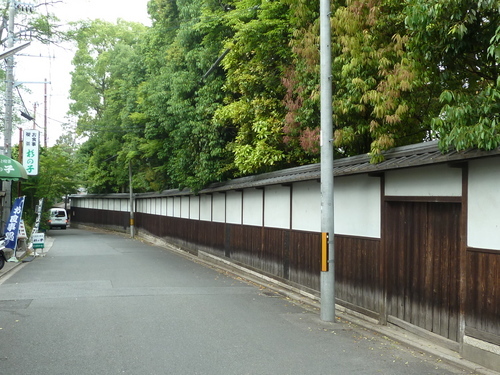 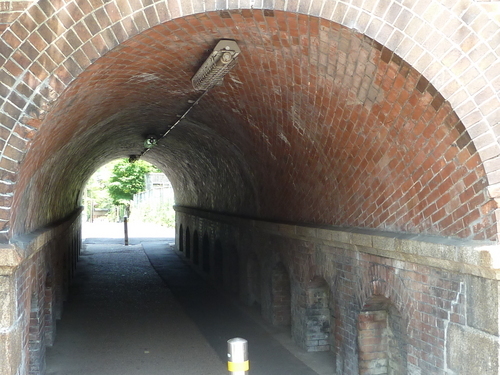 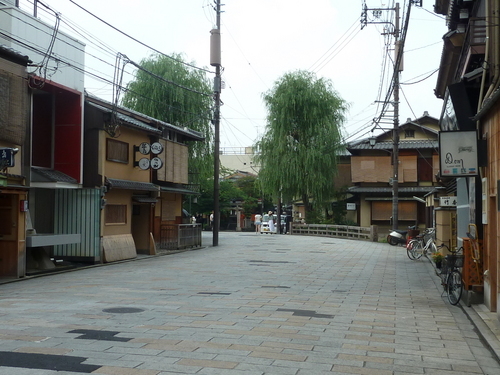 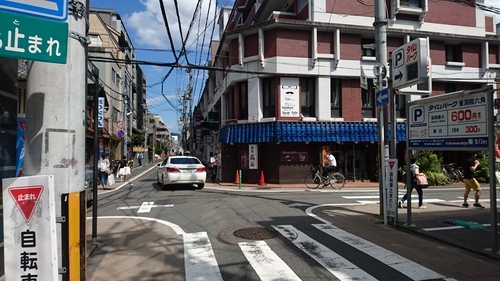 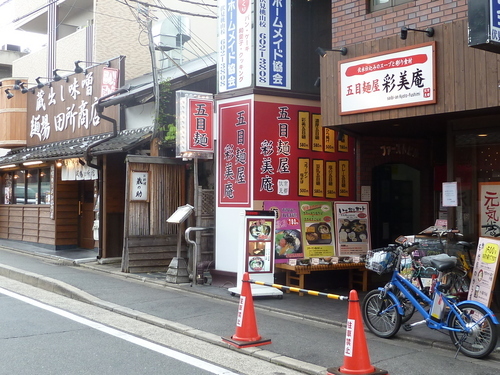 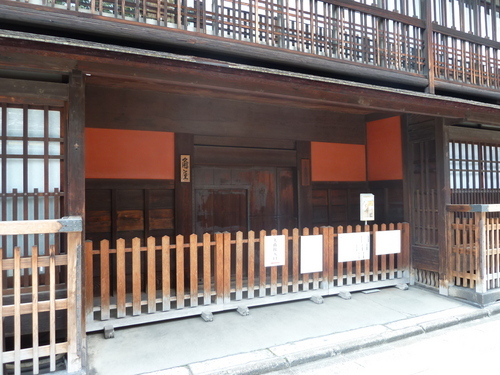 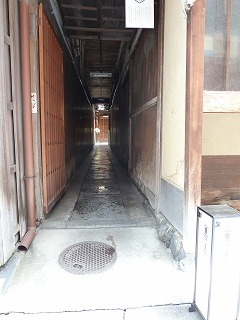 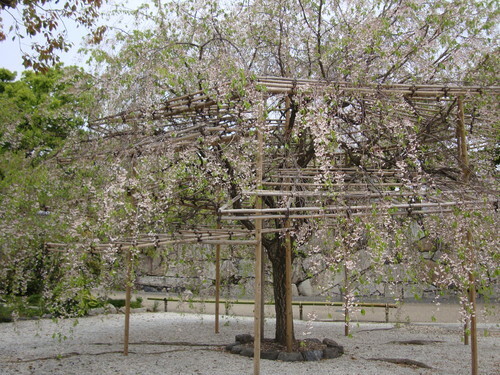 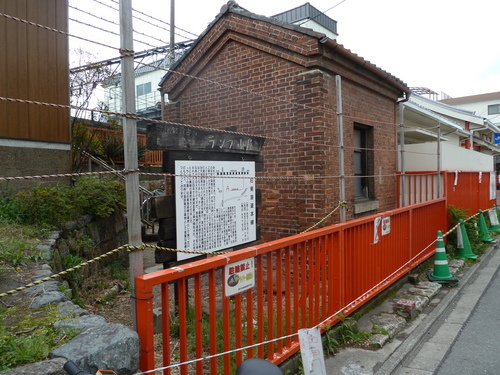 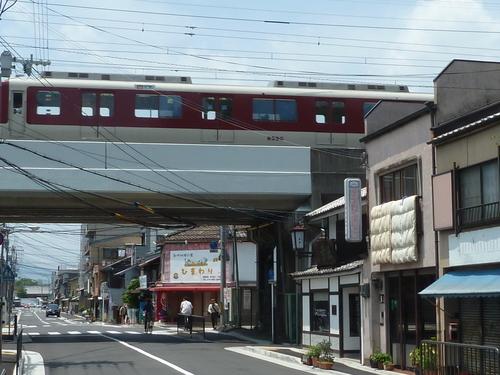 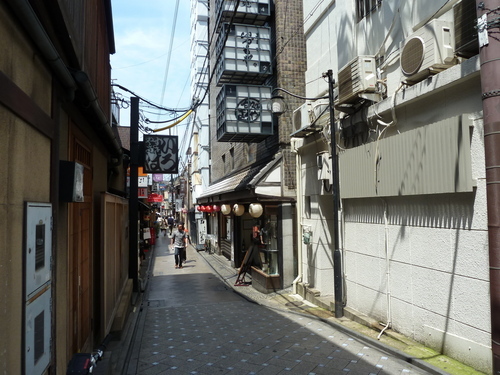 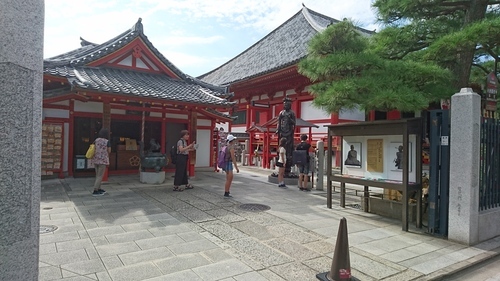 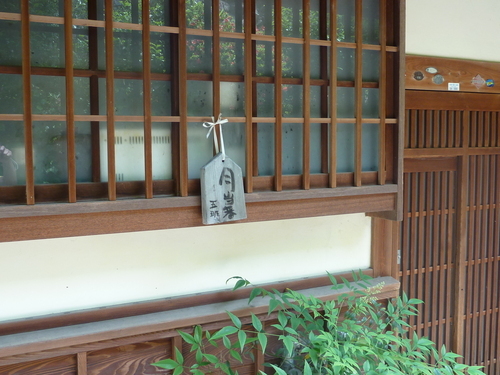 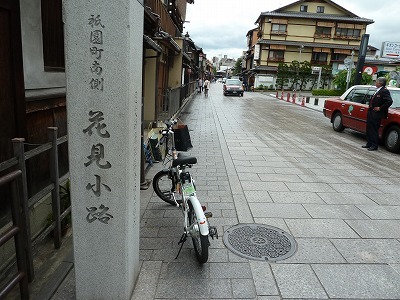 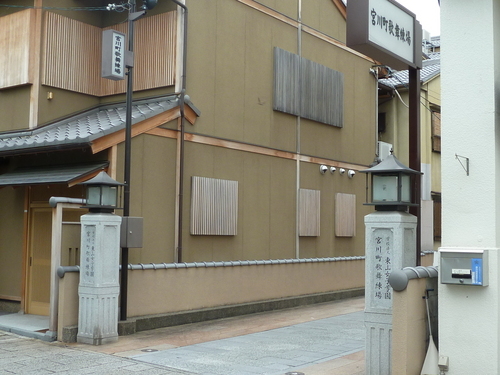 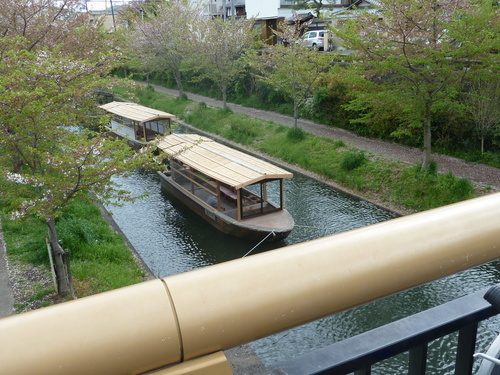 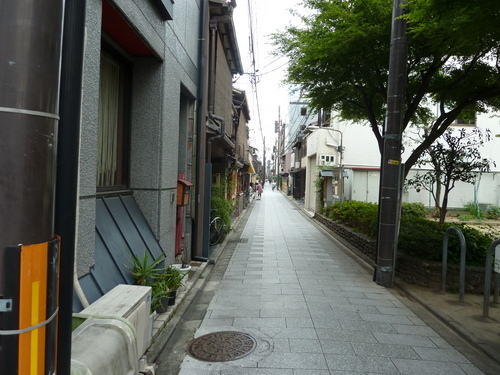 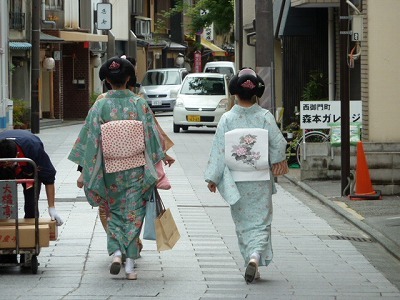 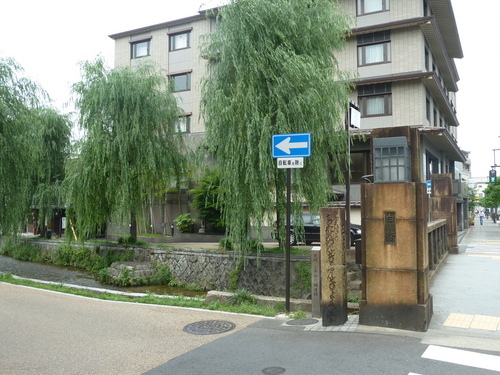 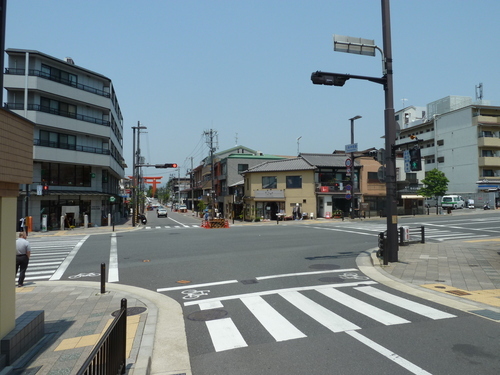 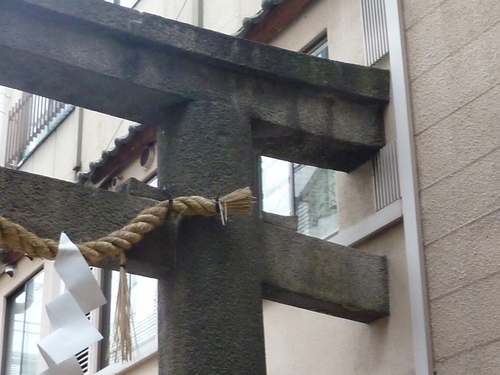 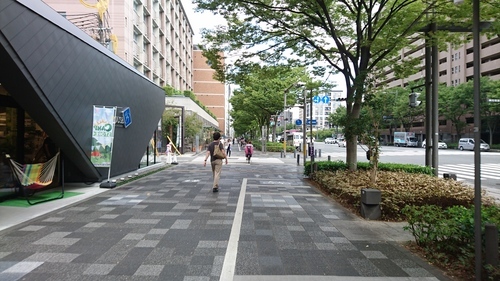 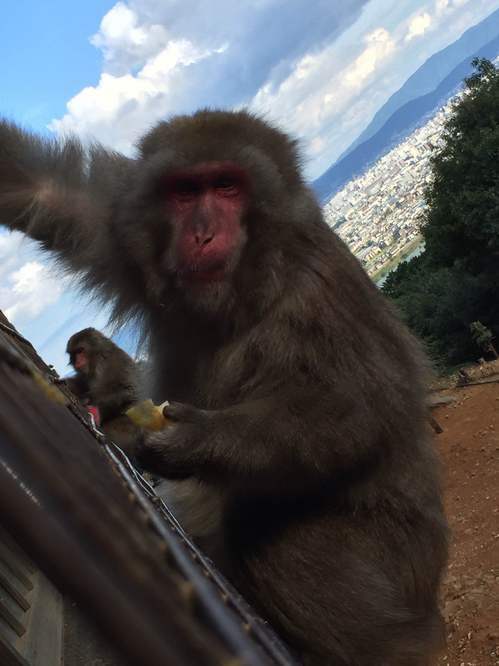 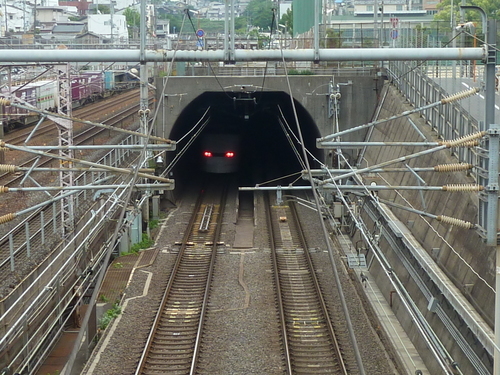 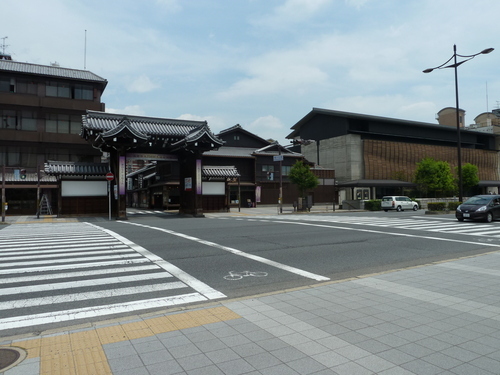 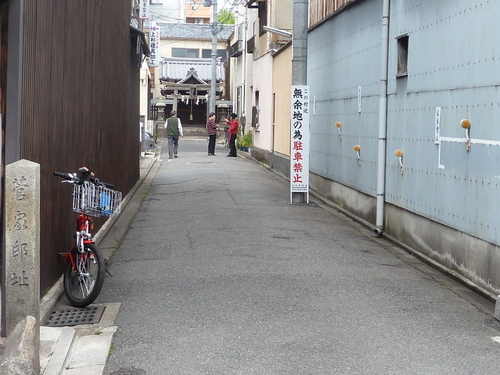 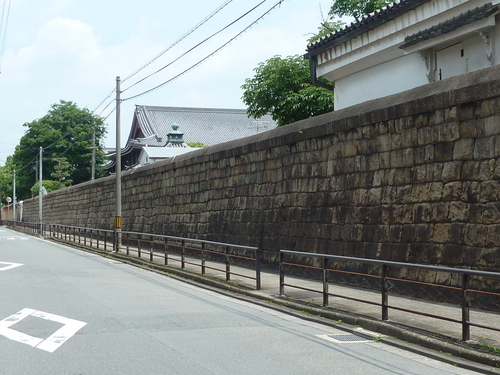 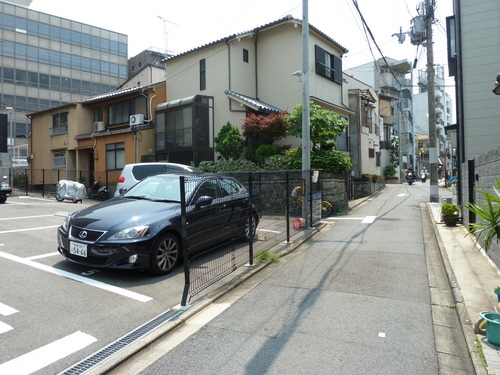 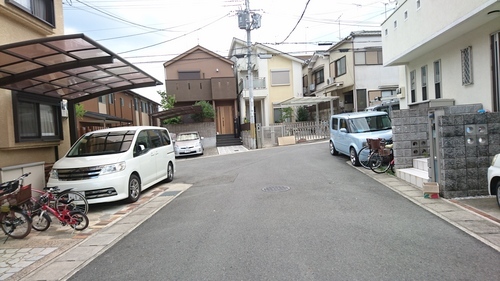 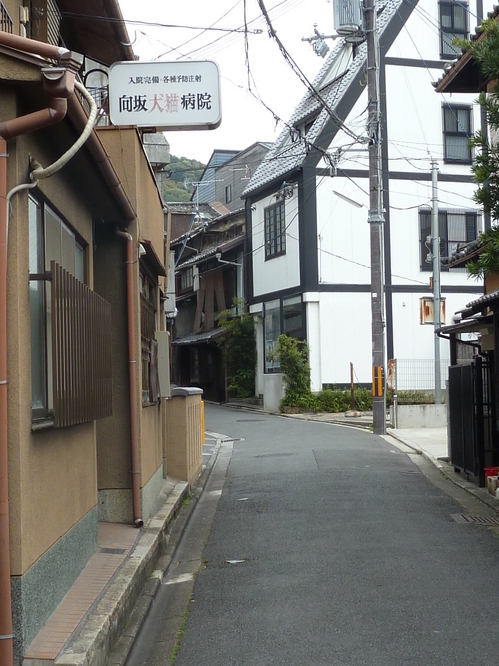 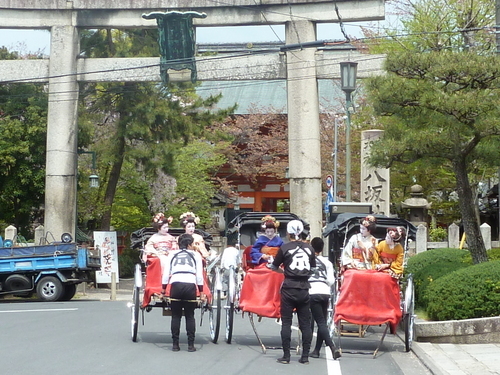 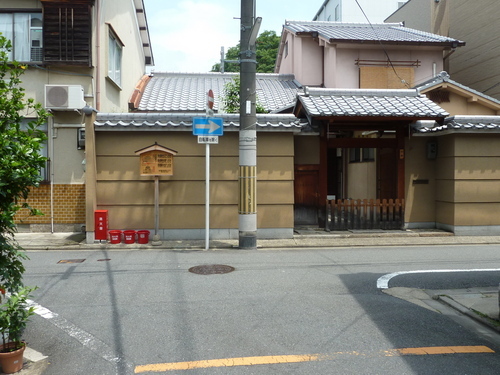 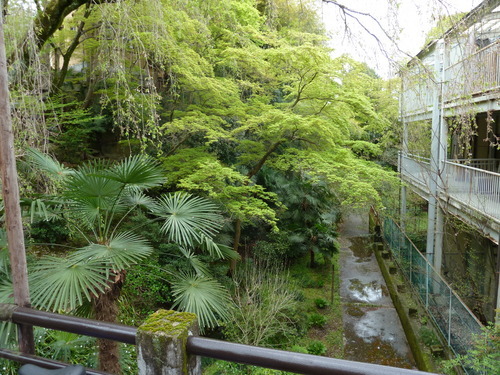 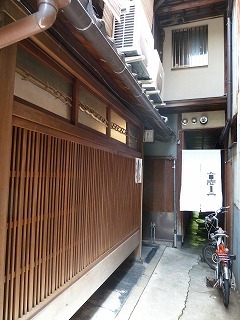 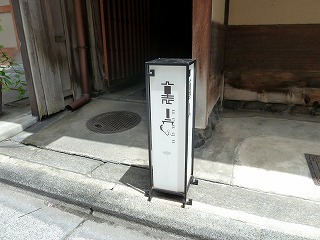 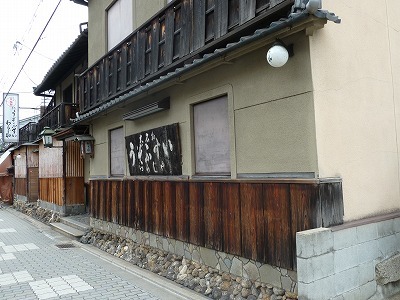 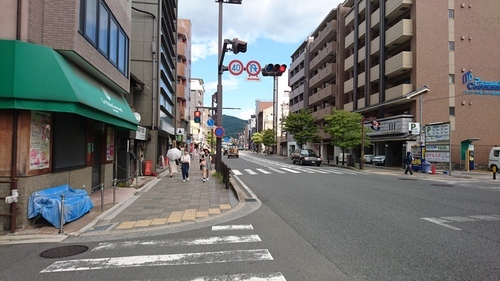 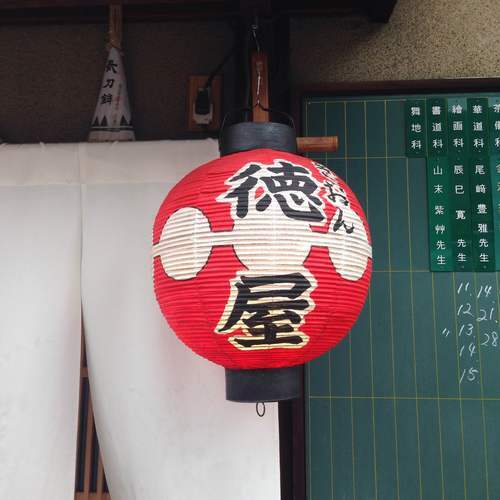 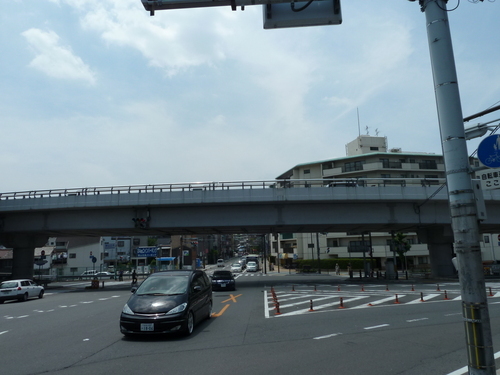 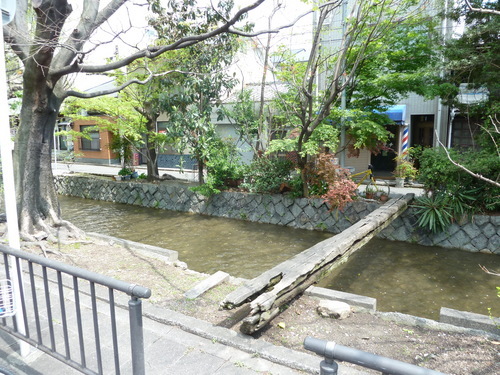 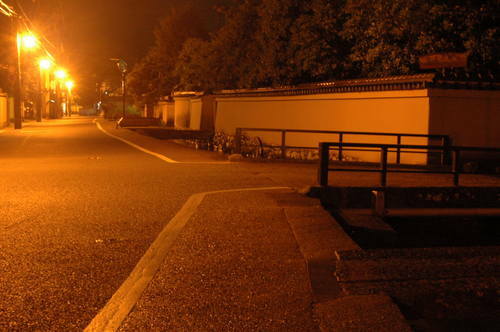 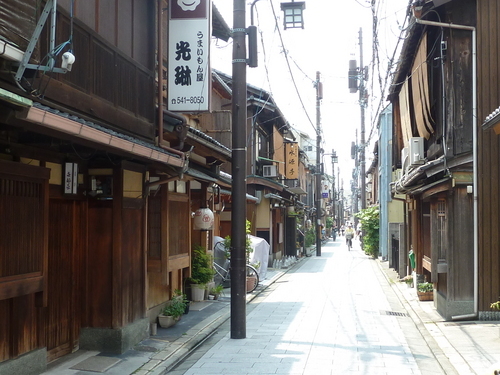 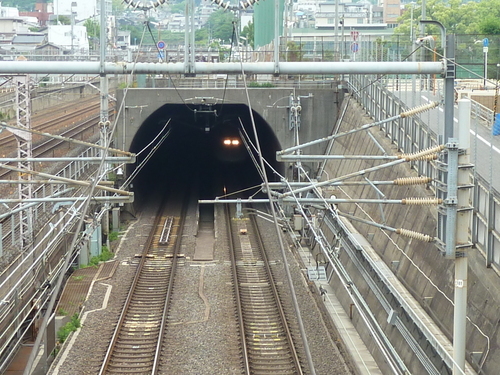 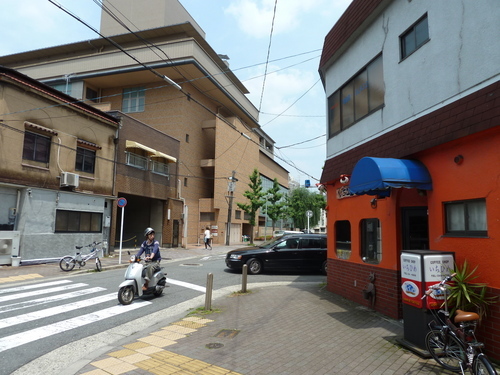 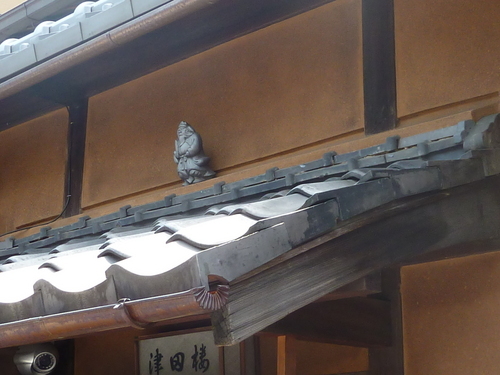 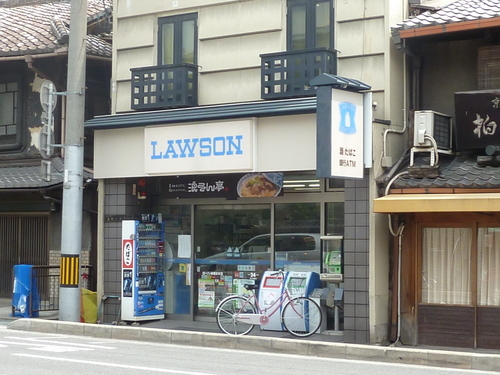 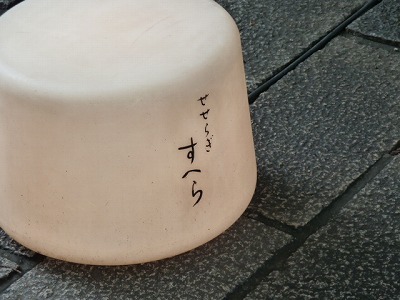 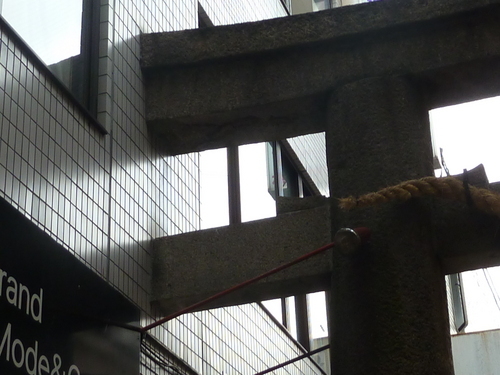 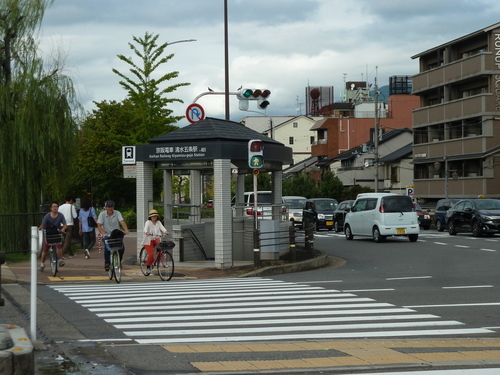 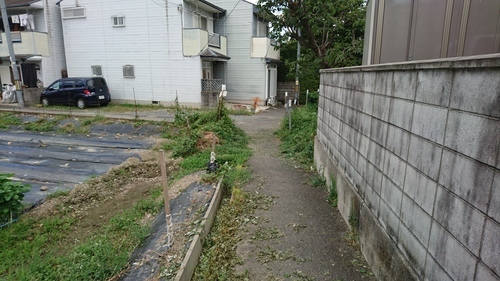 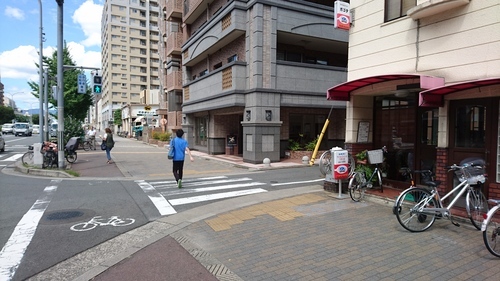 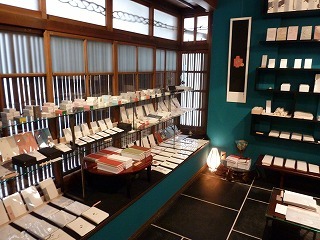 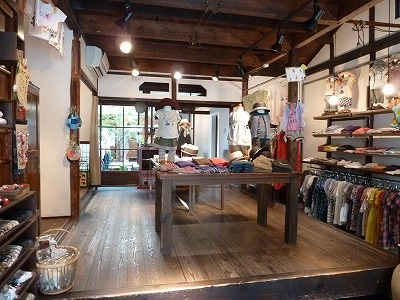 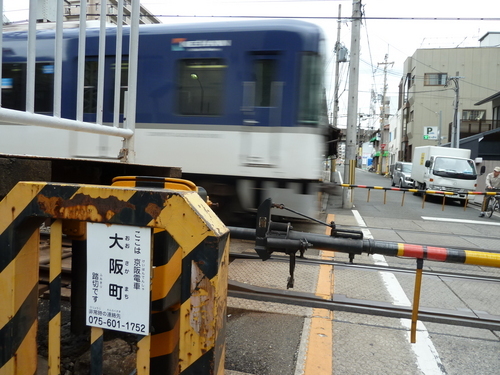 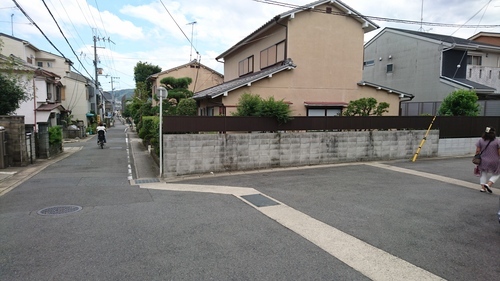 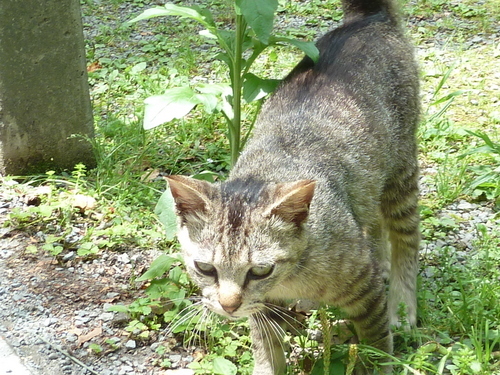 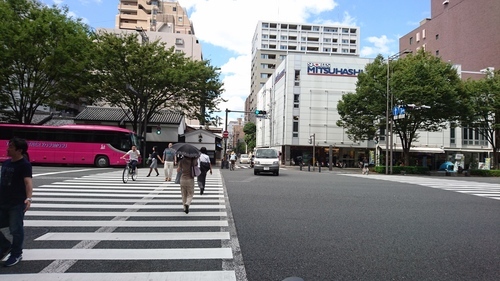 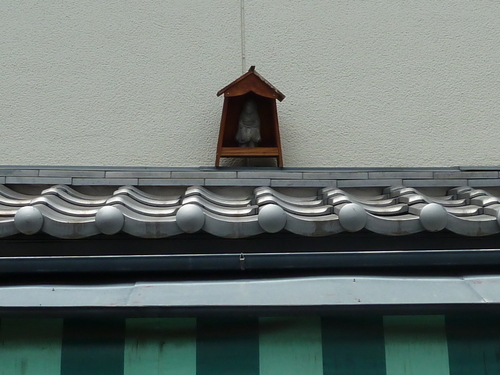 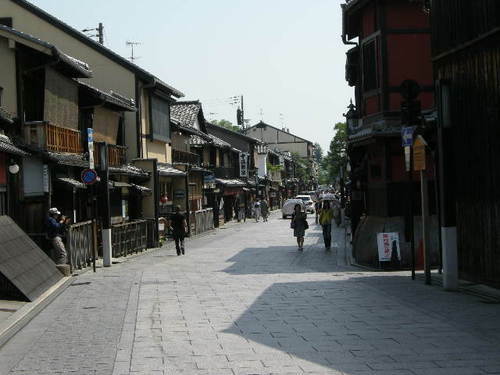 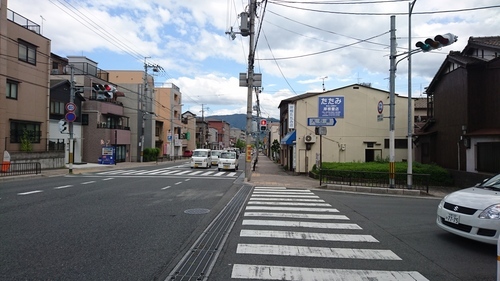 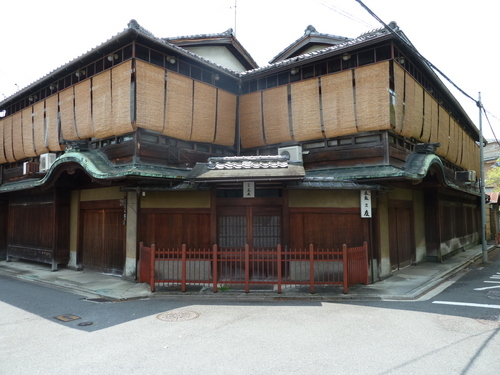 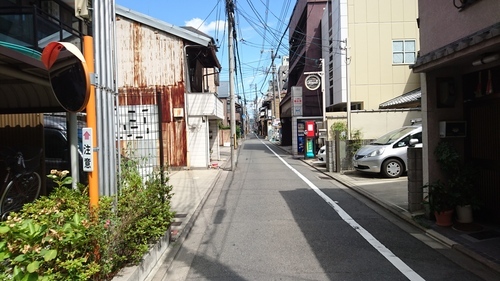 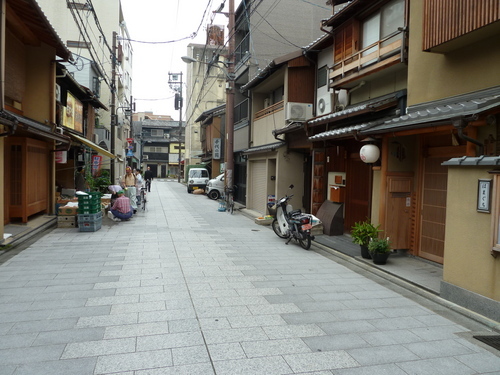 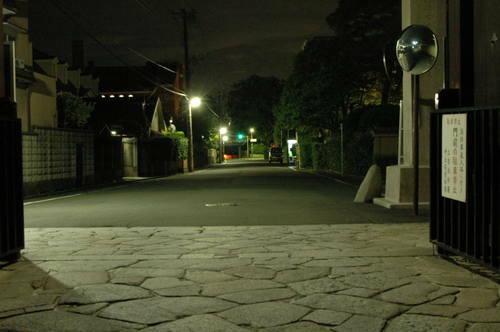 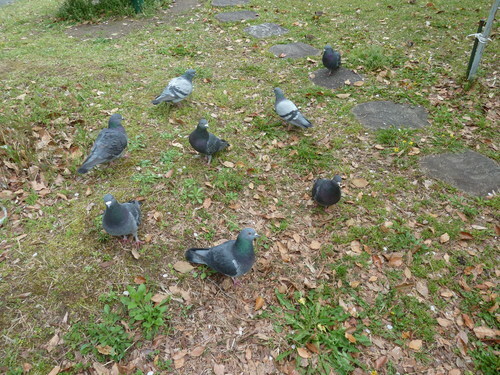 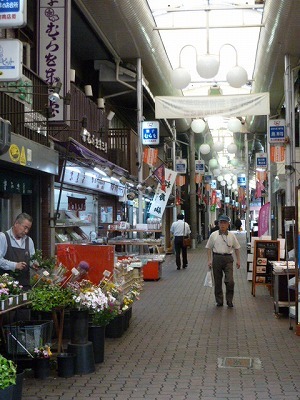 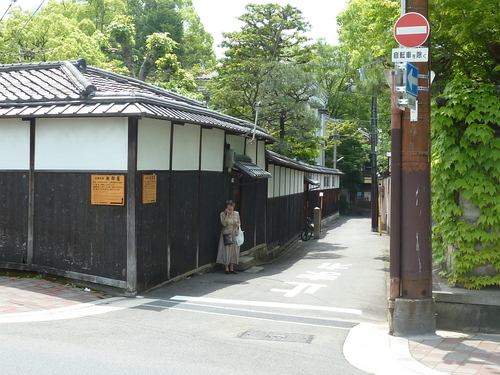 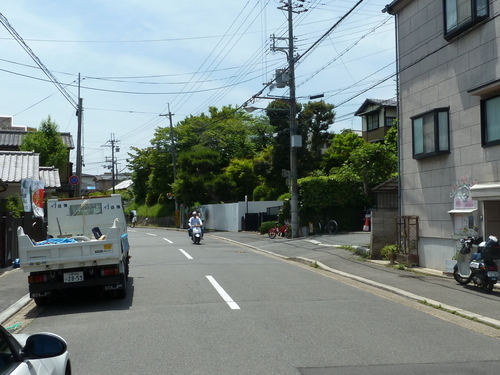 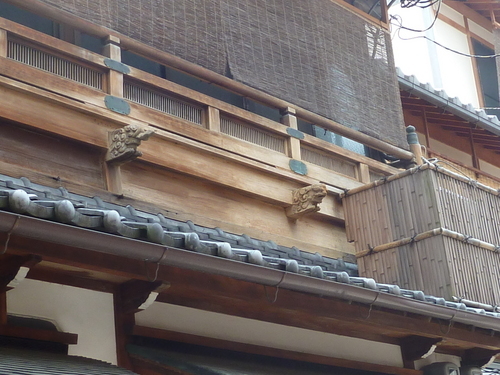 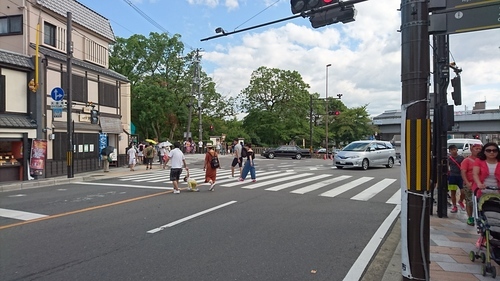 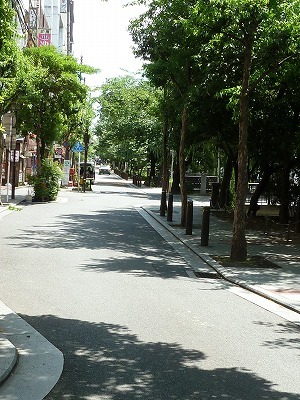 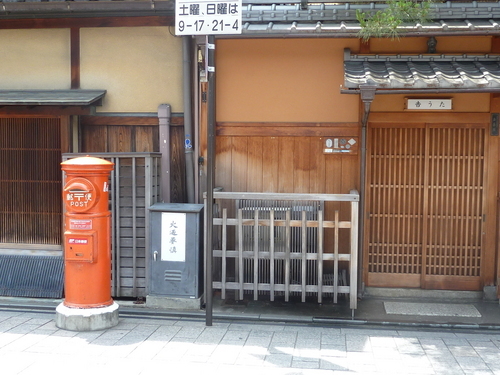 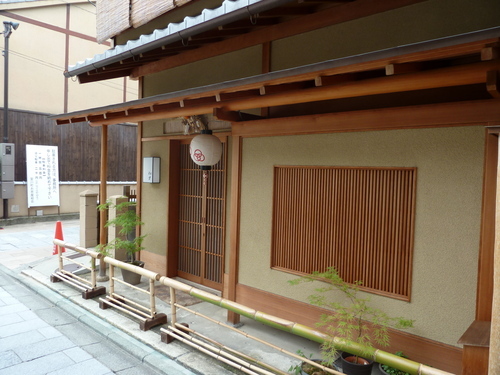 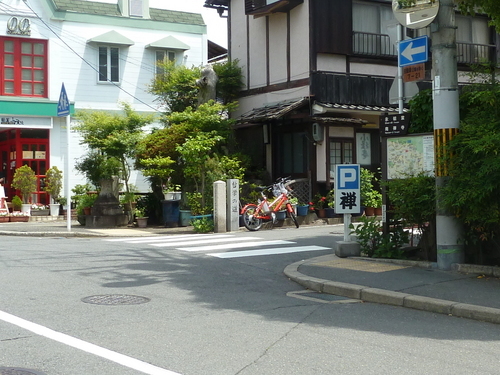 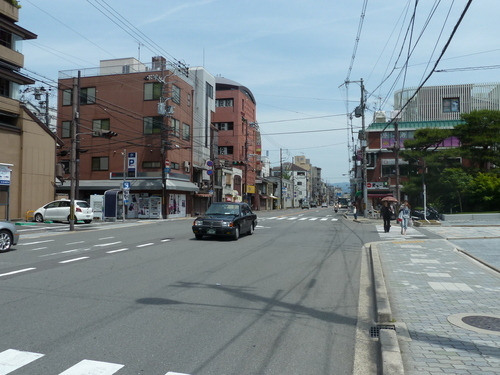 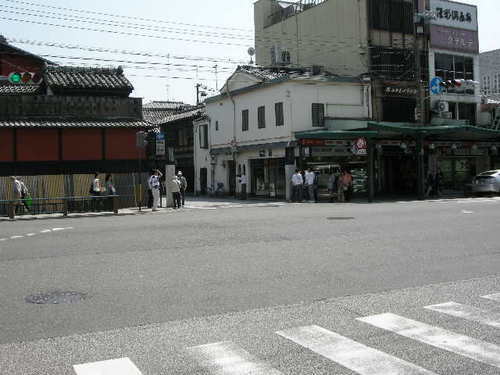 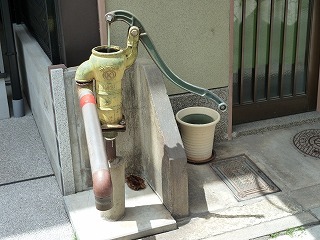 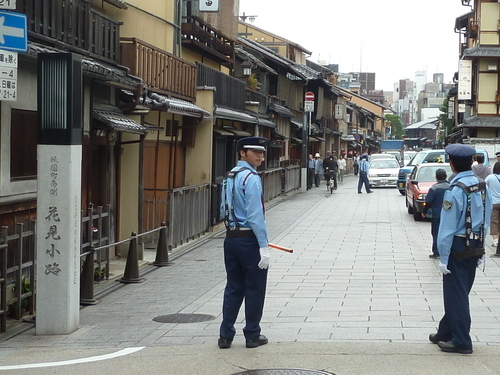 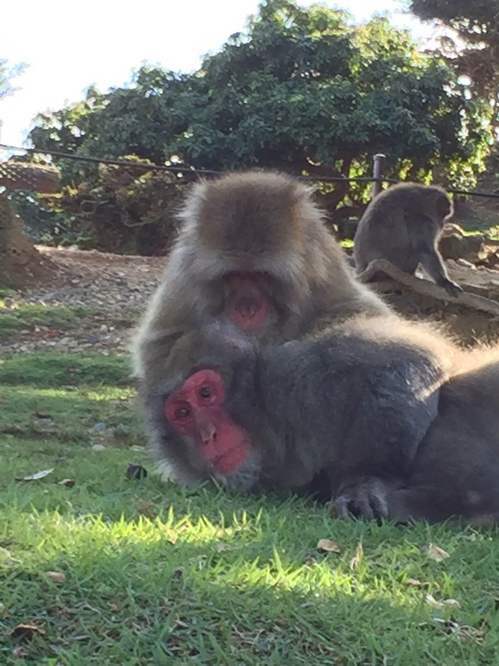 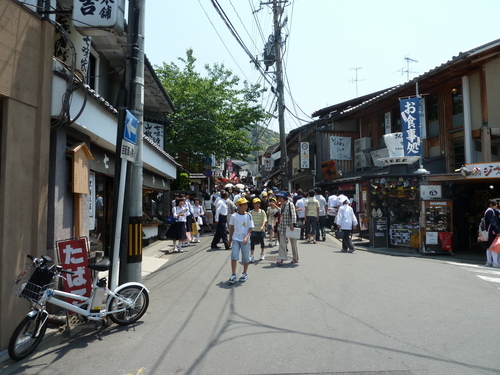 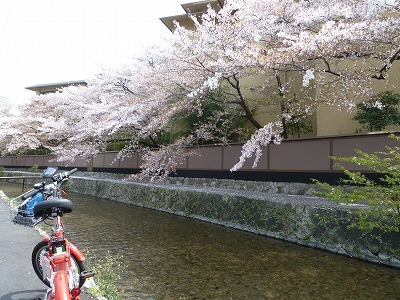 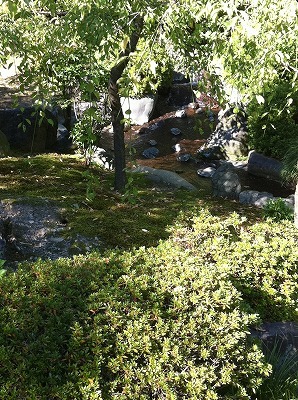 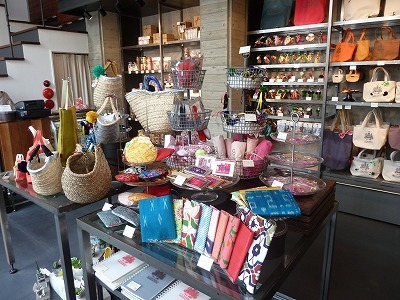 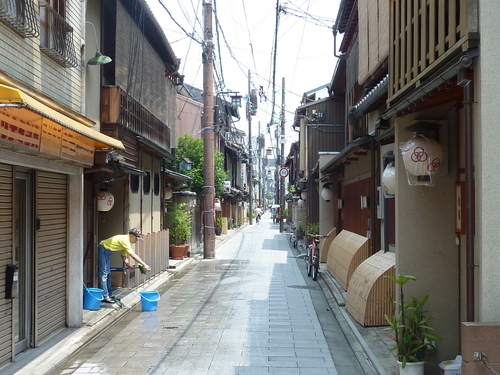 I would like to introduce some spots in Gion area today. 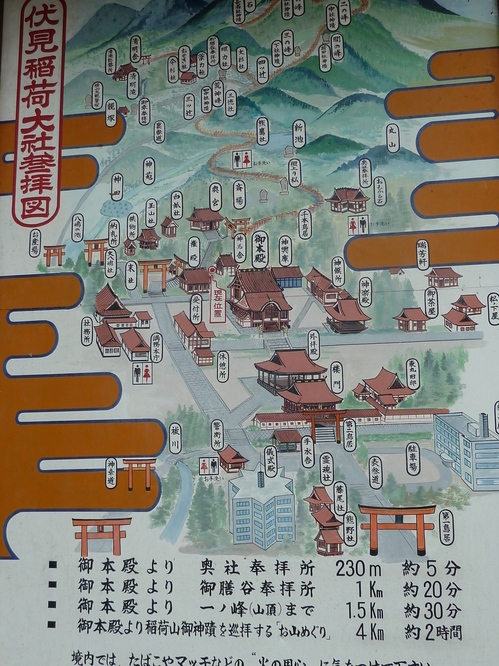 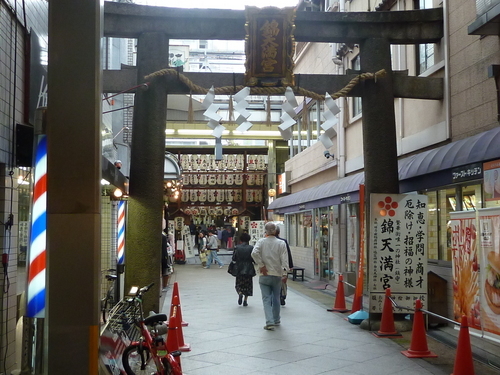 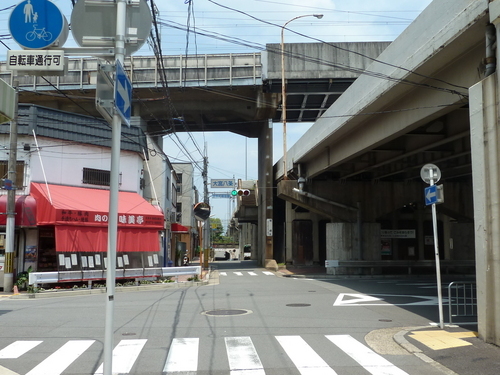 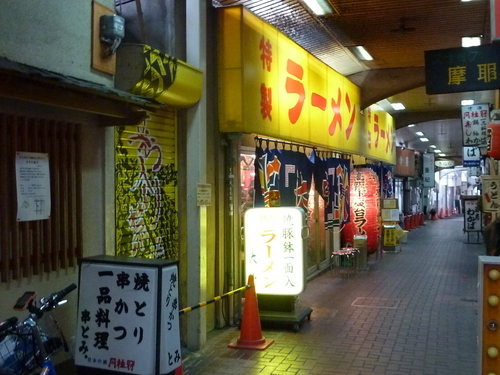 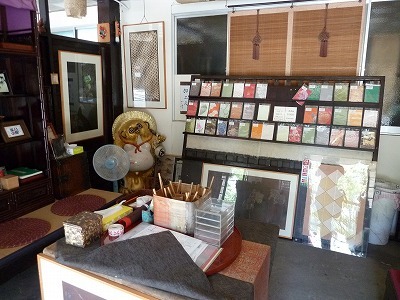 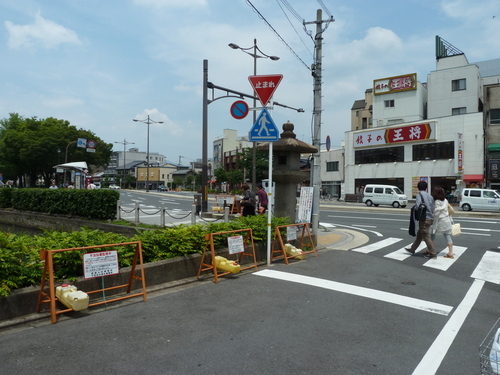 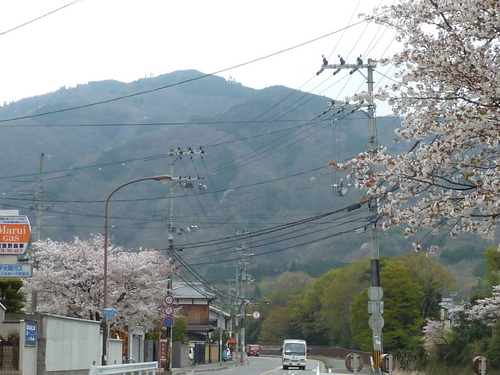 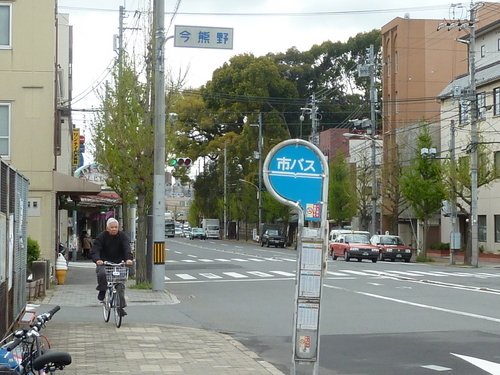 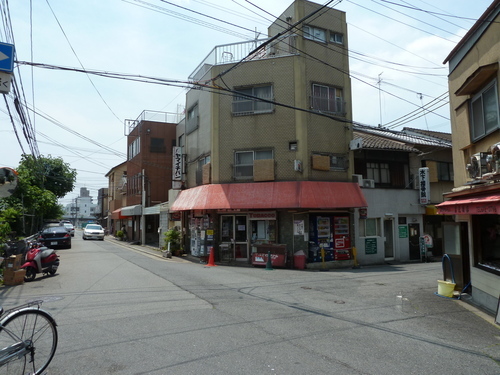 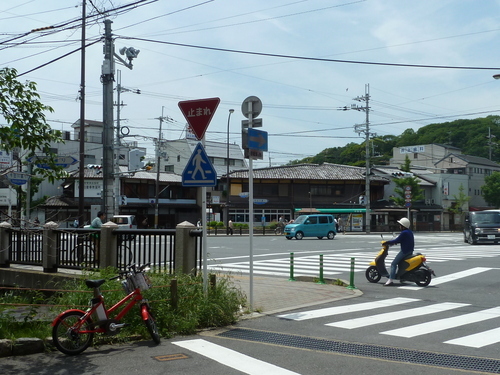 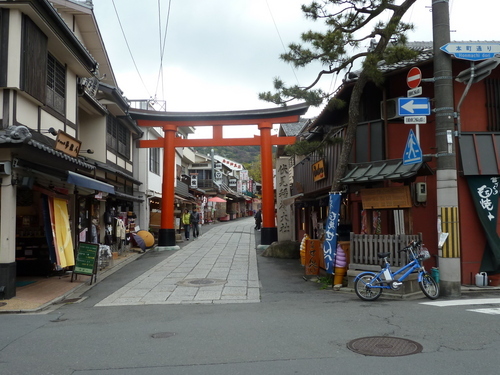 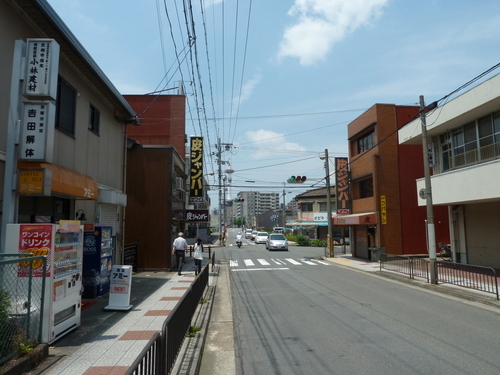 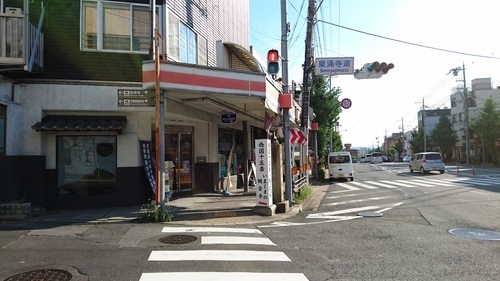 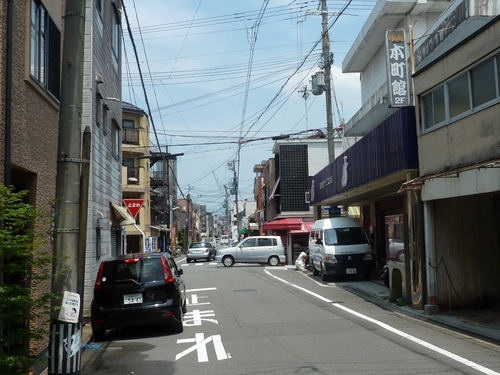 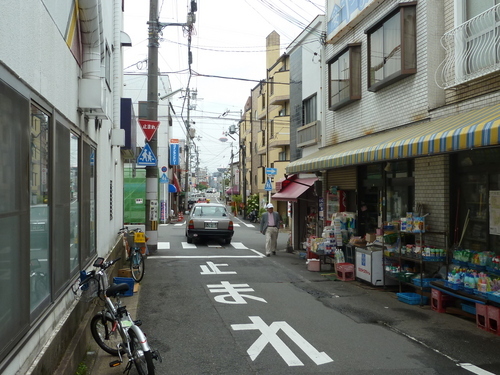 There are so many temples, shrines, shops and restaurants around there. 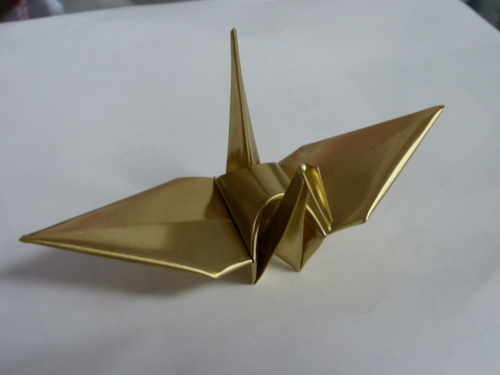 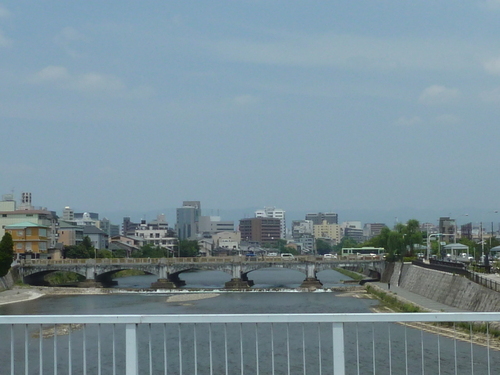 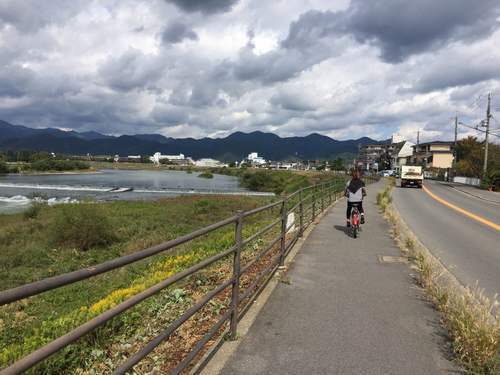 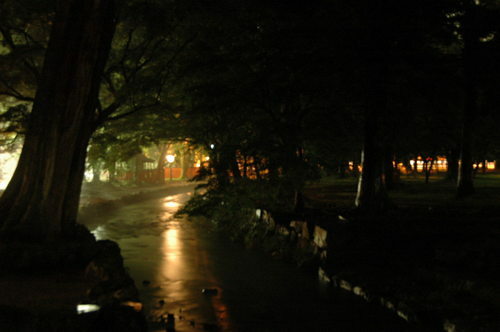 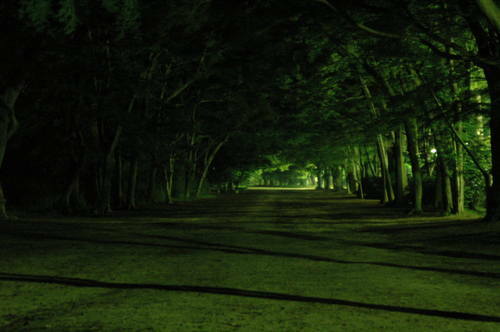 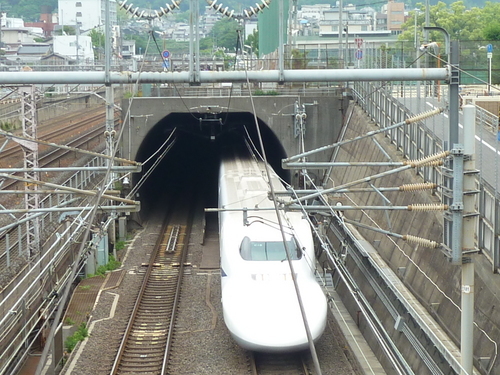 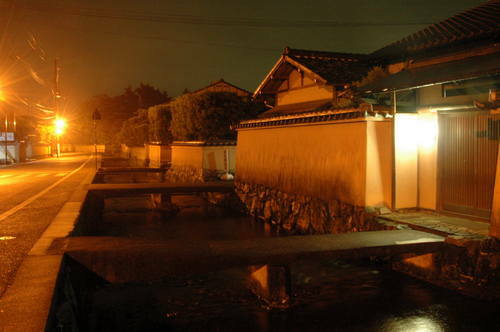 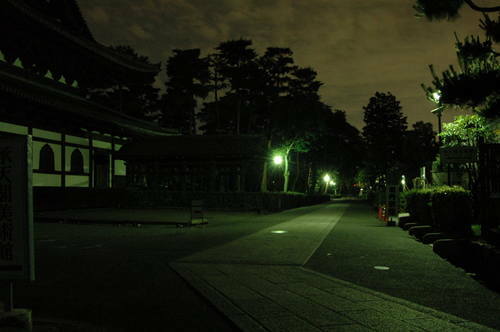 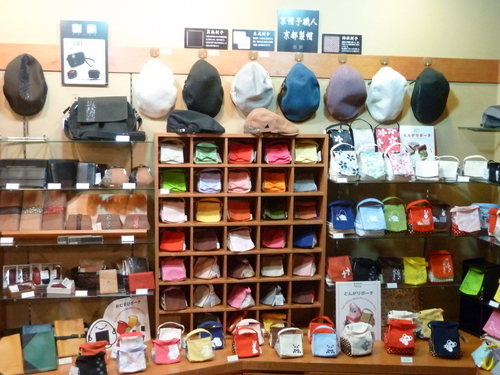 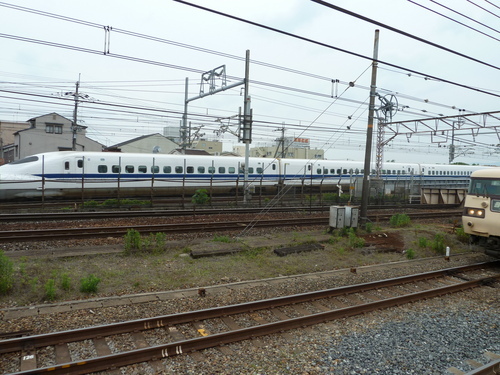 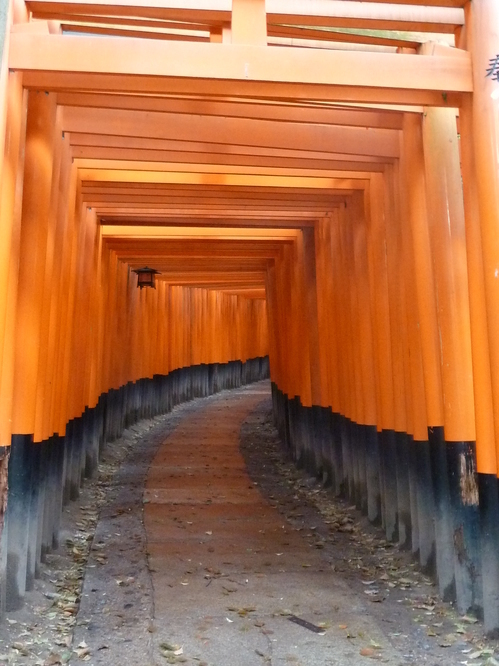 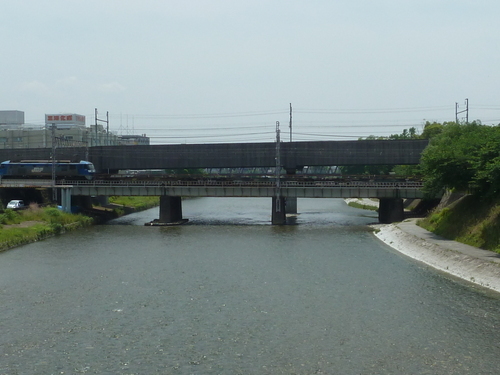 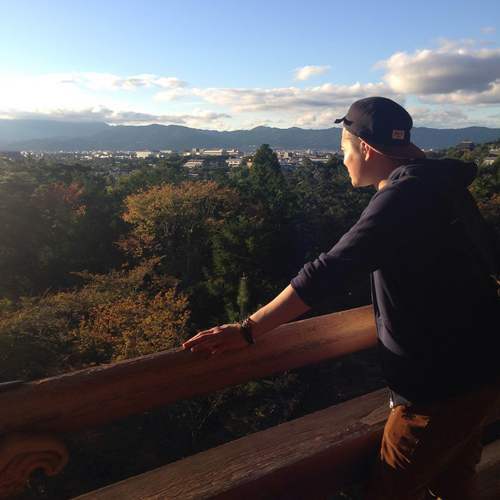 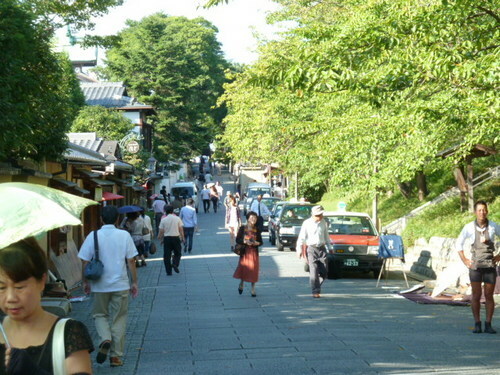 Even though I was born in Kyoto, I have never been a lot of places that are very popular for travelers. 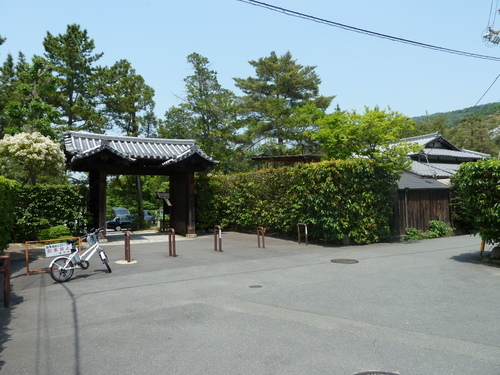 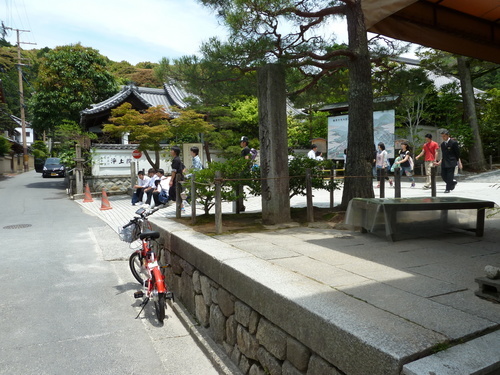 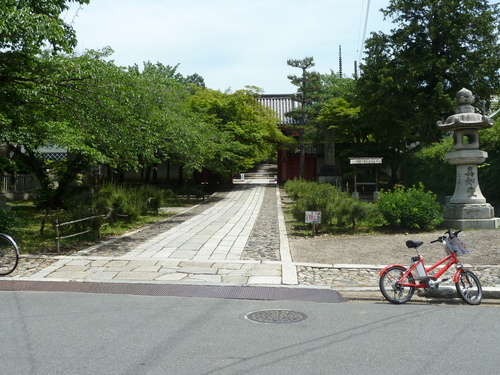 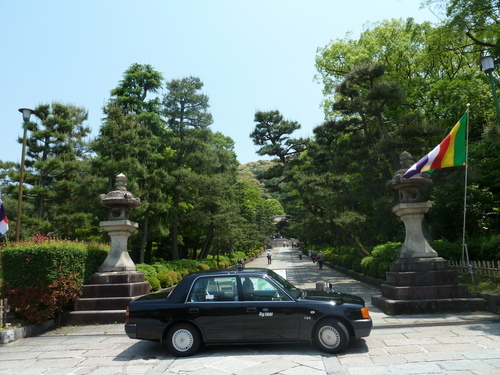 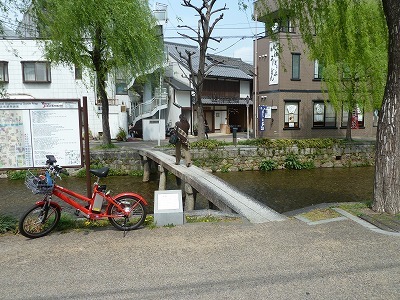 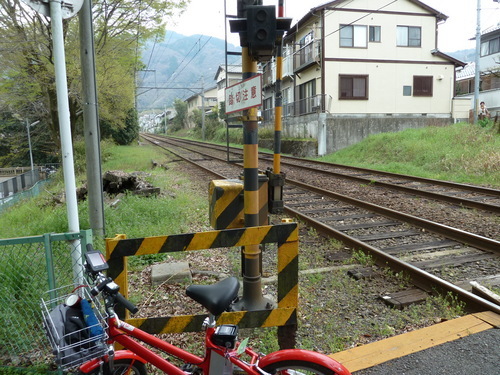 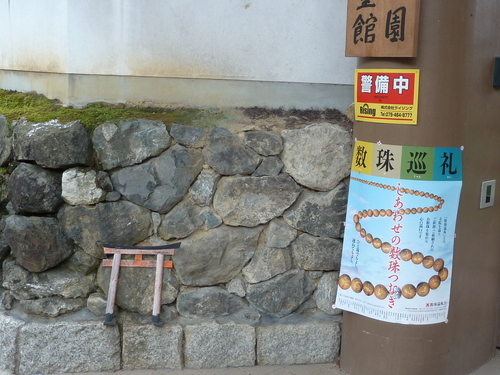 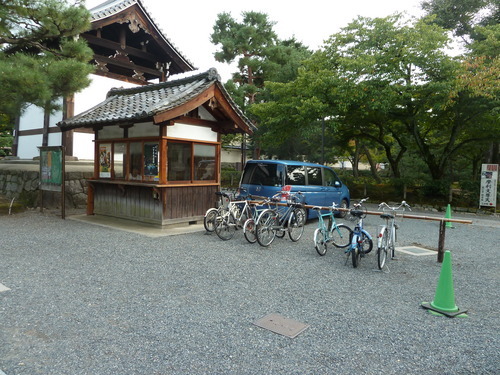 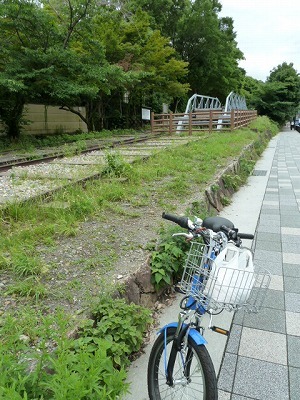 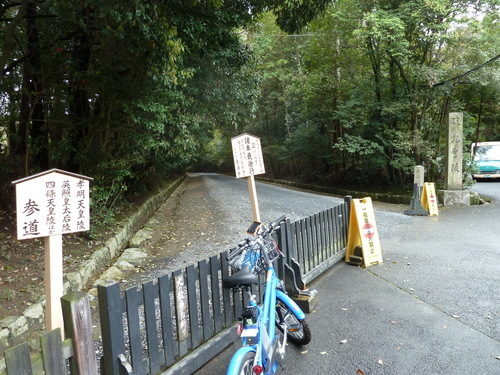 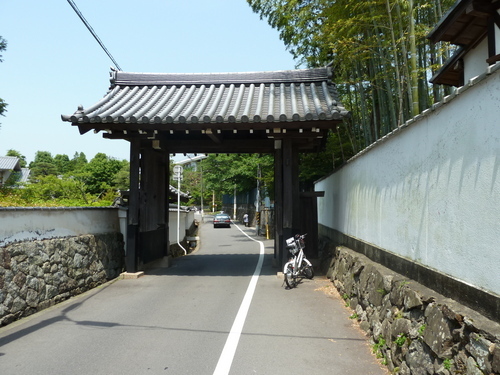 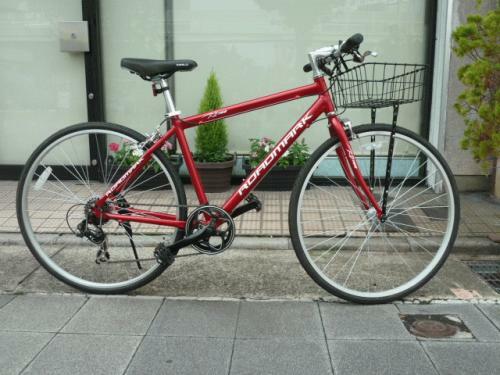 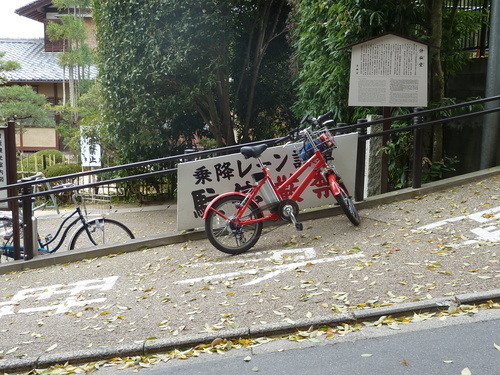 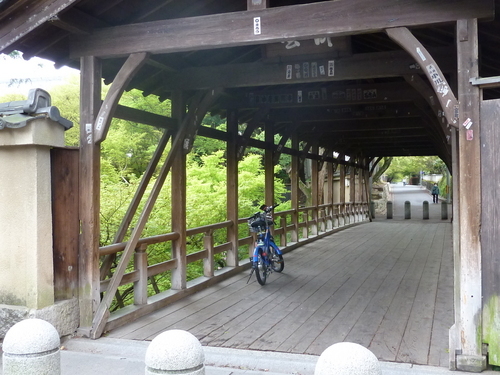 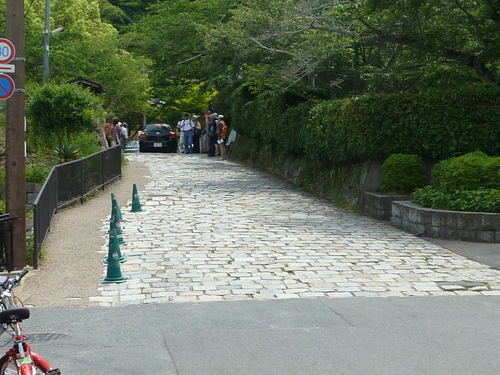 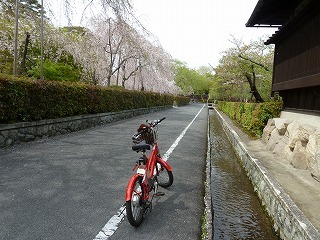 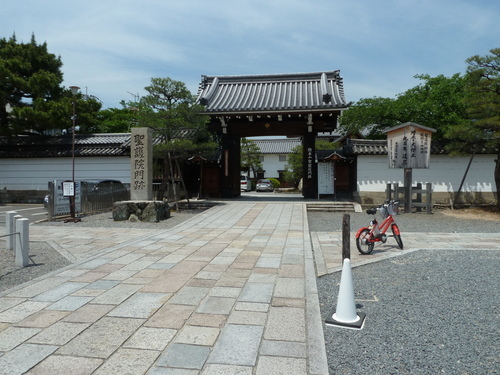 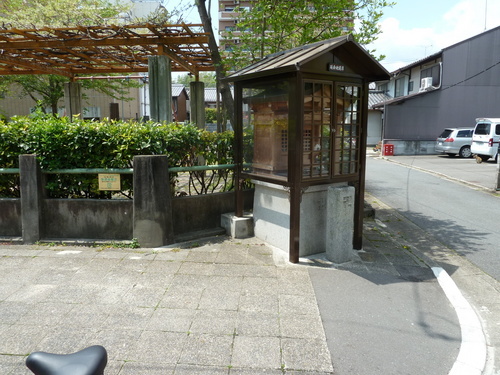 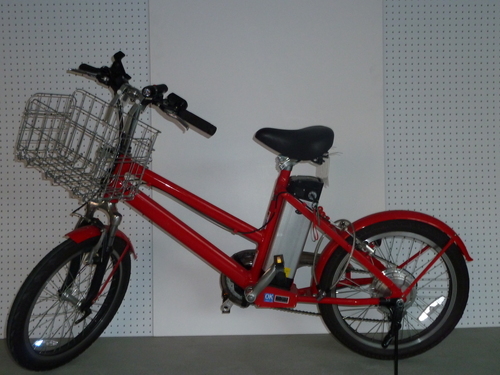 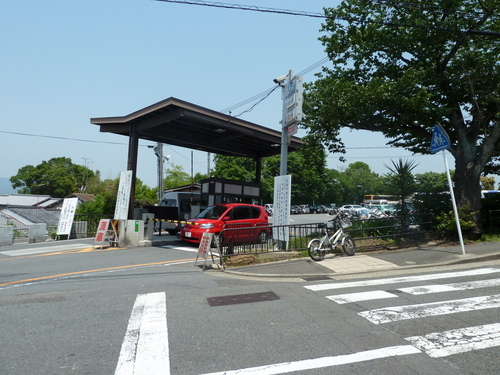 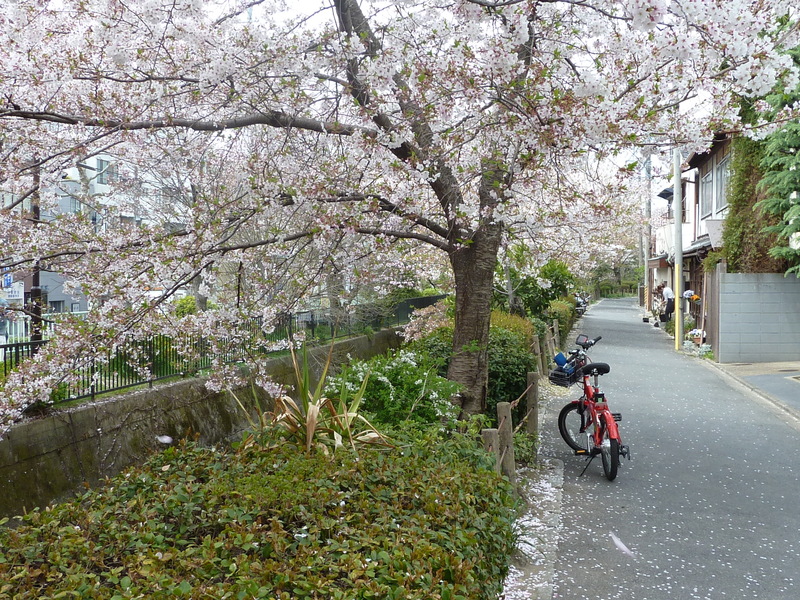 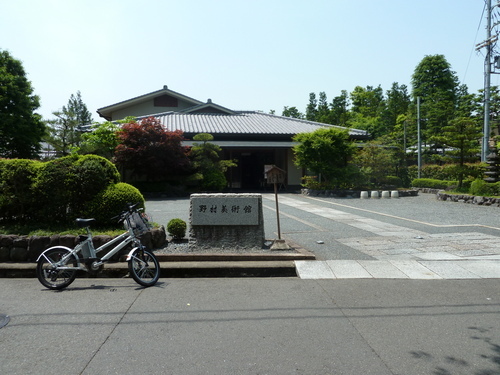 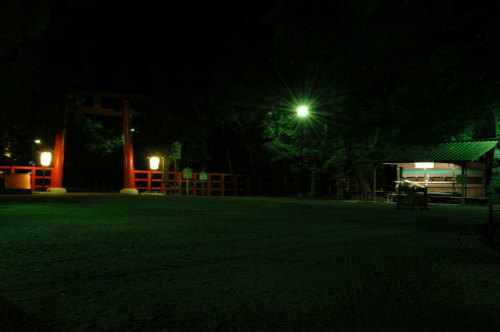 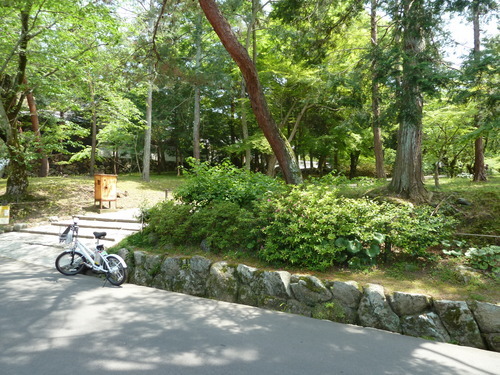 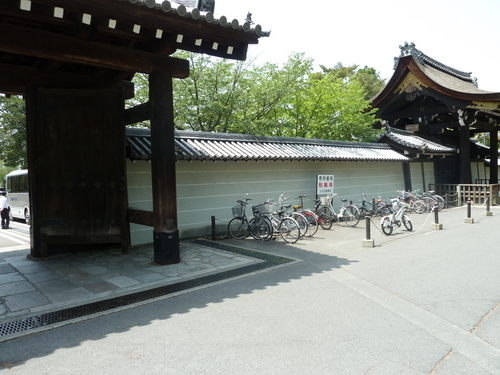 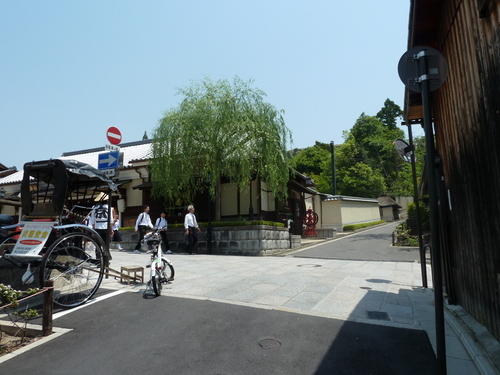 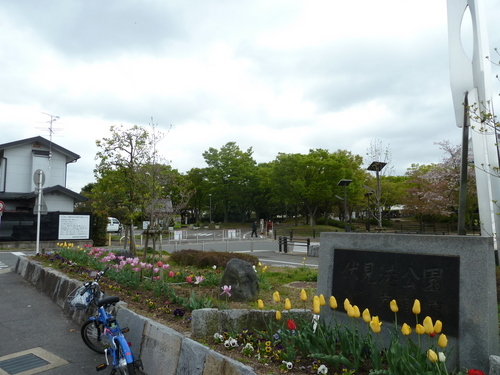 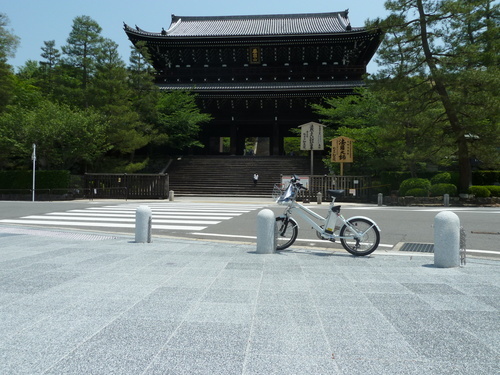 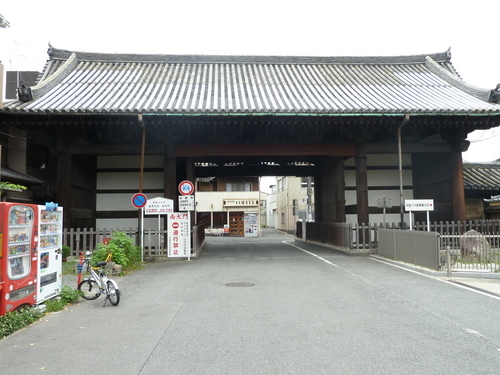 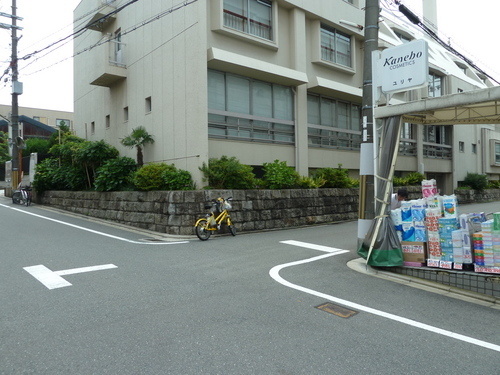 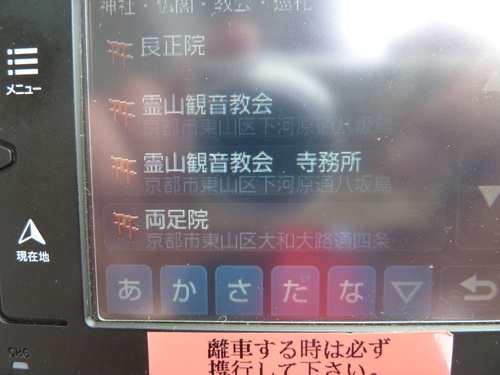 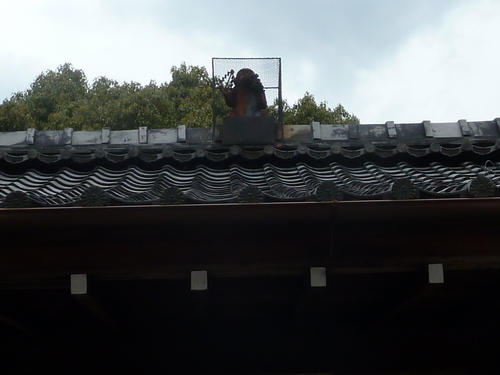 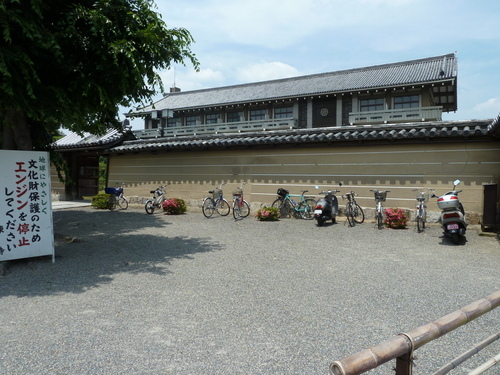 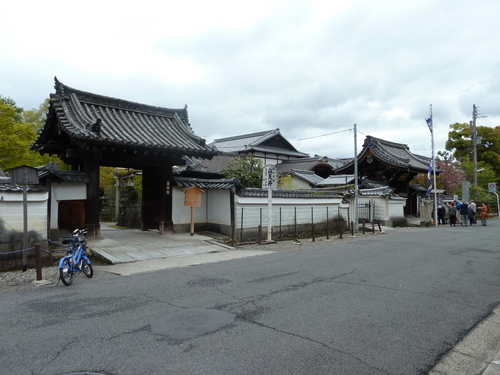 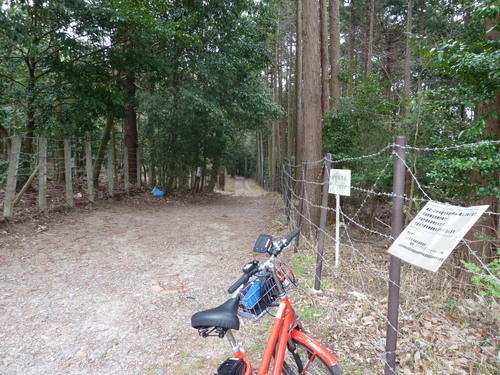 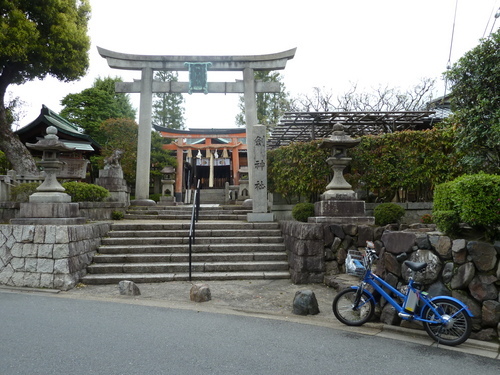 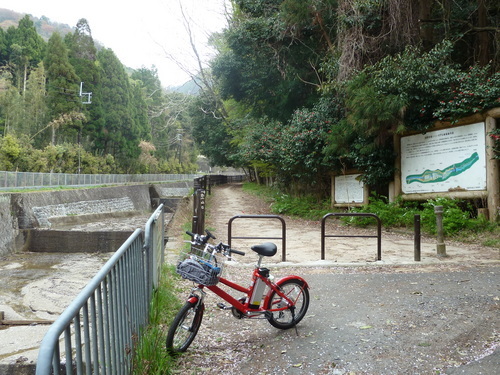 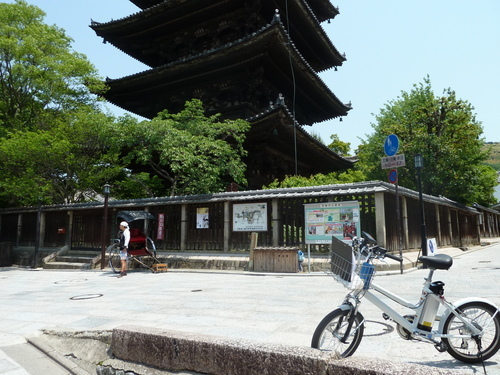 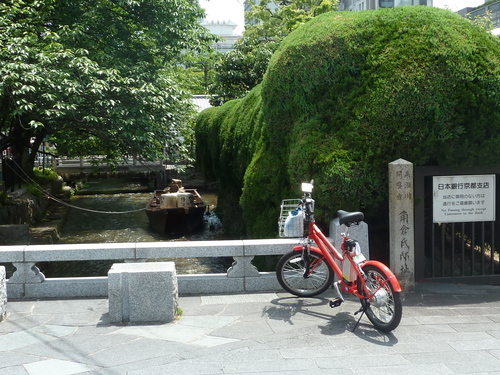 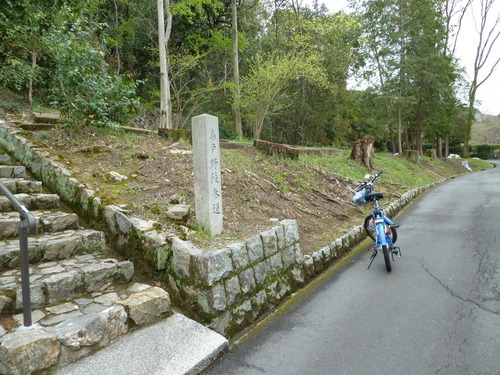 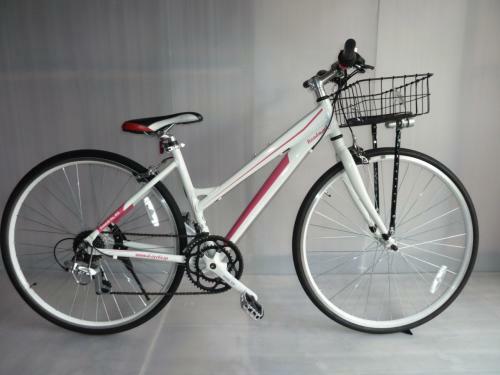 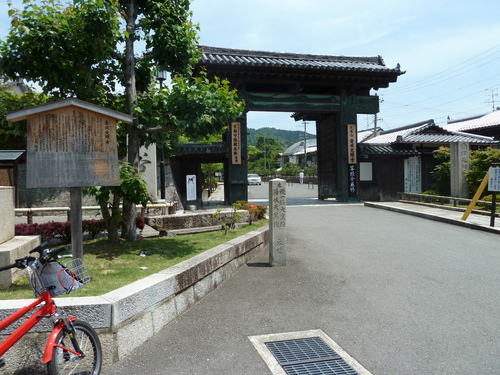 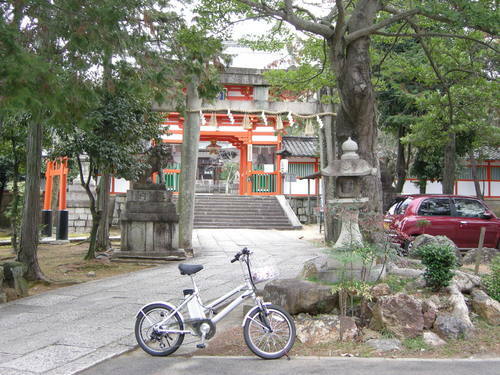 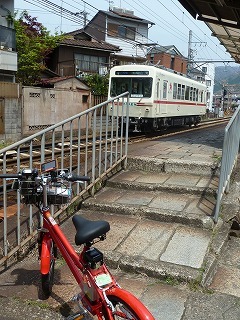 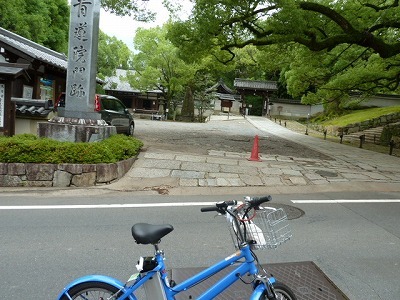 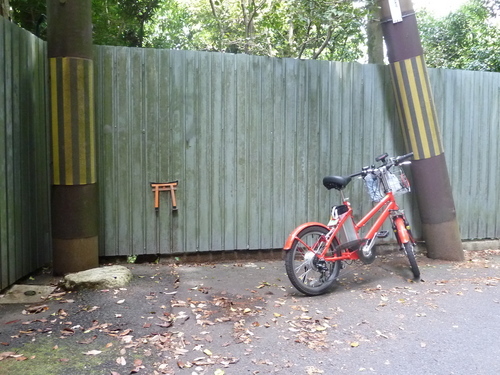 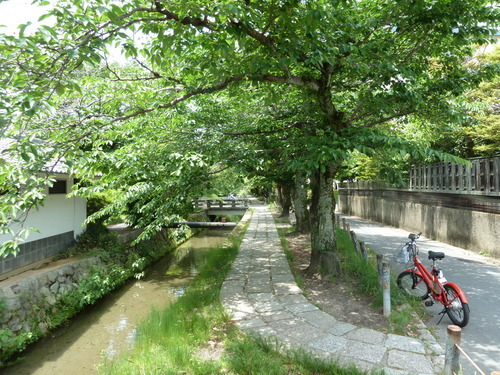 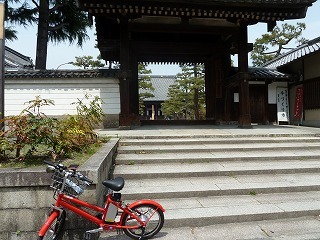 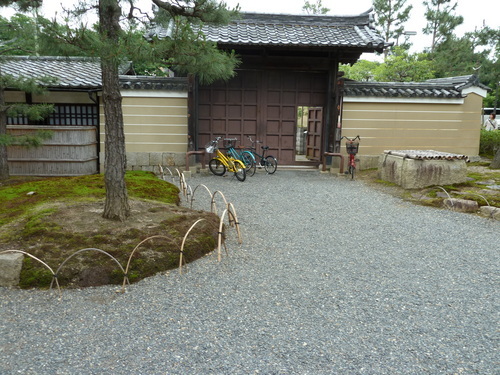 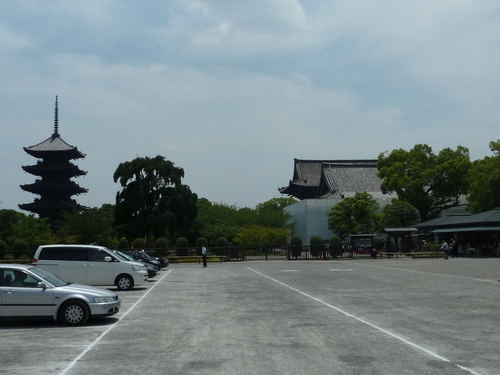 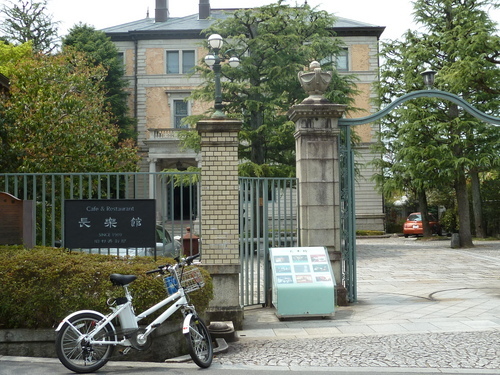 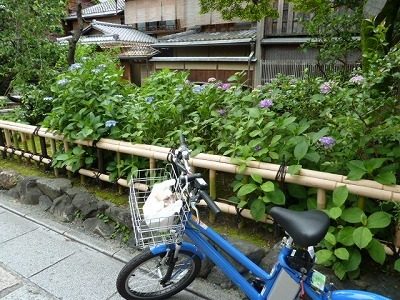 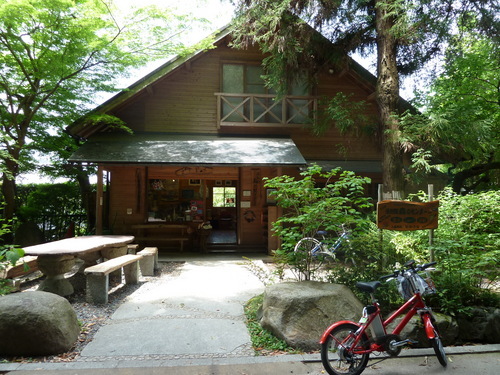 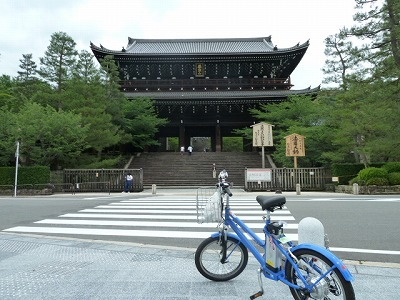 I parked bike at Kenninji temple for free. 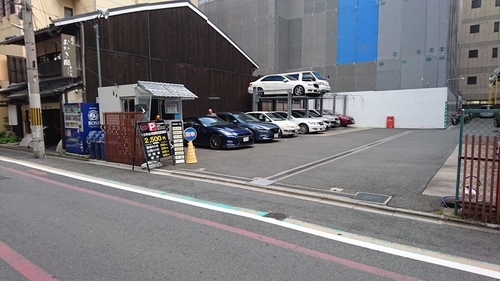 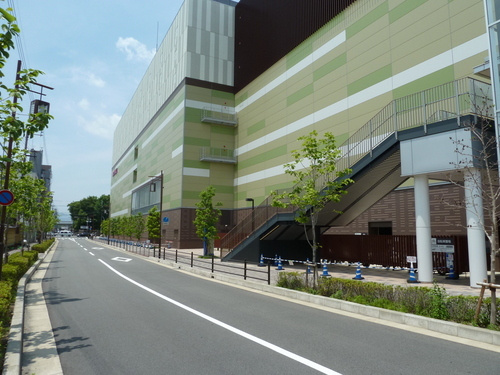 Parking area is opened all day. 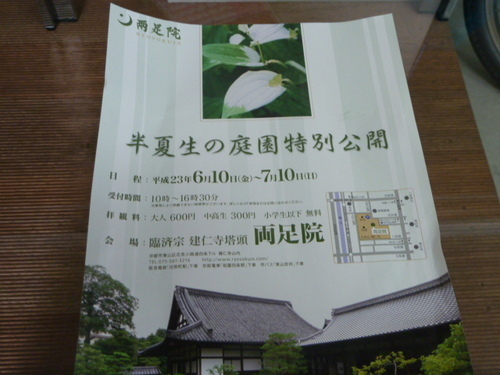 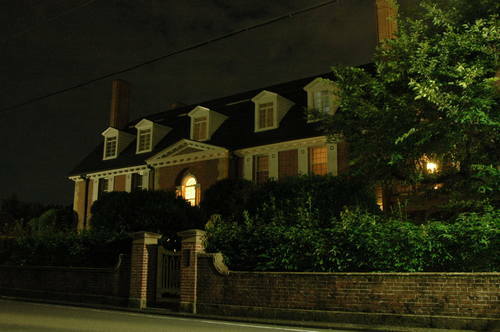 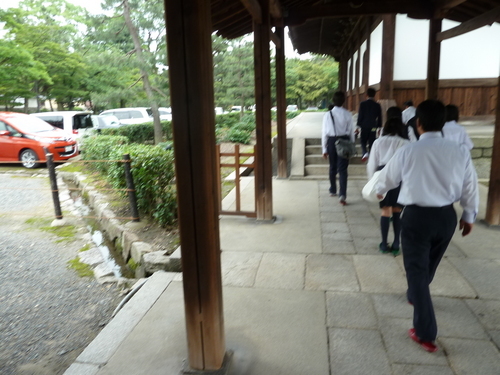 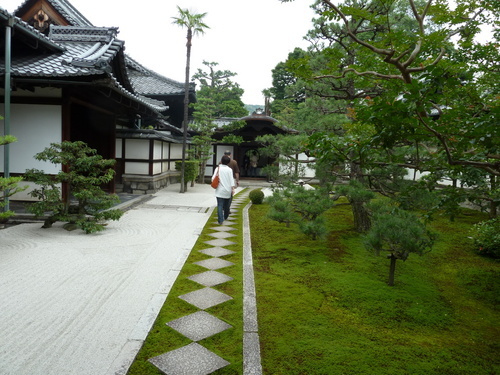 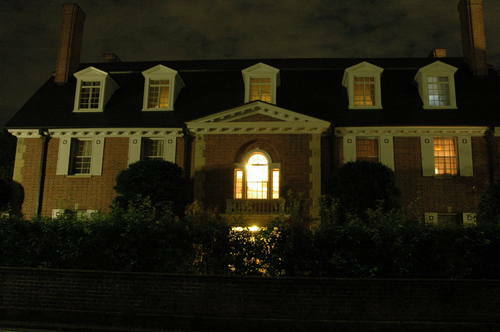 This time I entered main building to see famous pictures and gardens. 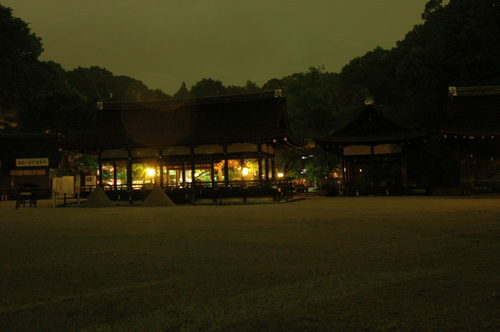 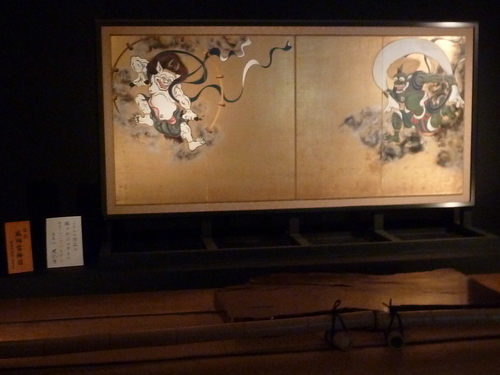 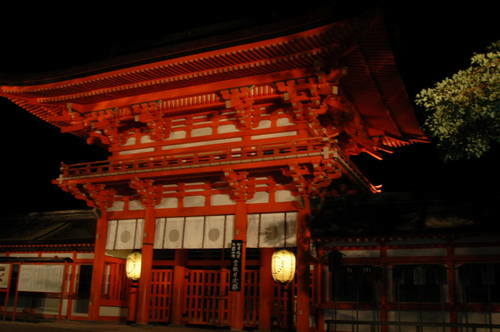 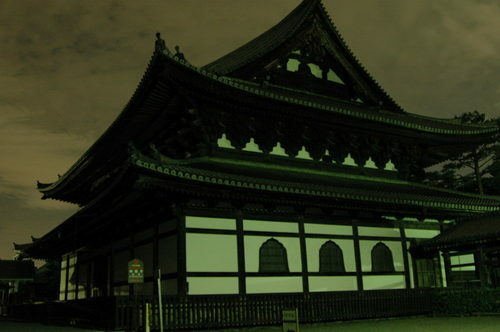 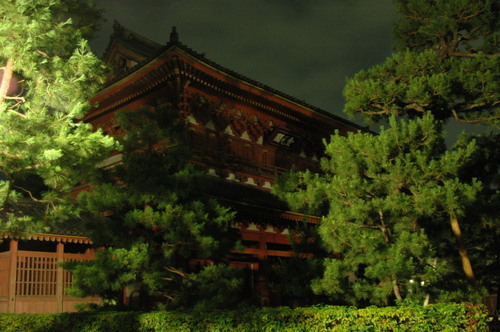 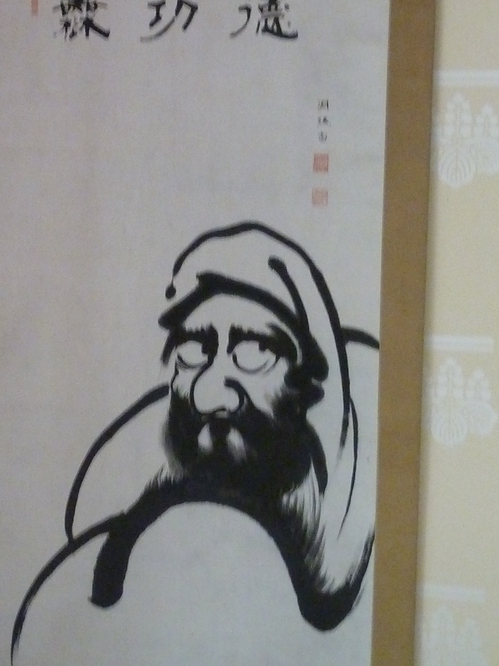 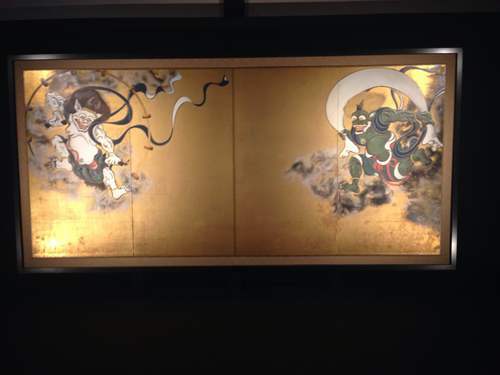 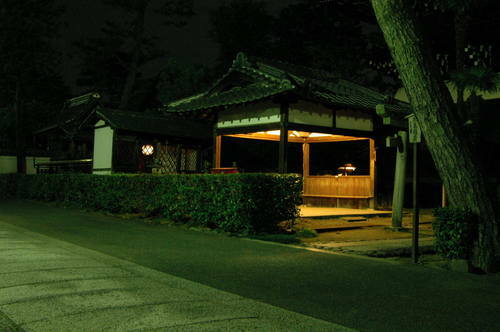 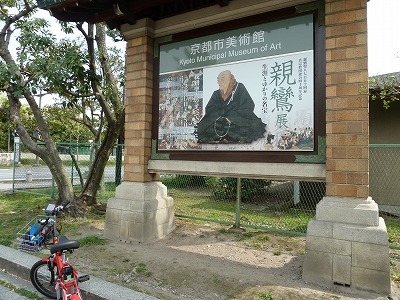 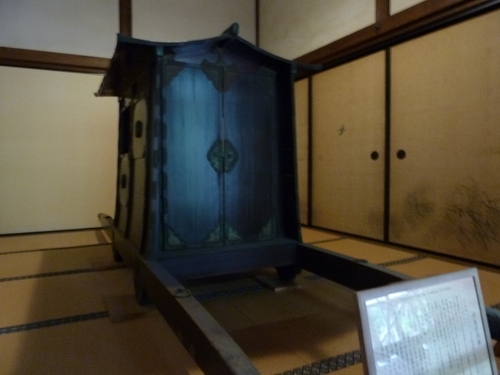 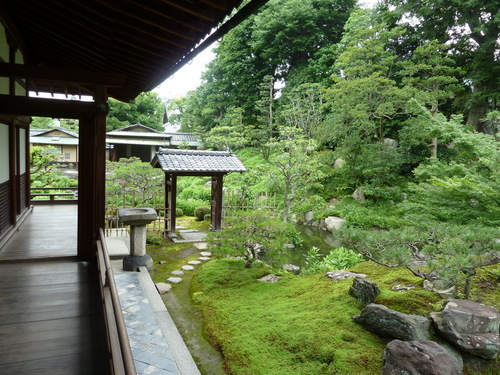 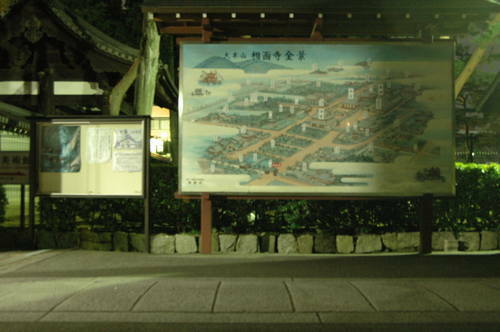 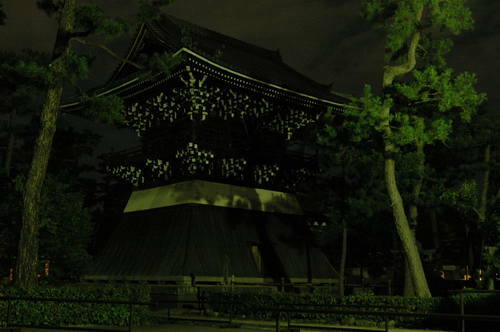 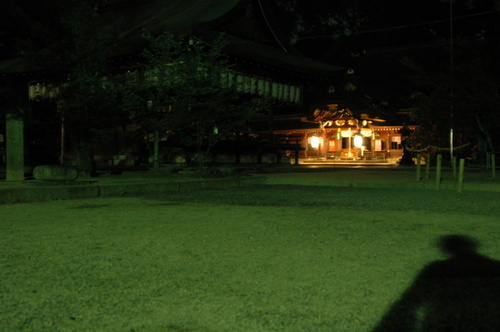 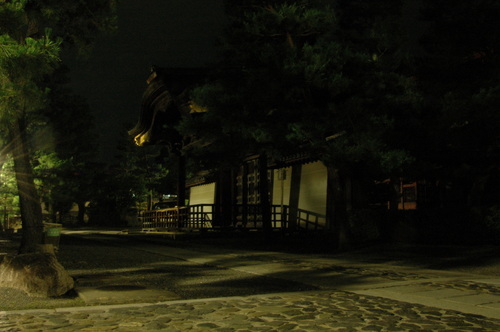 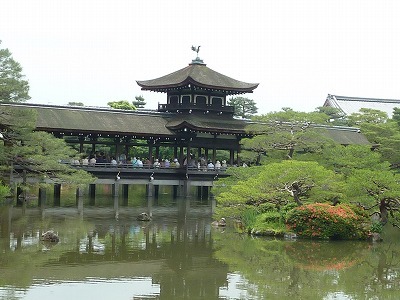 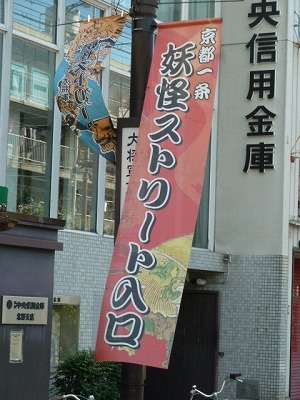 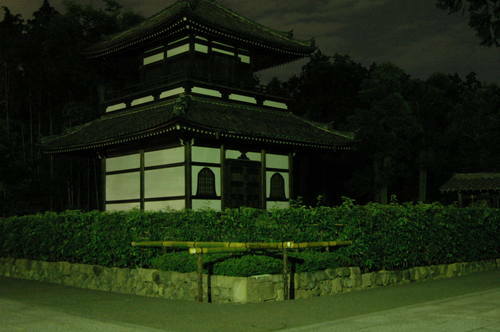 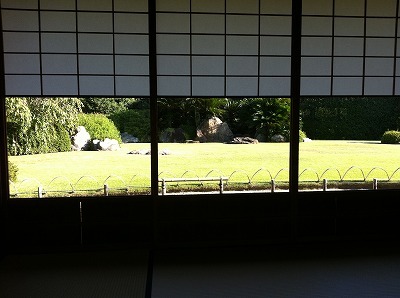 Fujin and Raijin , a pair of two-fold screens is one of the famous paintings in Kyoto. 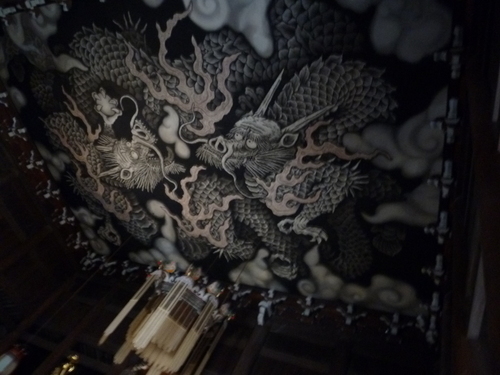 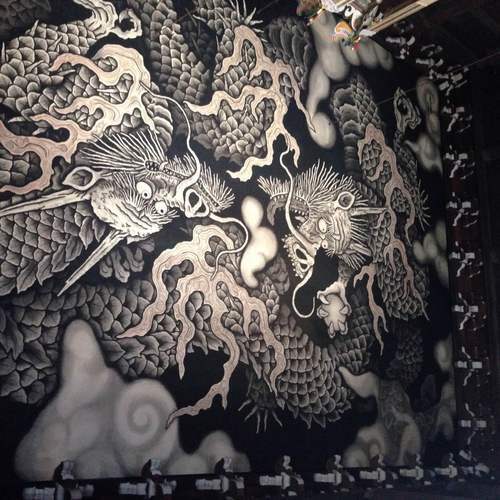 For the temple's 800th anniversary, a dramatic ceiling painting of two dragons was painted. 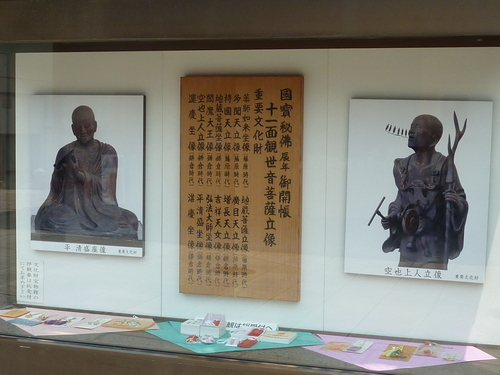 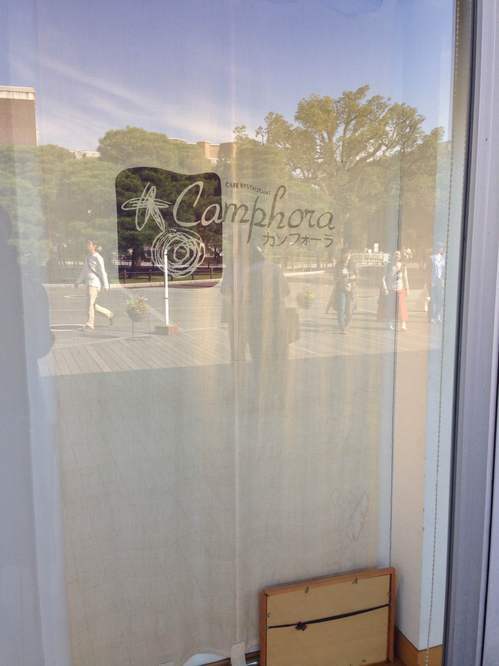 I could feel that it had so many meaning of buddism. 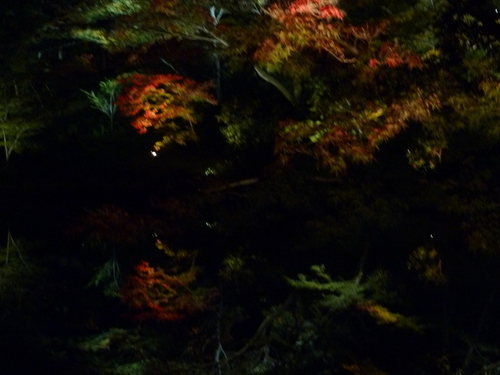 You might be speechless. 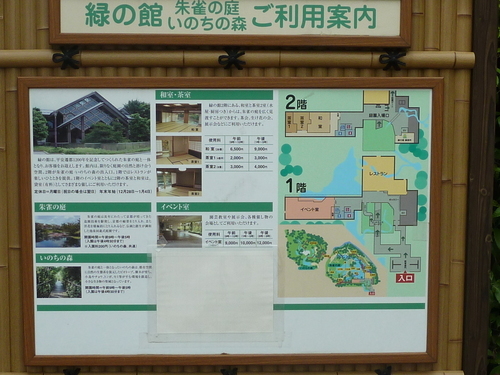 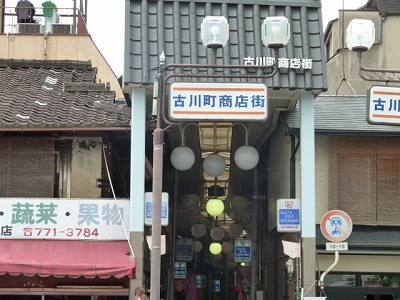 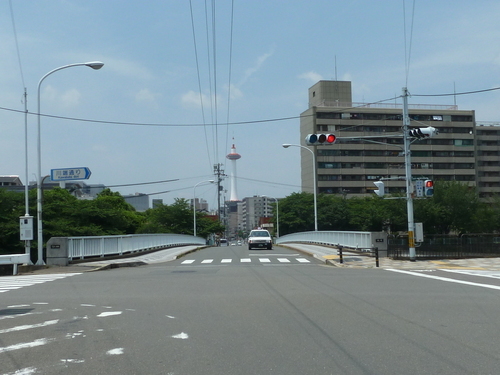 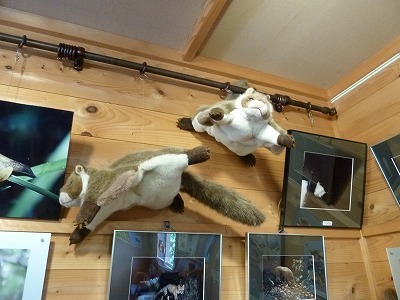 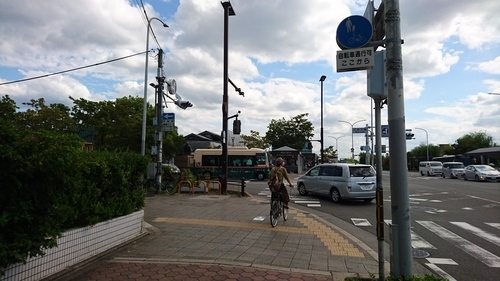 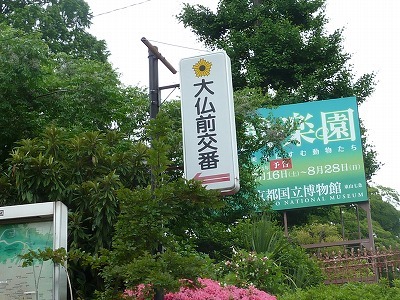 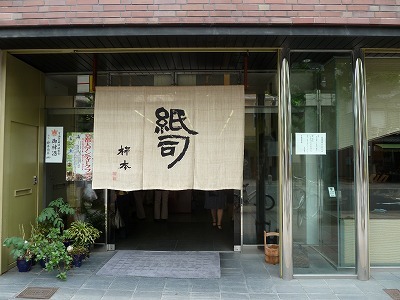 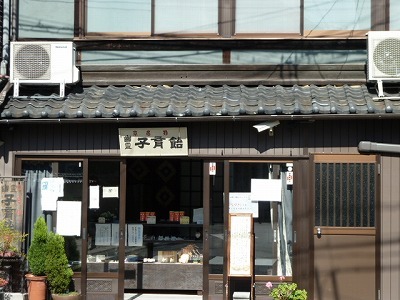 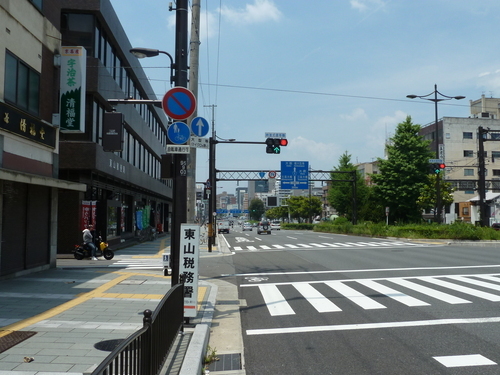 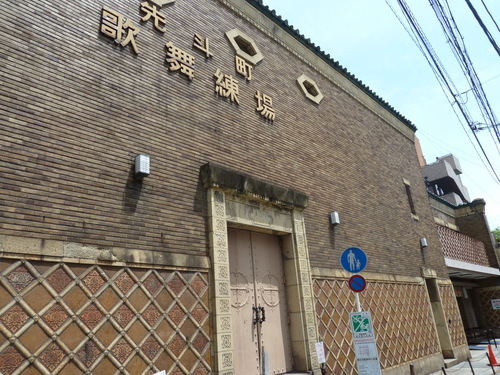 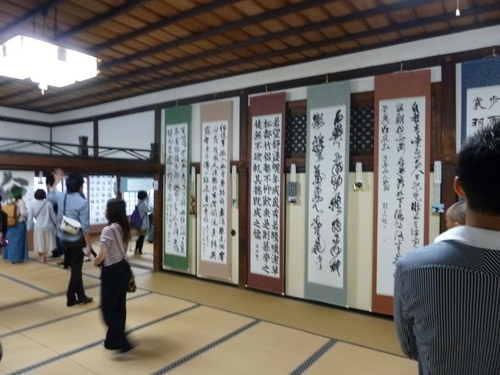 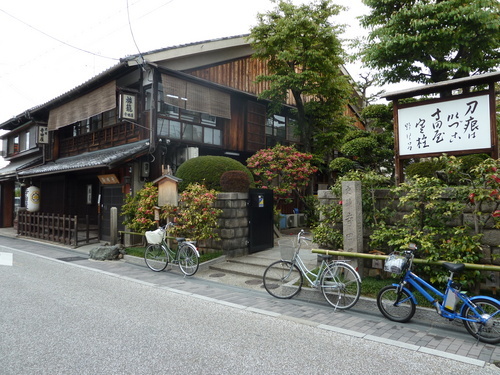 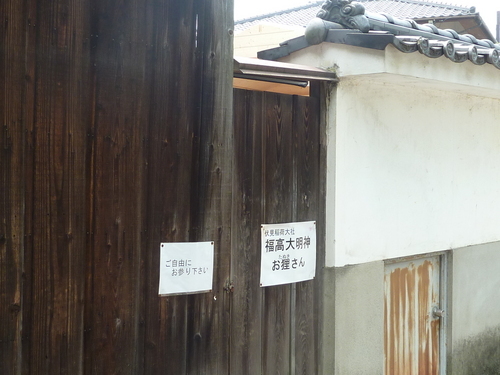 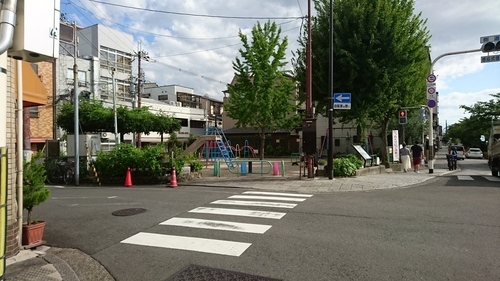 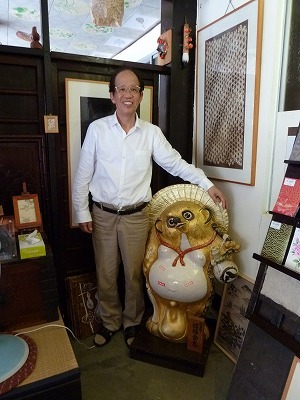 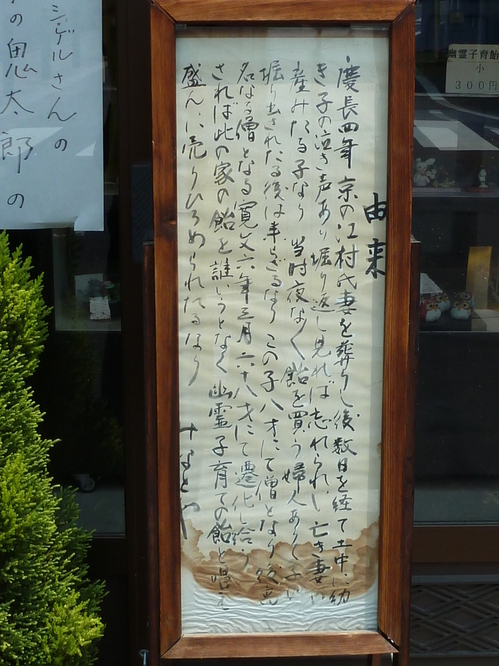 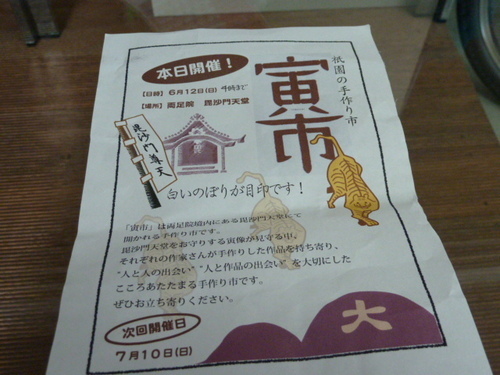 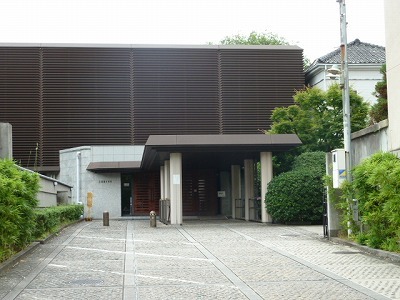 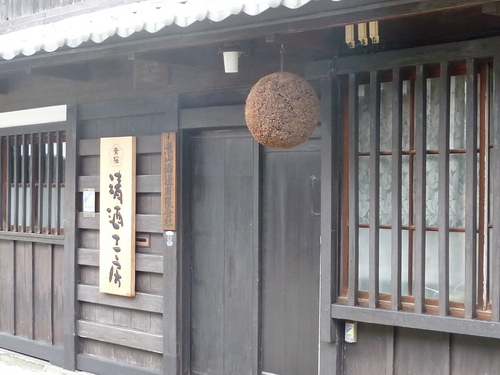 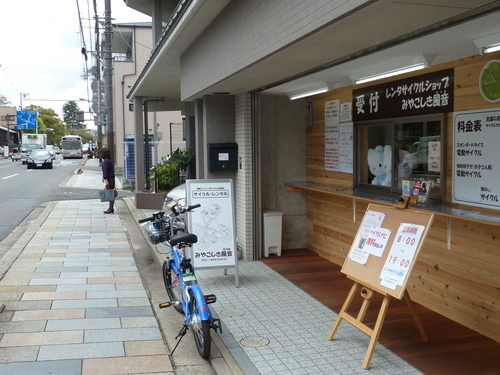 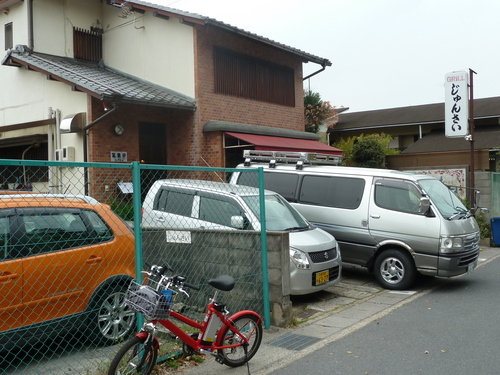 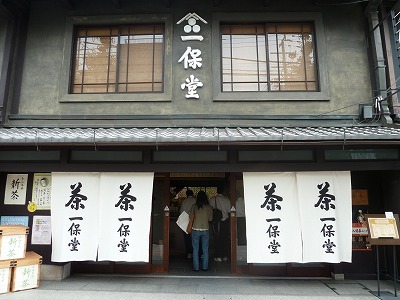 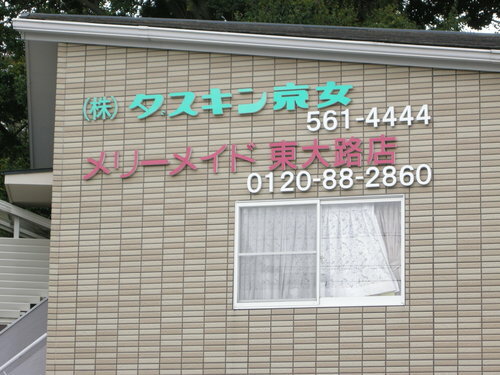 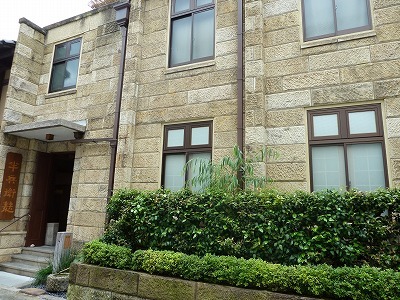 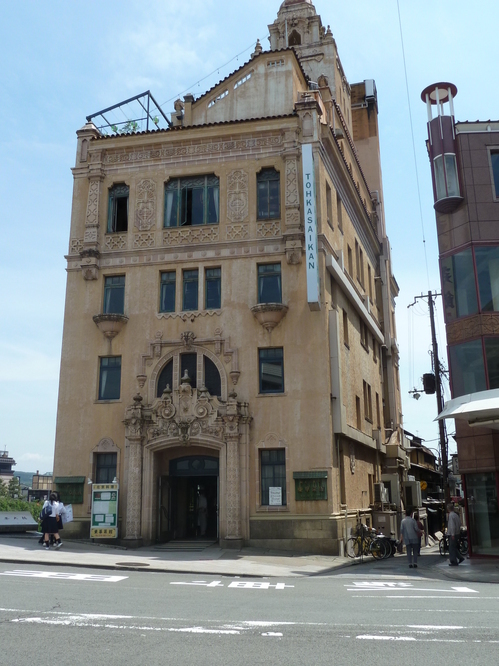 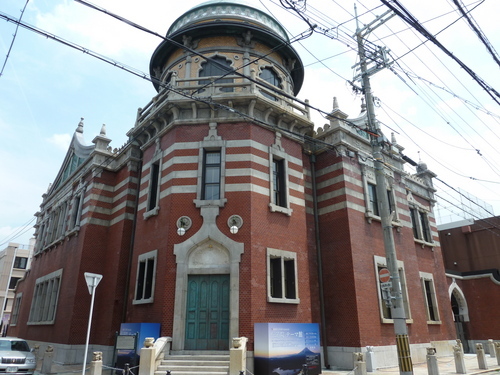 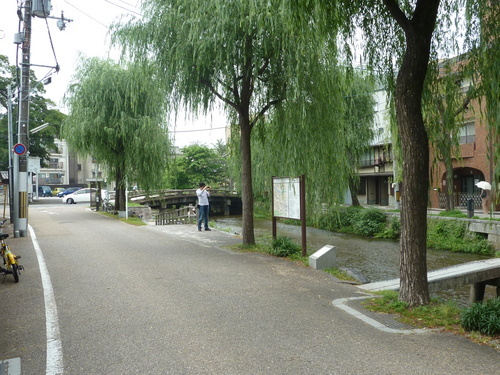 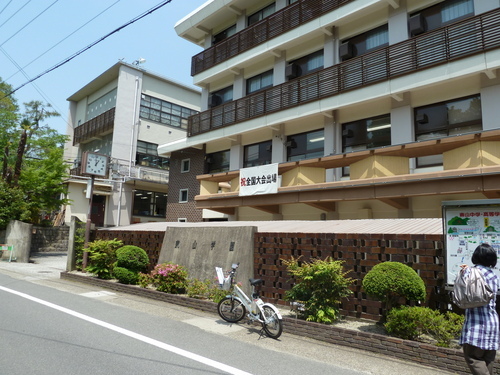 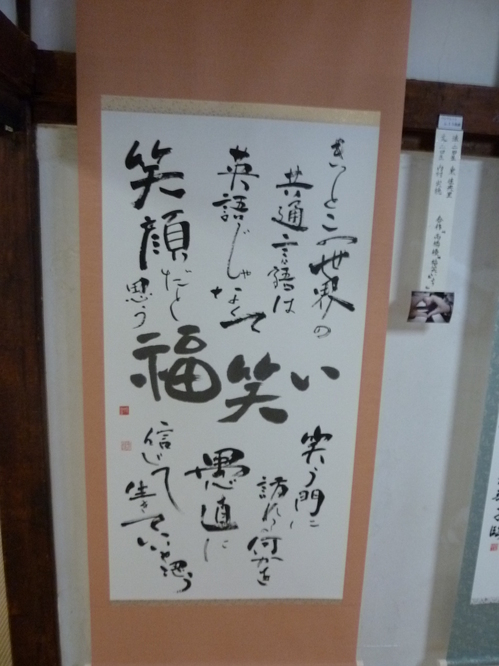 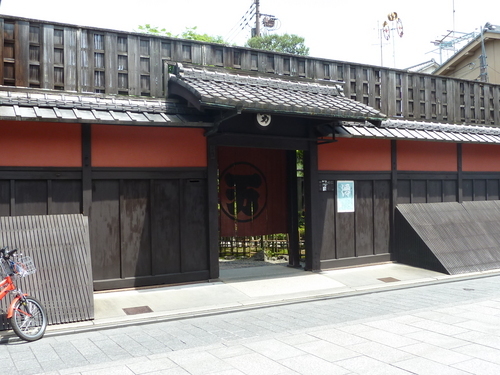 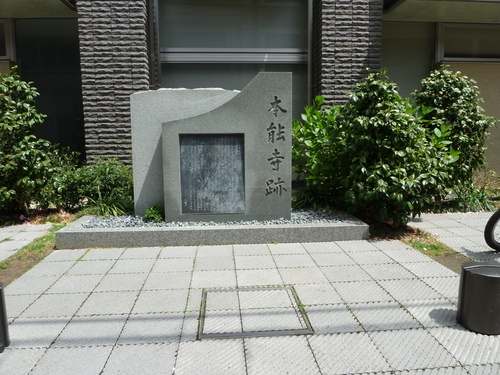 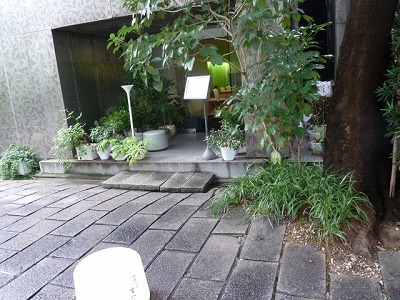 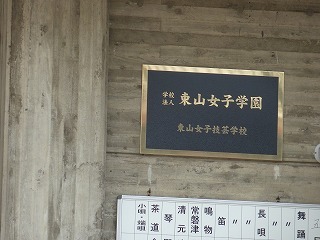 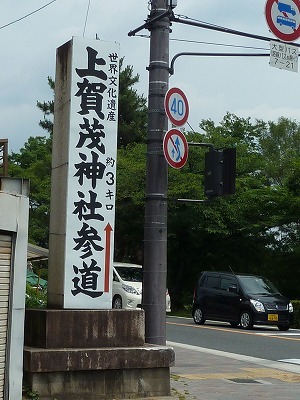 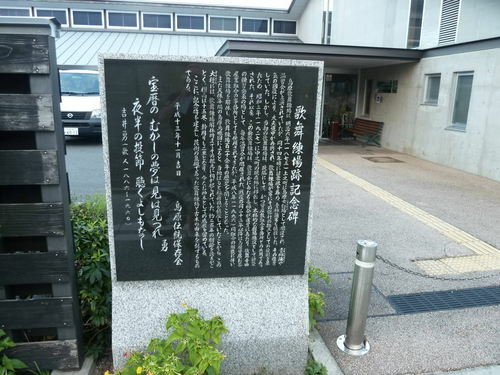 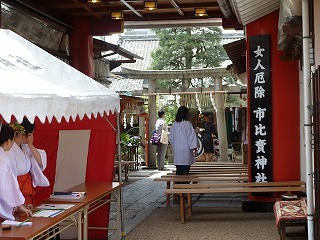 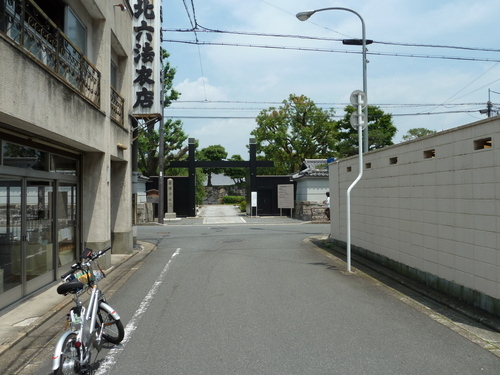 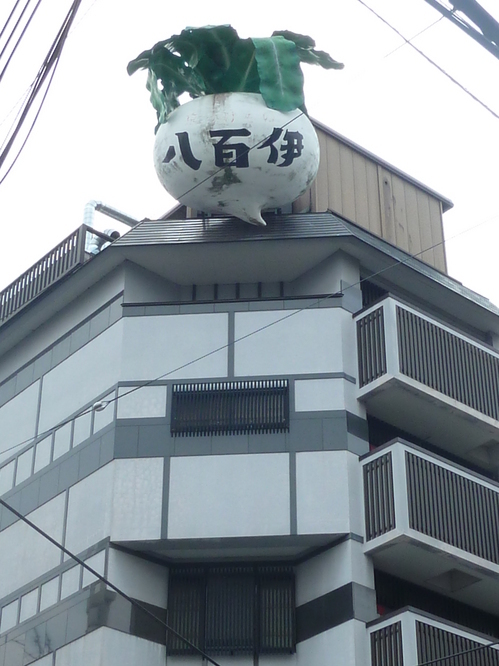 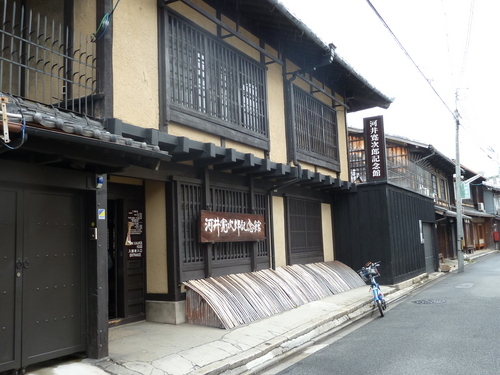 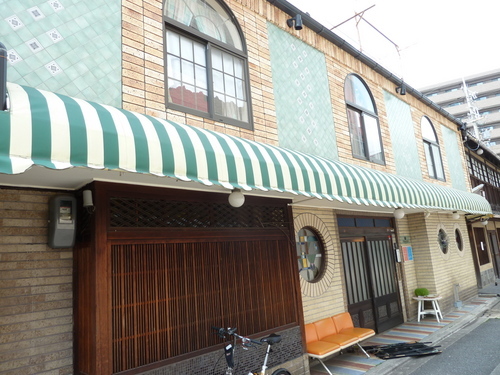 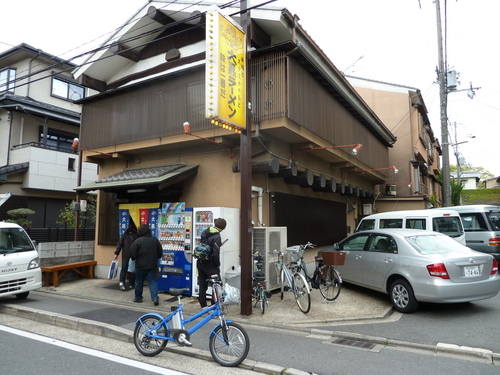 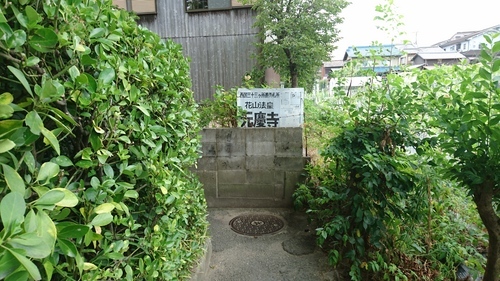 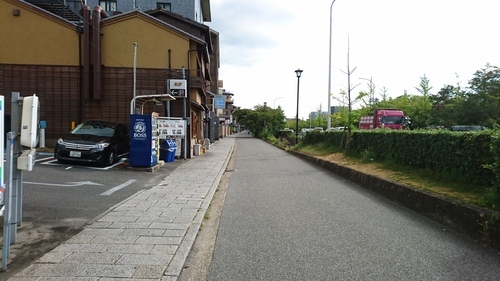 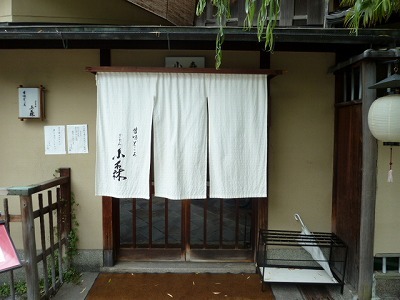 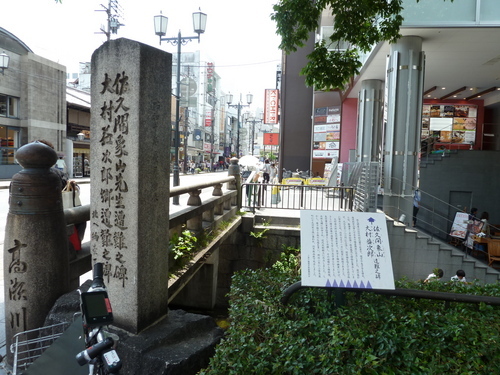 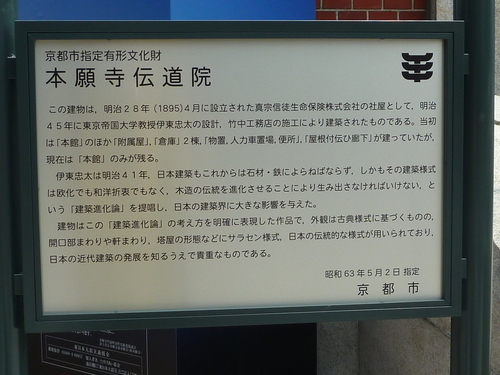 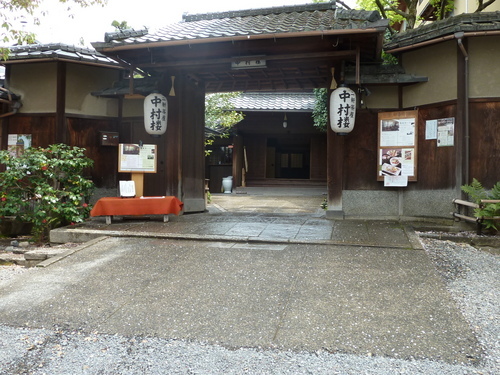 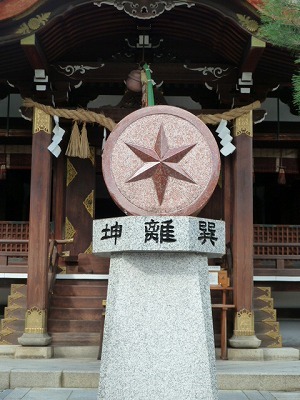 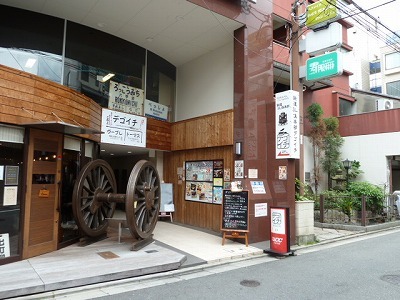 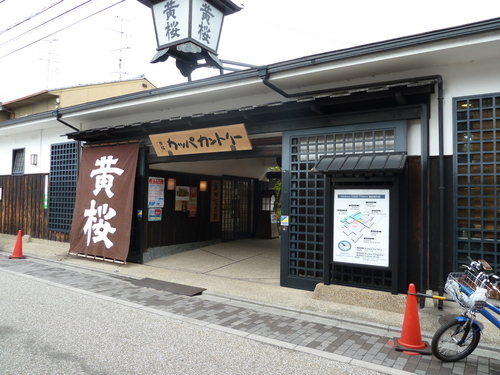 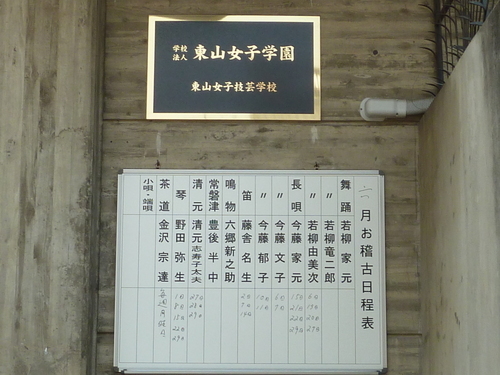 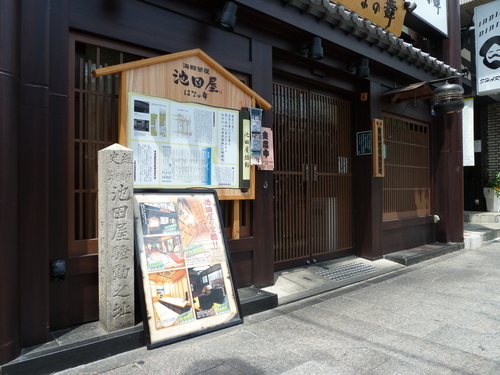 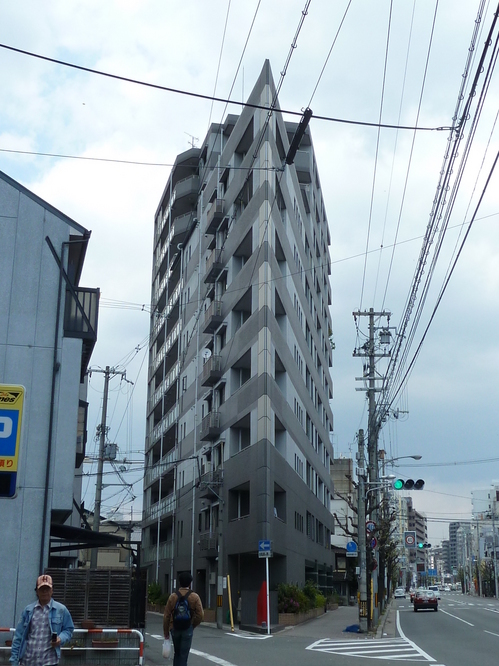 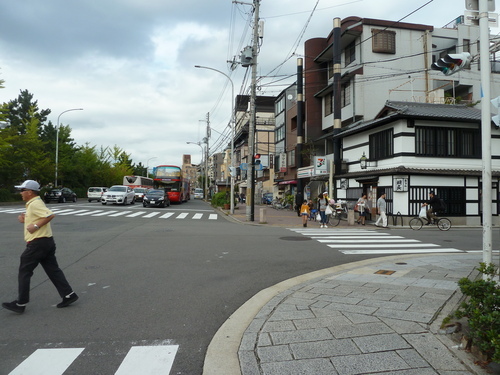 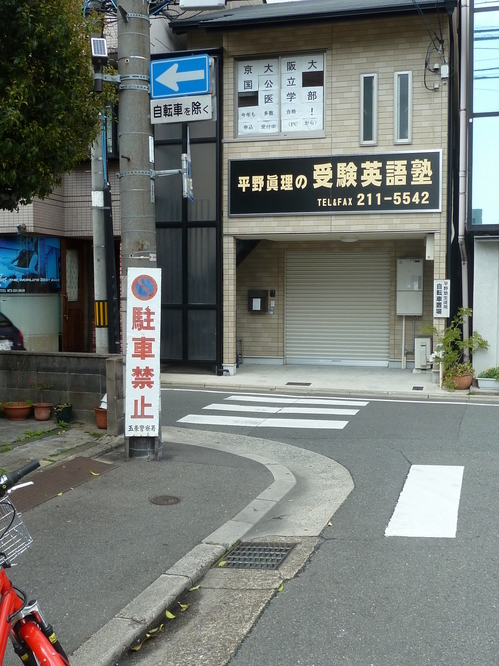 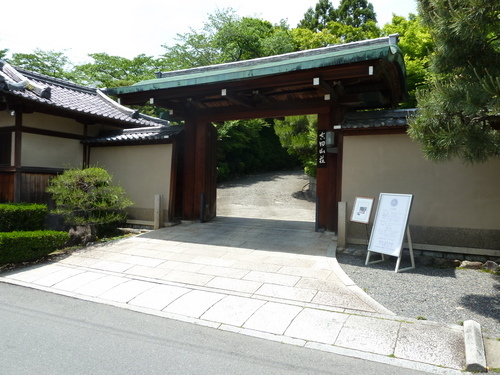 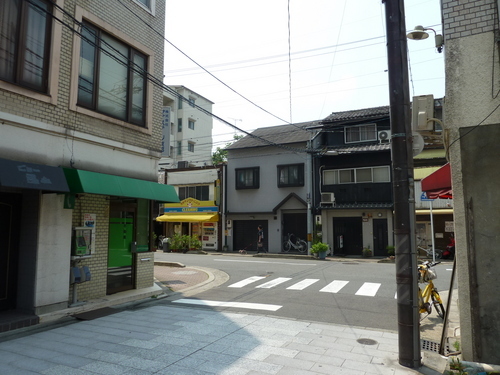 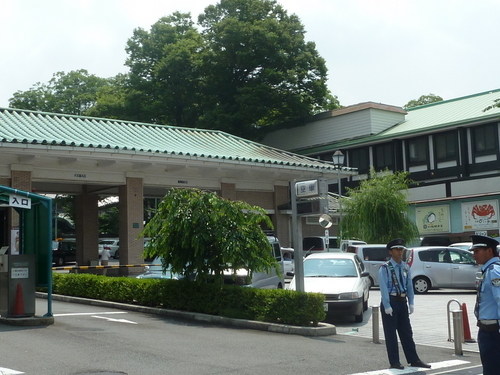 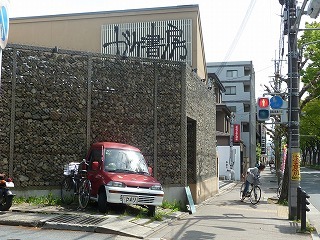 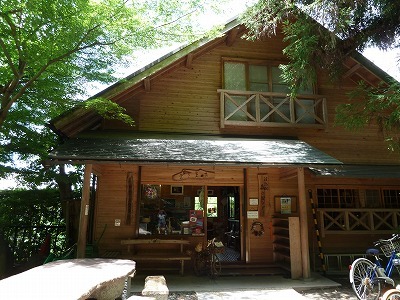 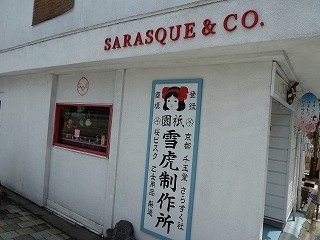 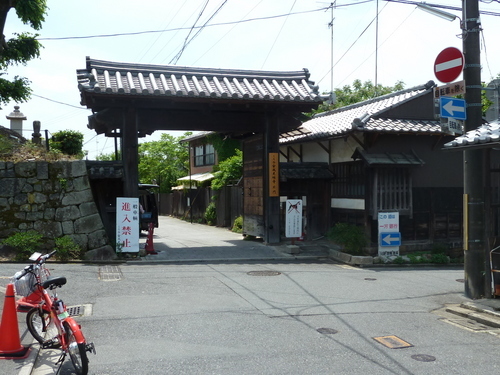 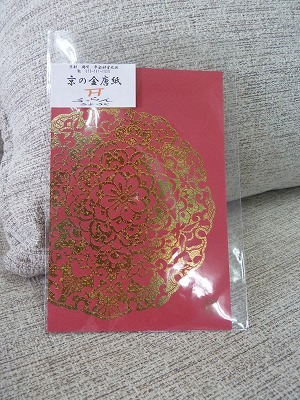 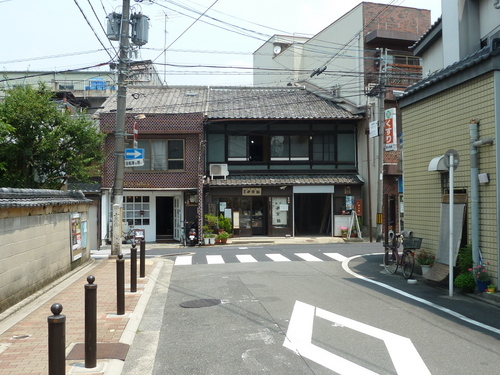 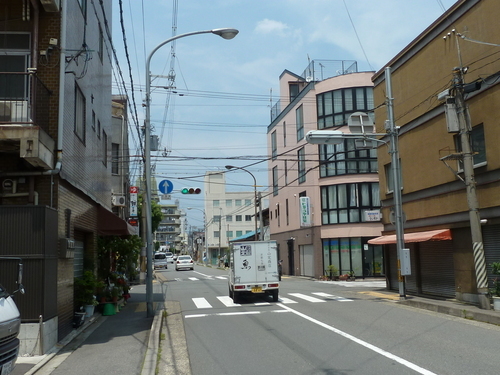 Then I visited Yasui konpiraguu which is famous for divorcement and matchmaking. 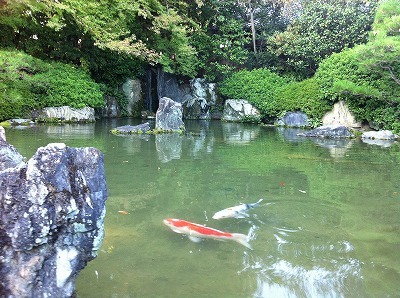 If you go through the hole in the rock you have all negative influences cleaned away then when you come back through you make a wish and good influences will low to you. 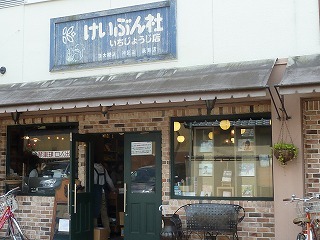 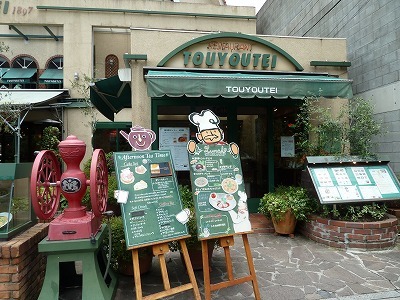 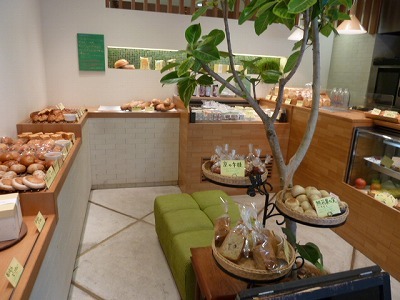 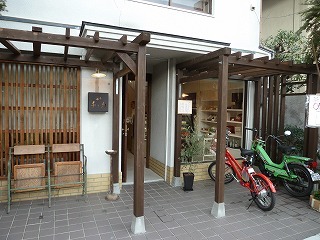 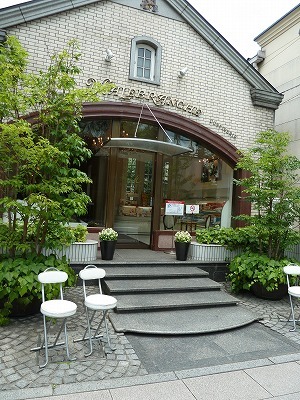 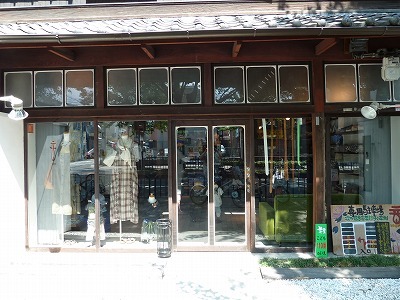 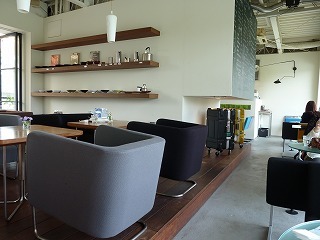 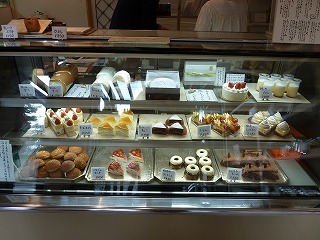 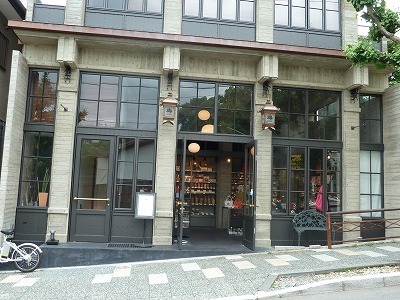 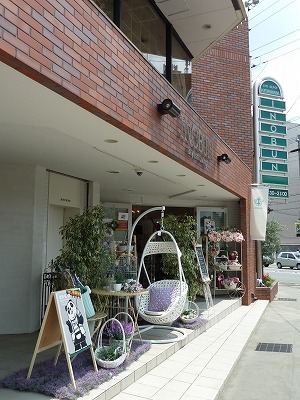 After 2 places I went to Tokuya which is Japanese sweets cafe. 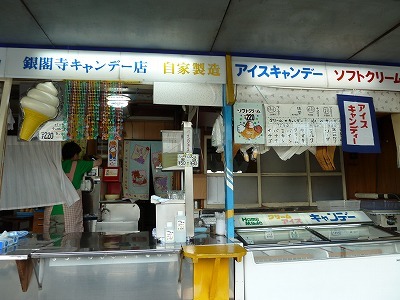 Usually there is line-ups but I waited only for 10 mins. 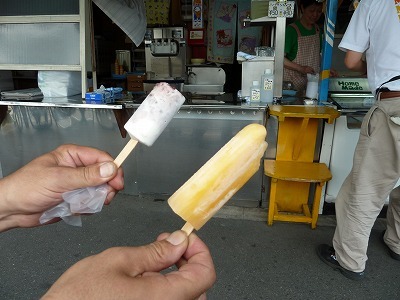 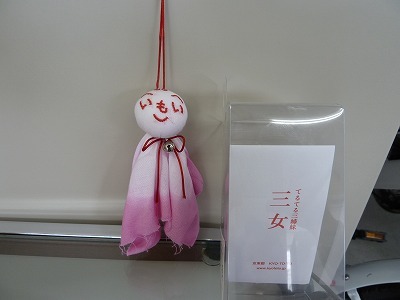 I ordered Warabi-mochi which is typical summer sweet. 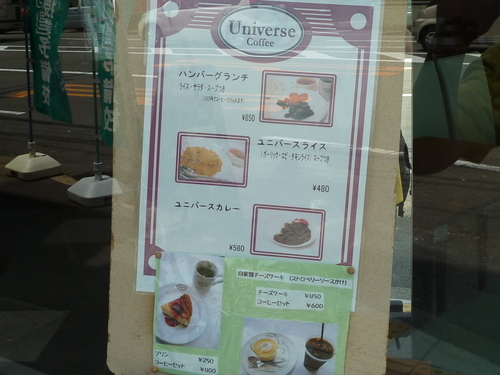 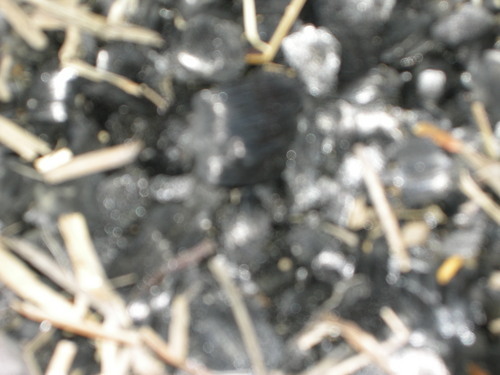 it comes with Kinako powder and black honey. 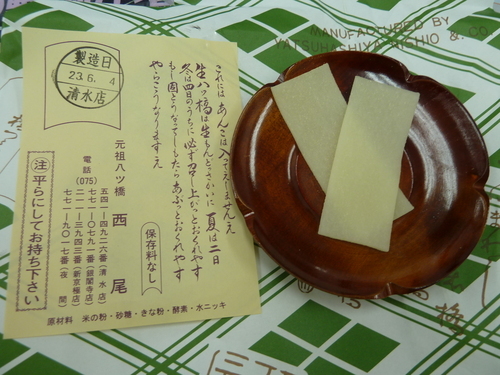 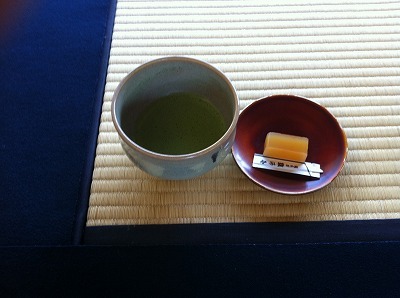 It was my first time to eat real Warabi-mochi. 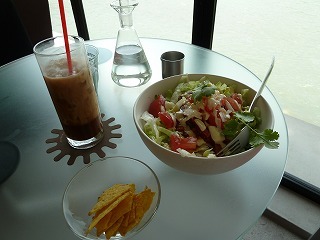 Super tasty. 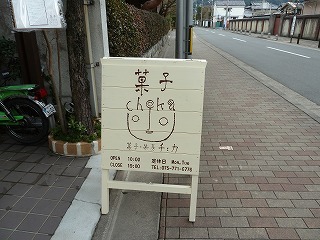 i highly recommend to try! 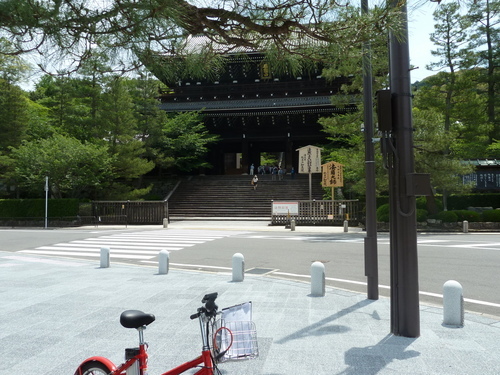 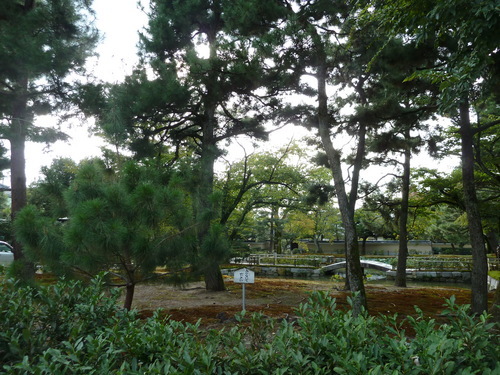 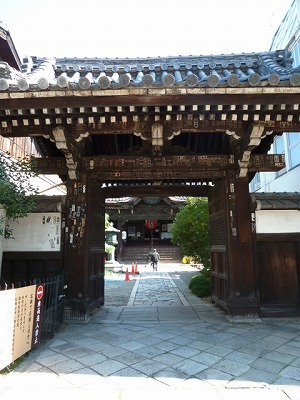 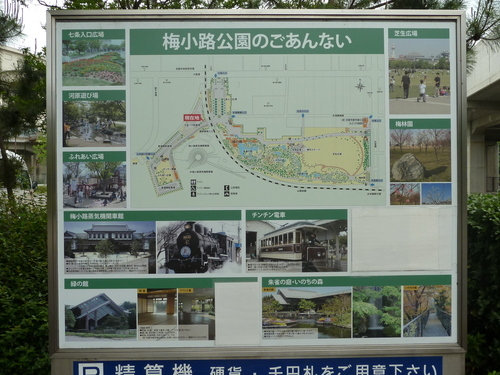 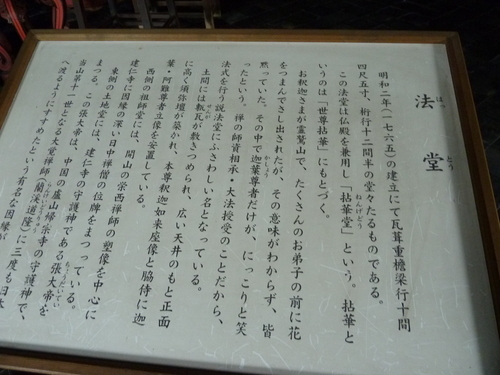 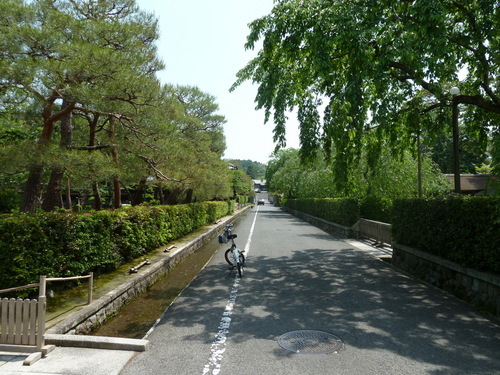 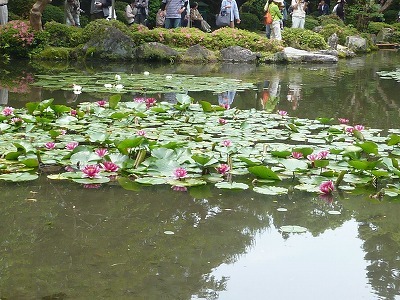 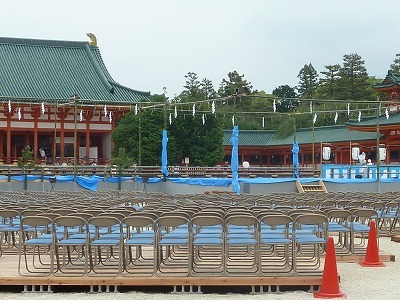 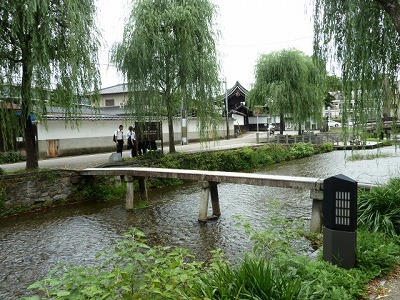 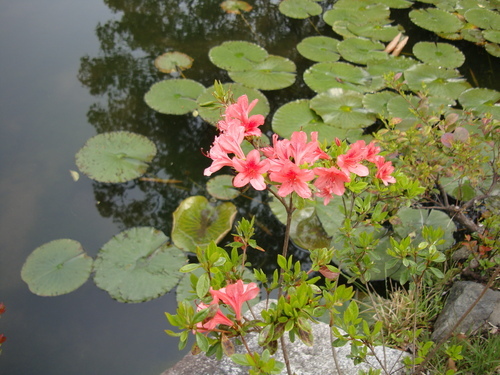 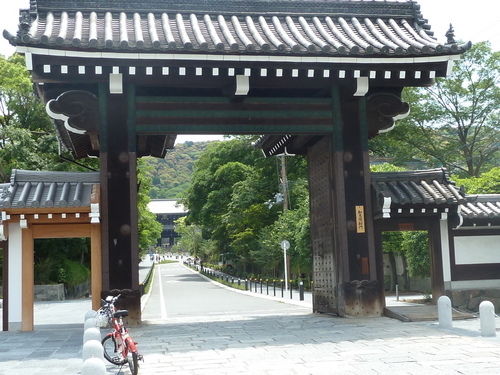 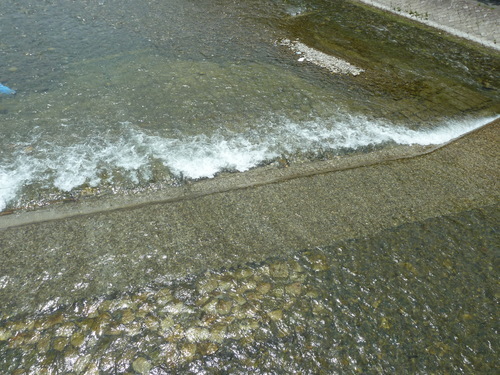 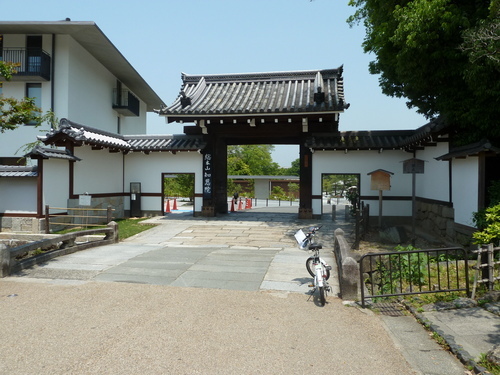 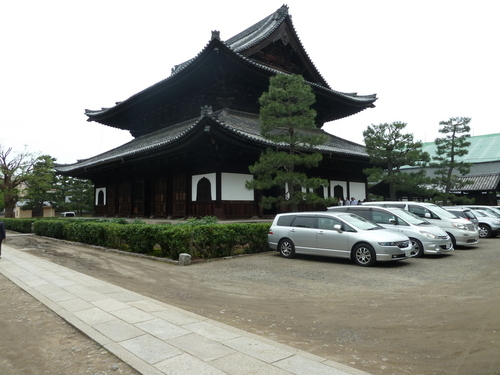 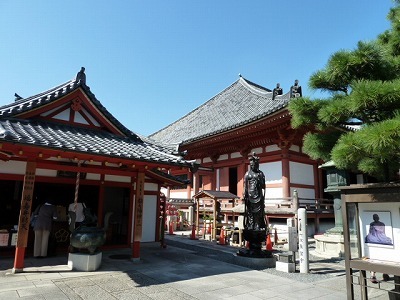 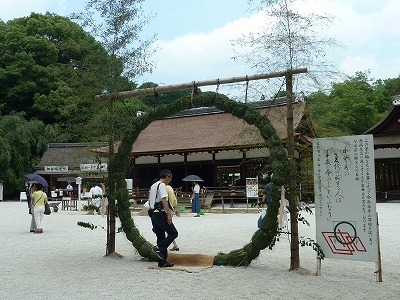 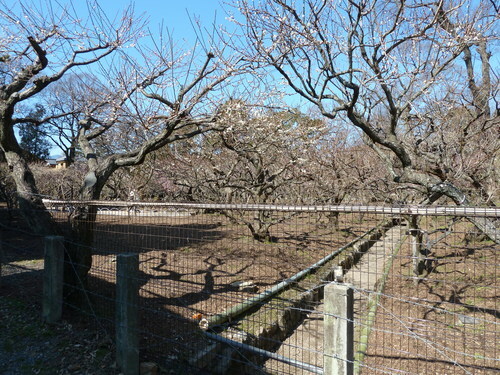 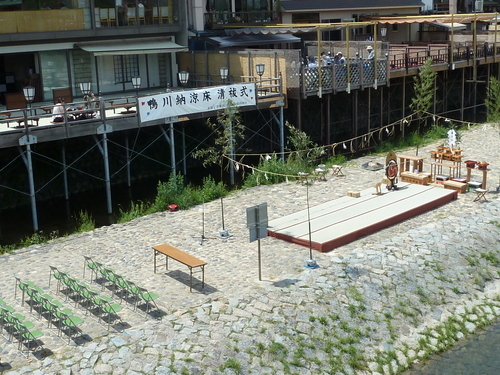 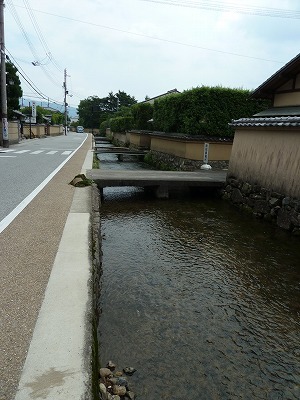 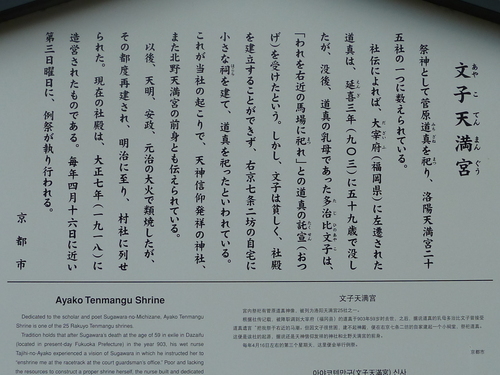 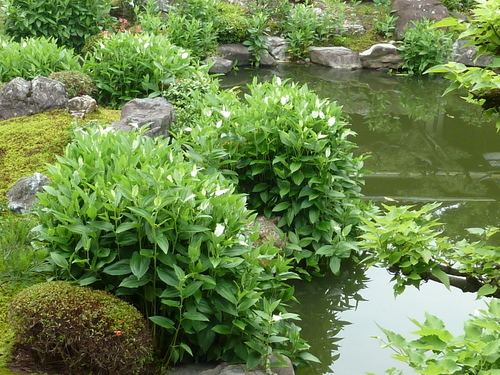 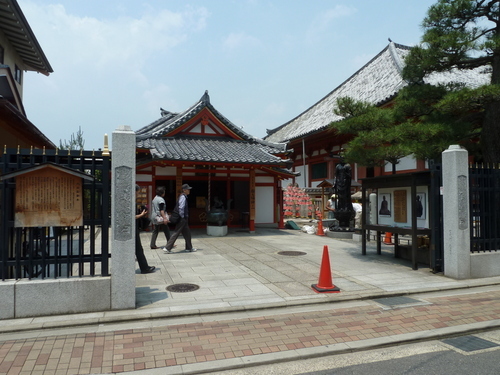 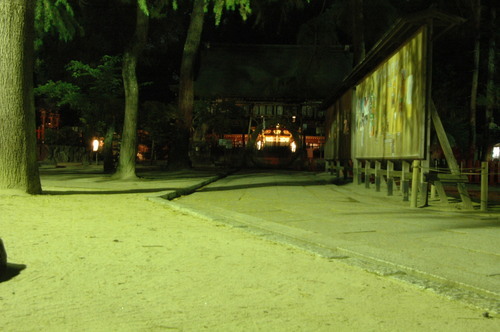 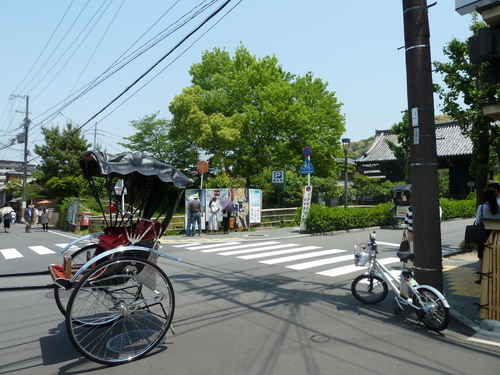 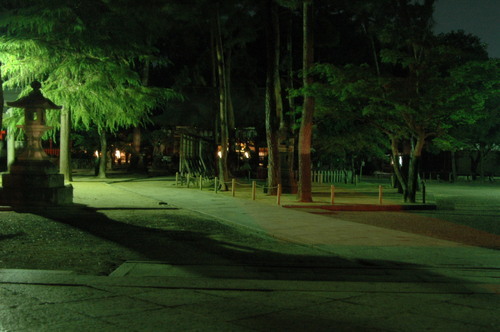 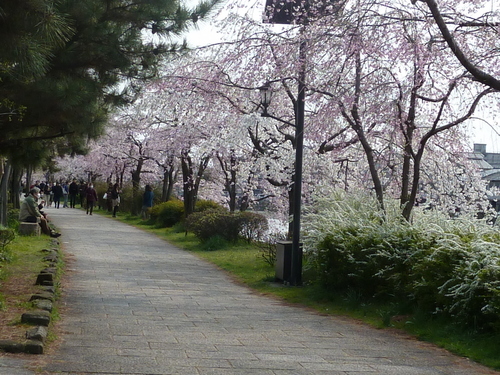 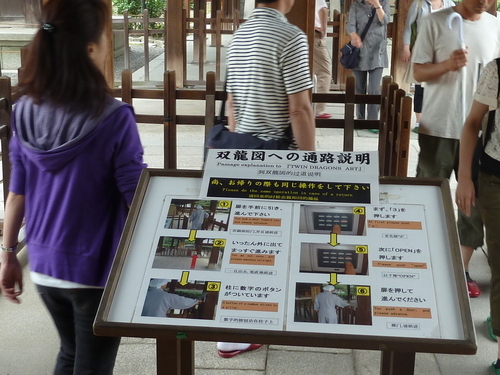 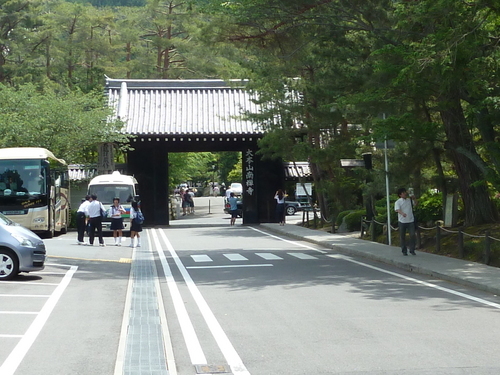 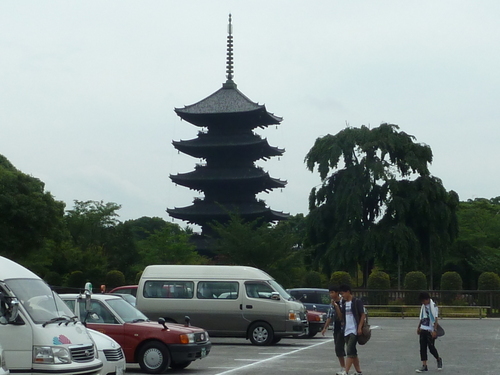 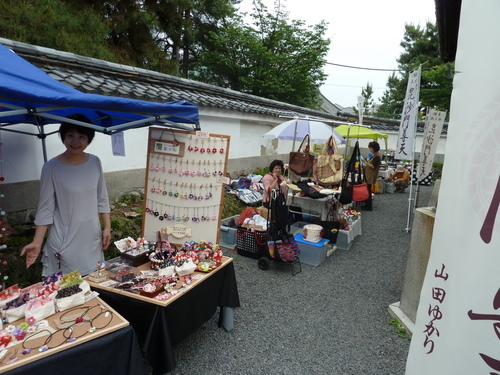 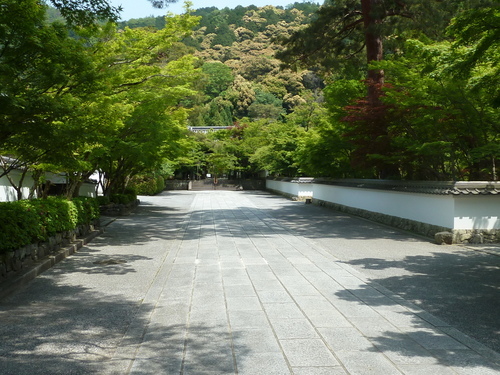 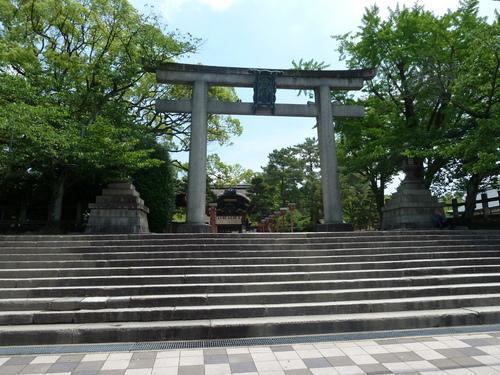 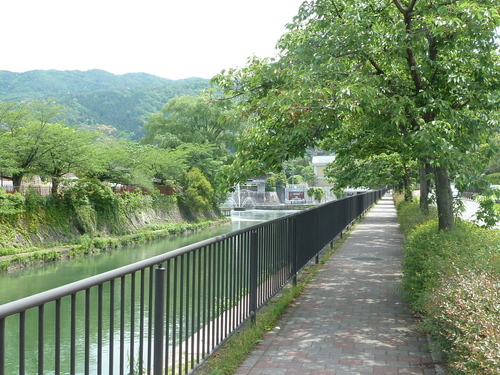 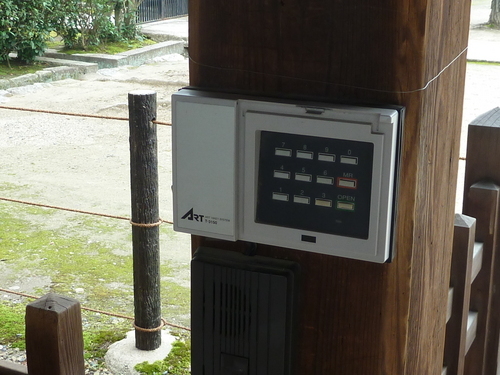 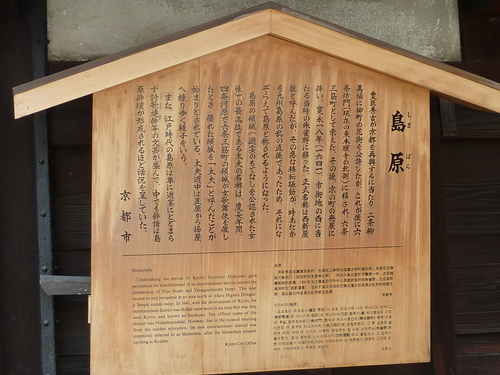 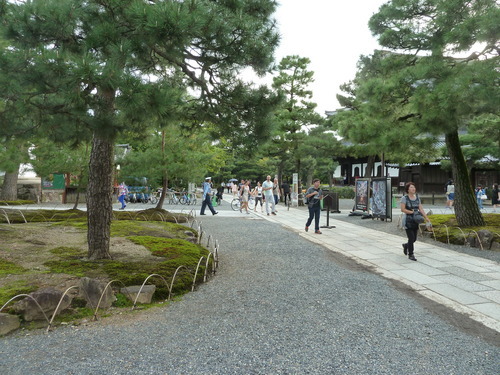 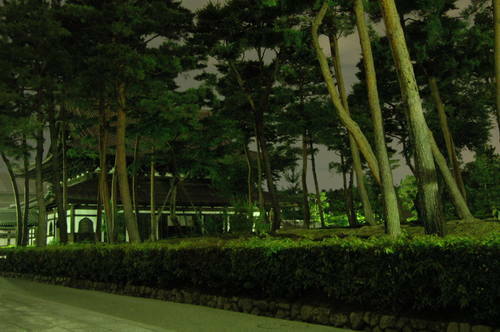 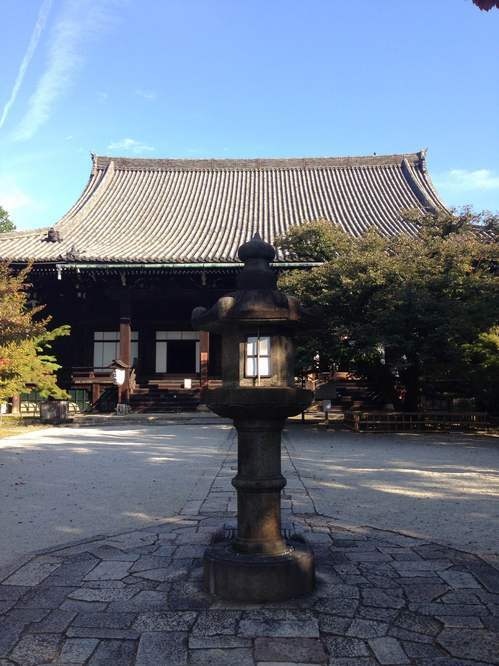 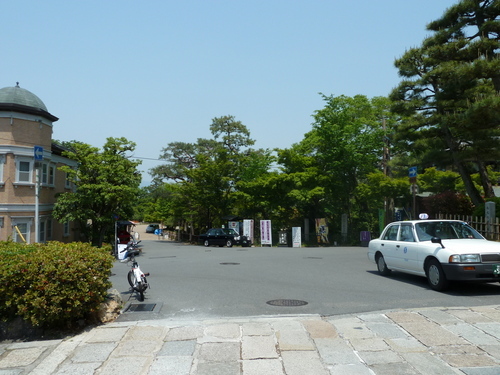 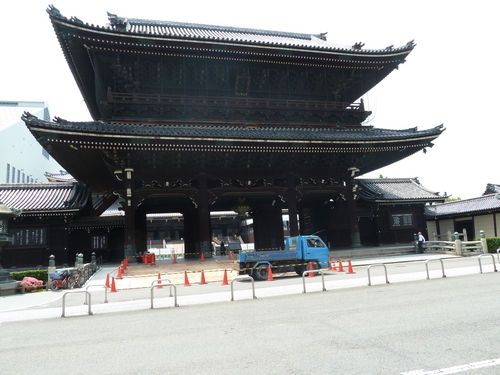 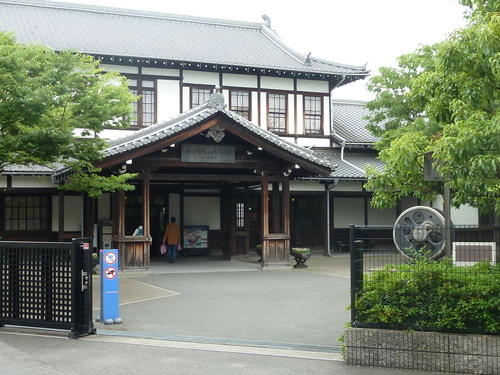 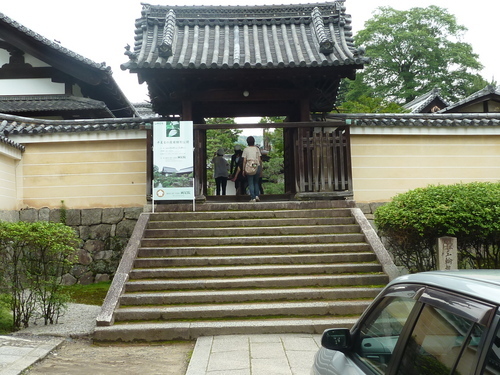 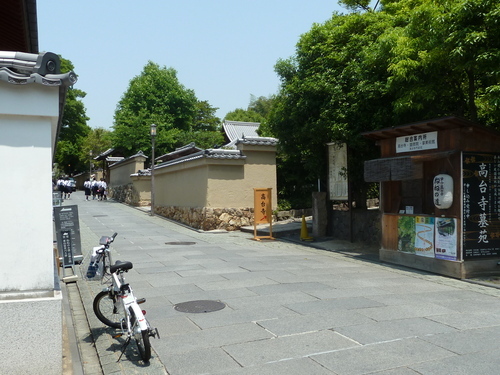 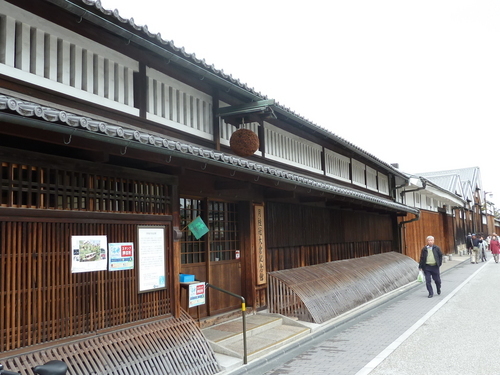 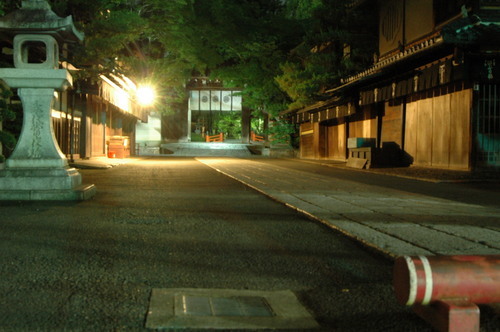 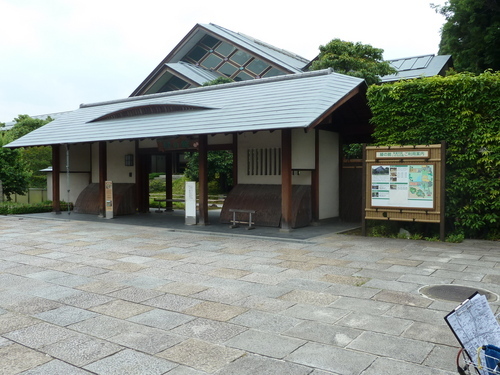 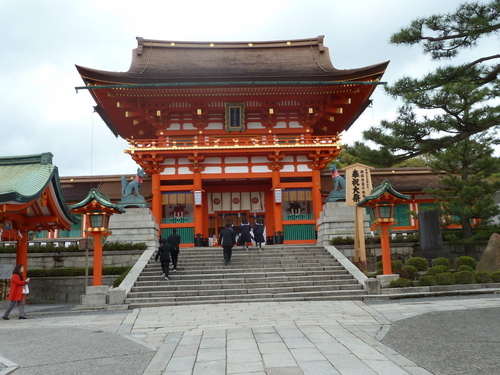 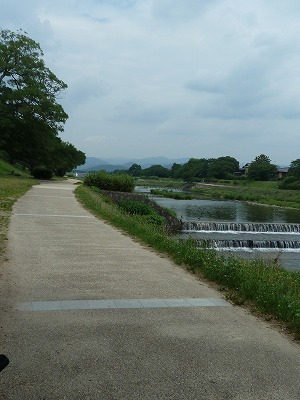 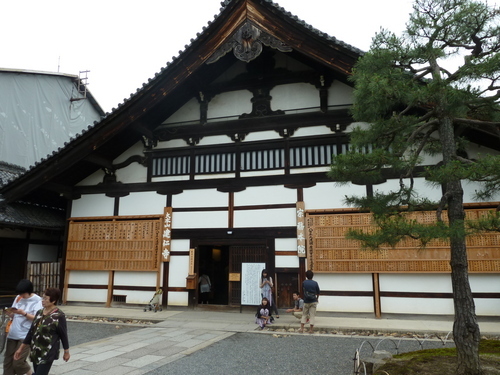 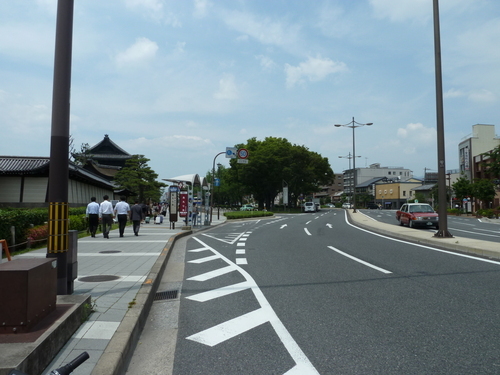 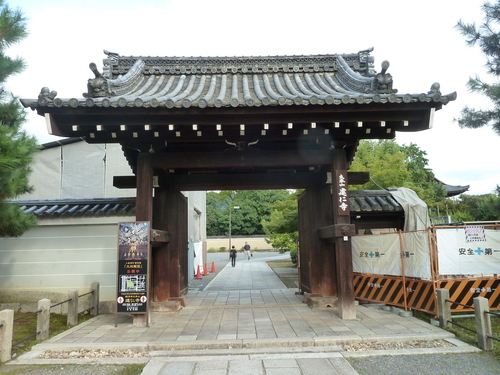 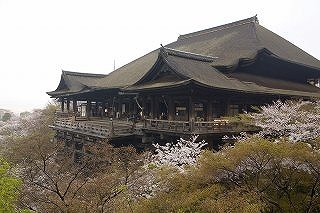 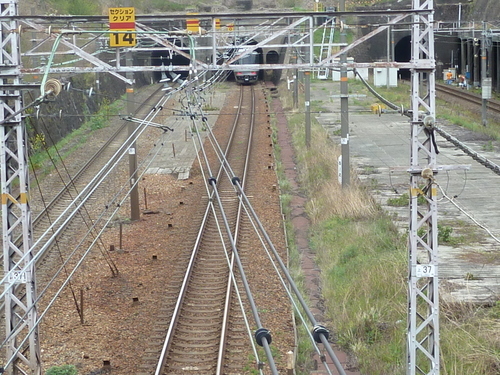 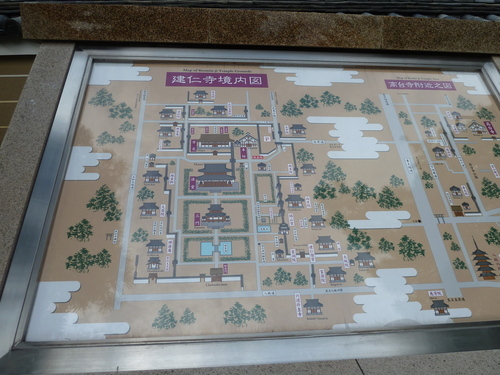 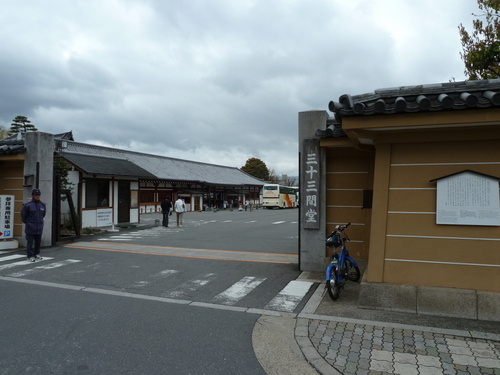 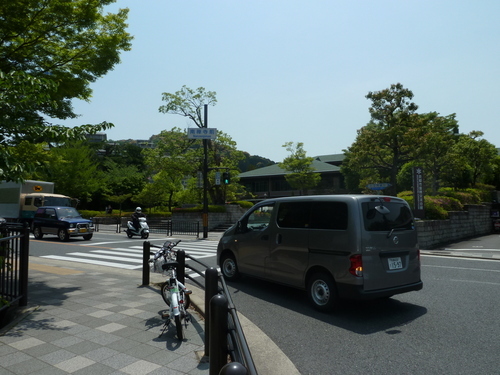 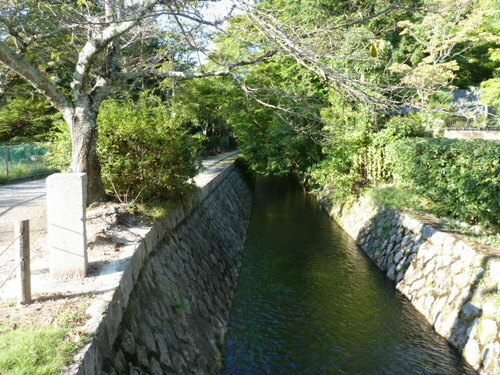 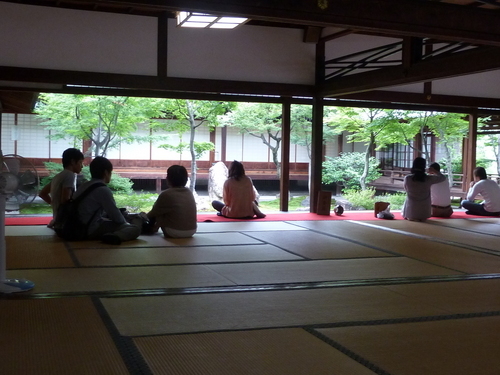 Then I went to Nanzenji which is located close to Heian shrine. 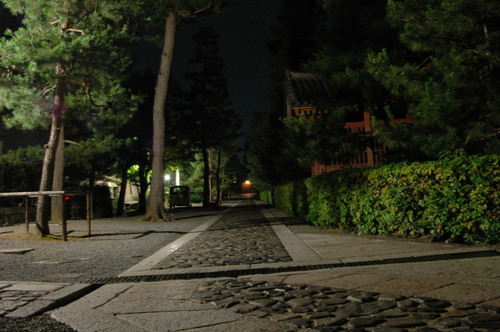 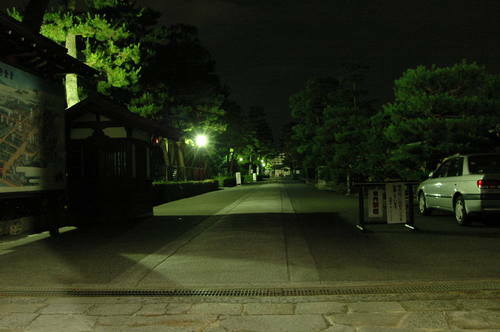 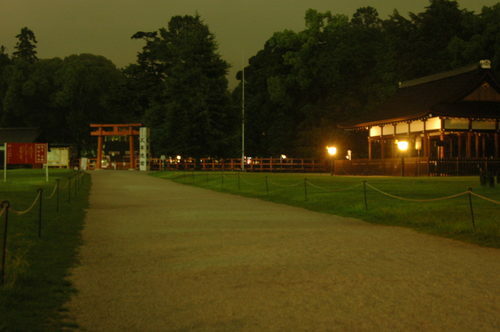 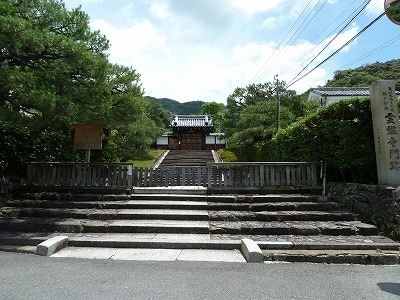 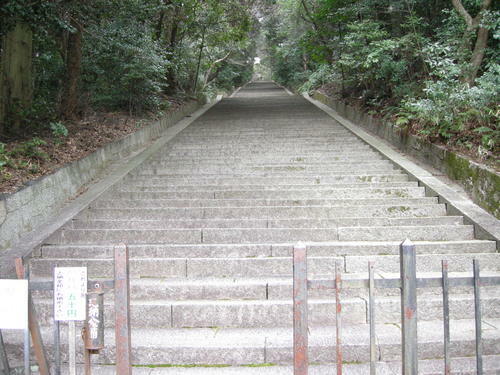 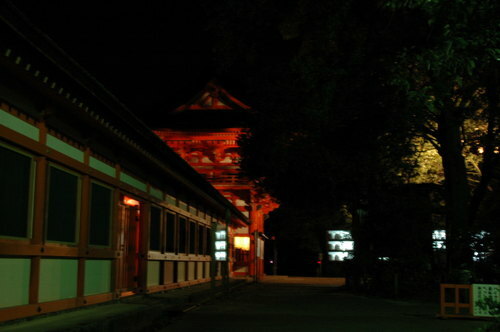 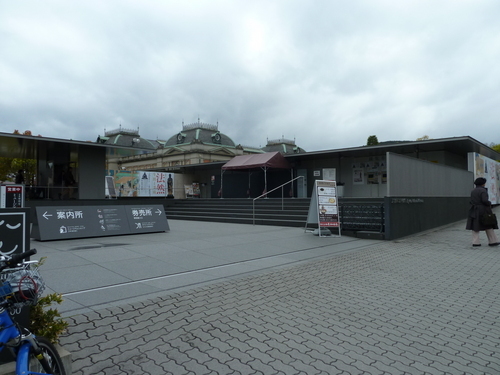 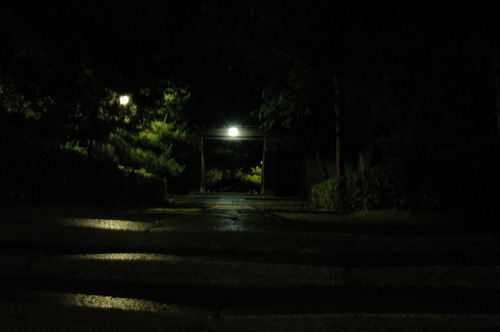 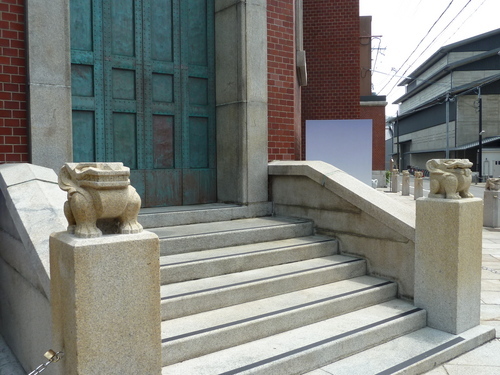 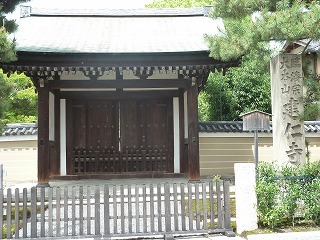 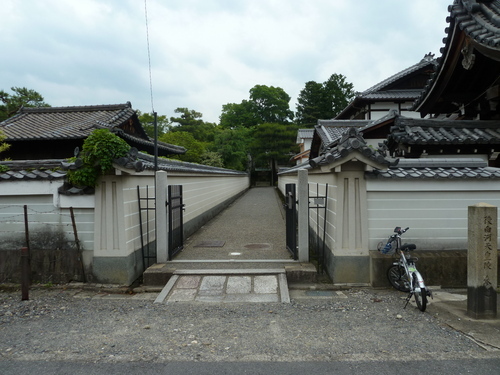 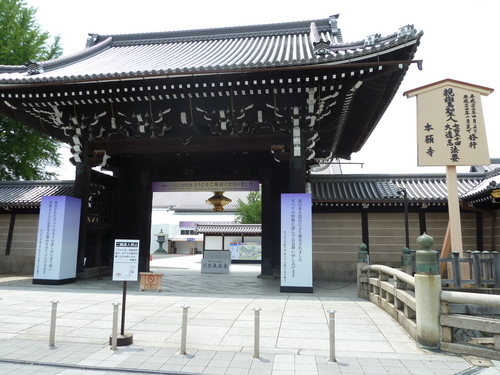 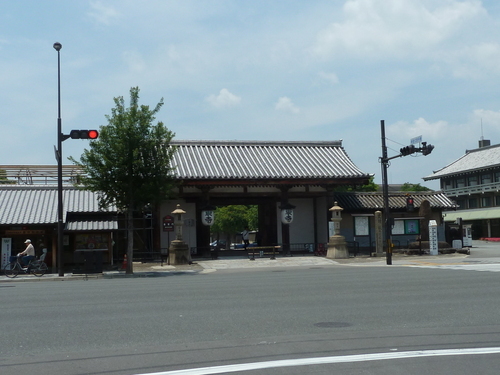 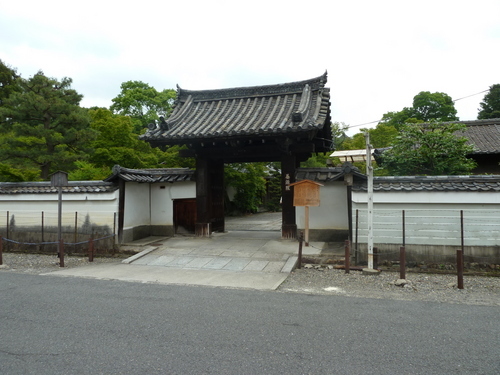 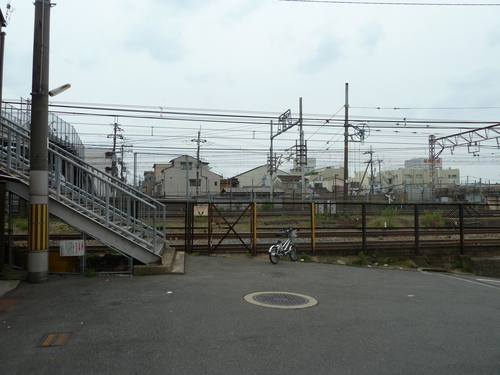 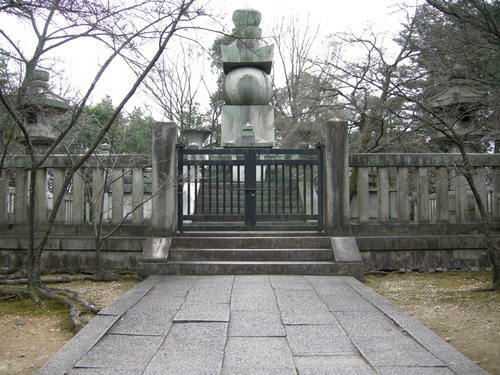 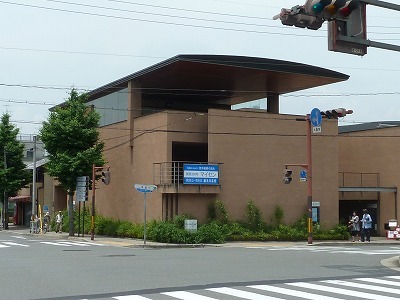 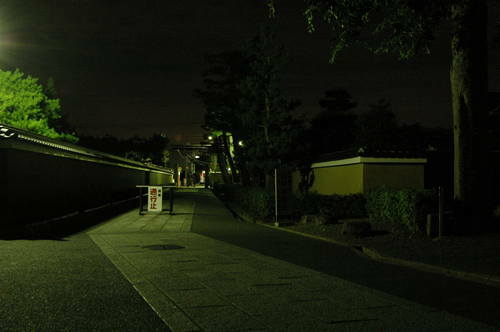 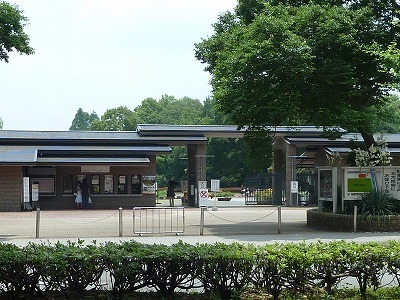 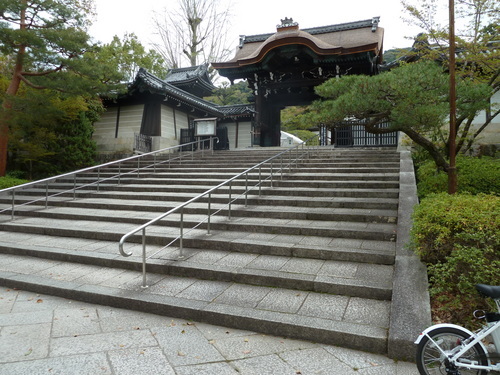 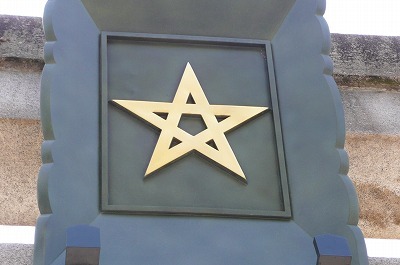 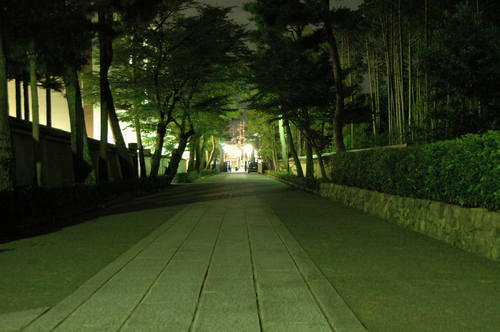 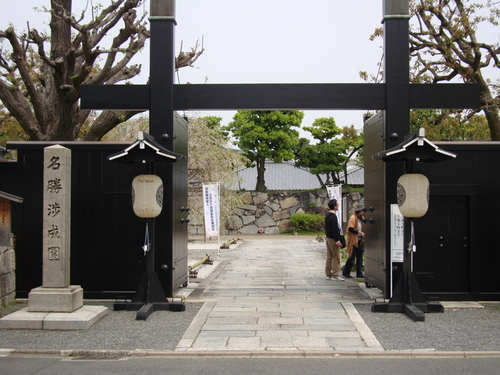 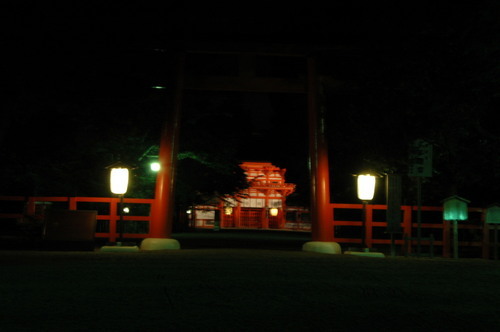 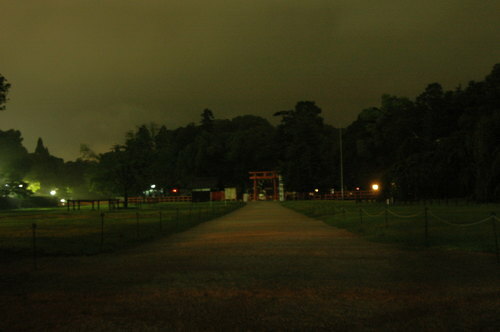 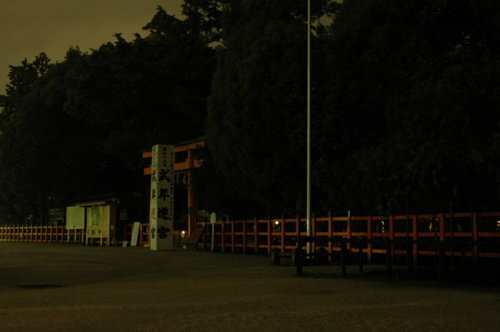 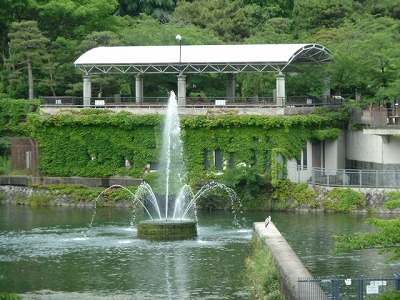 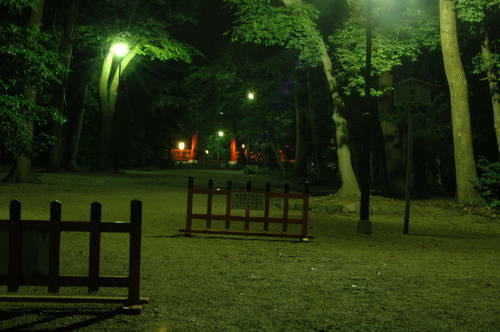 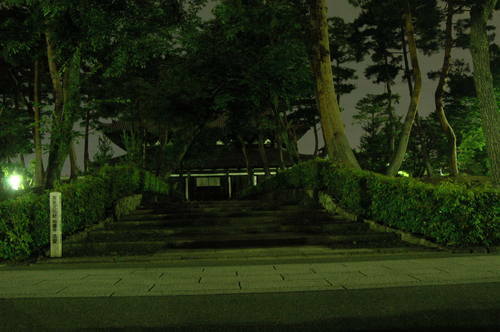 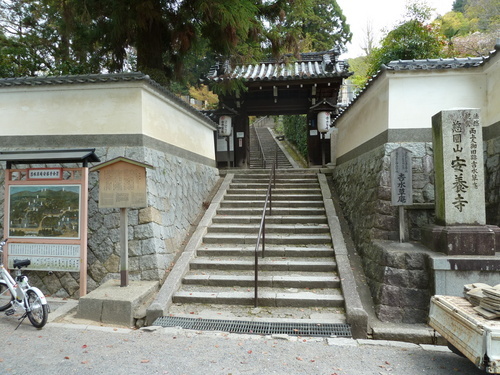 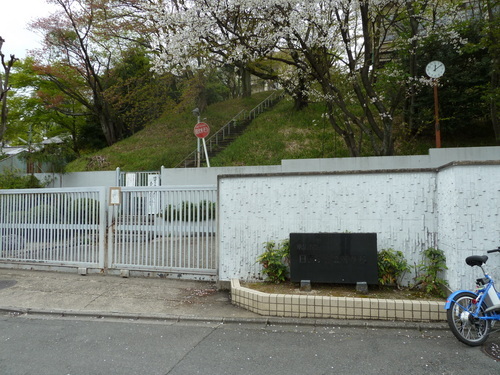 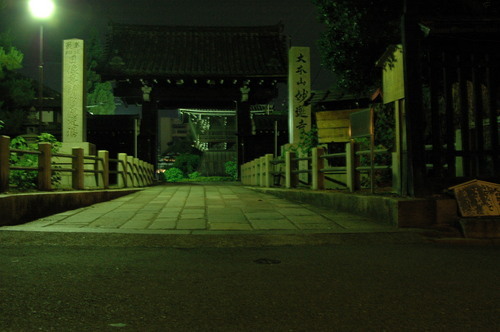 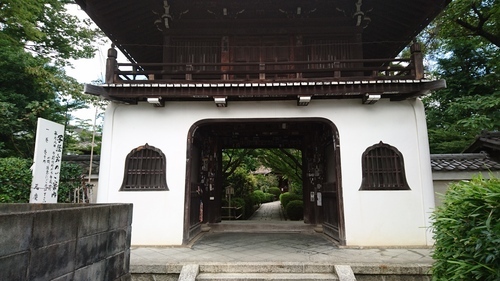 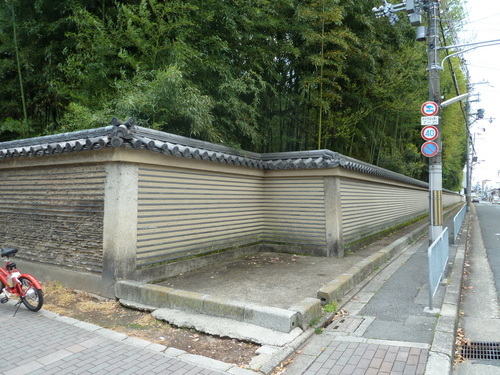 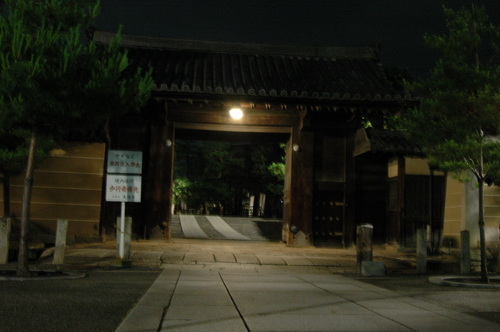 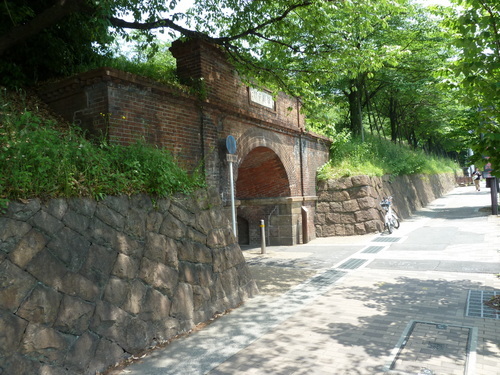 The gate contains stairs to an elevated viewing area, which was setting for a famous Kabuki play . 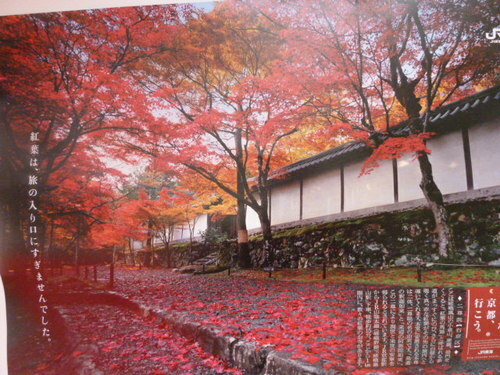 It is totally worth it to visit there. 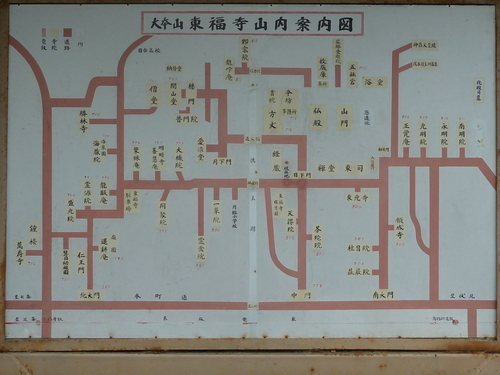 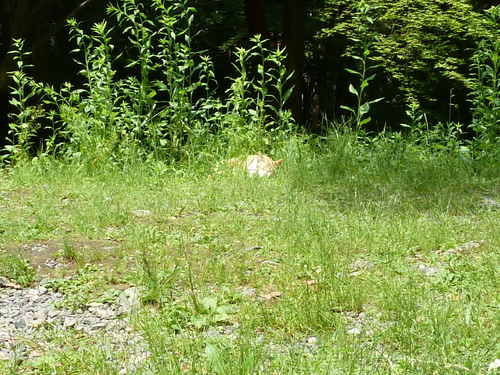 It took about 3-4 hours to visit all of these spots. 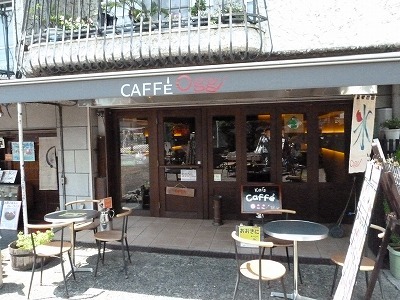 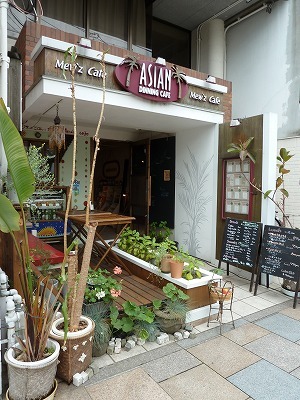 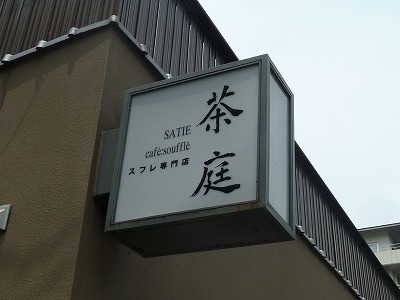 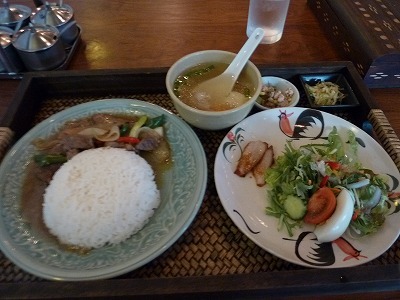 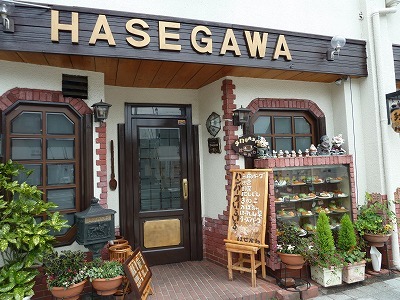 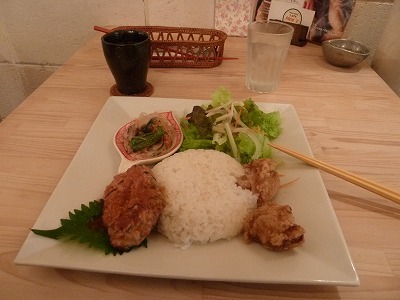 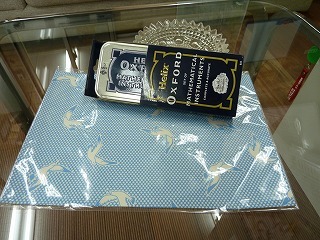 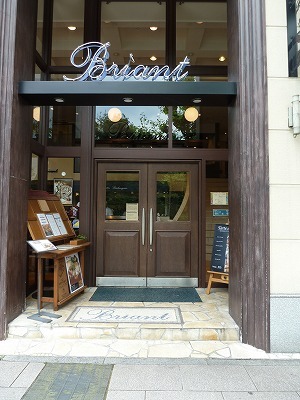 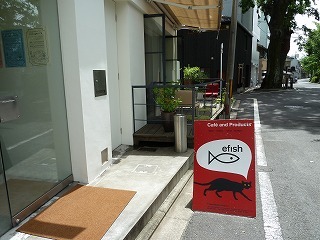 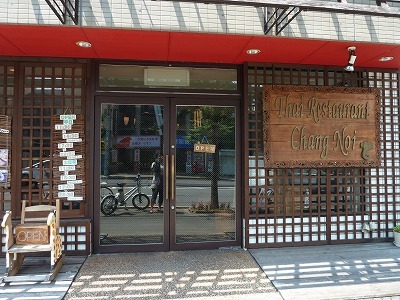 I went to small restaurant to eat lunch but i can't remember it. 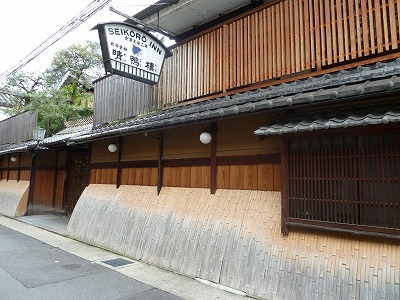 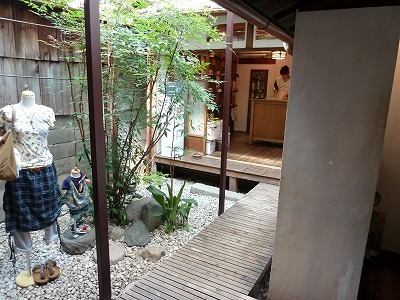 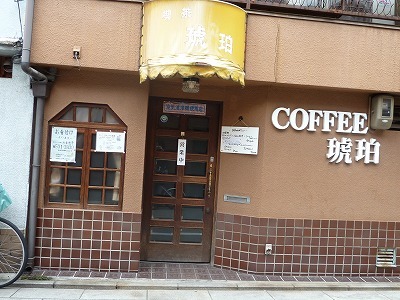 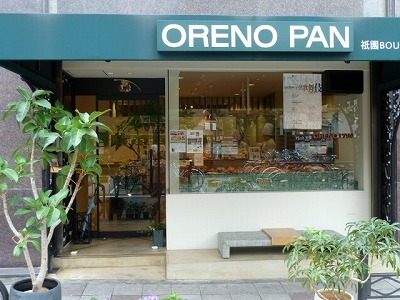 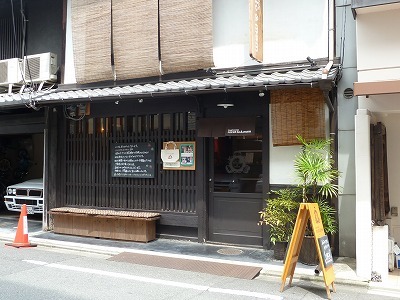 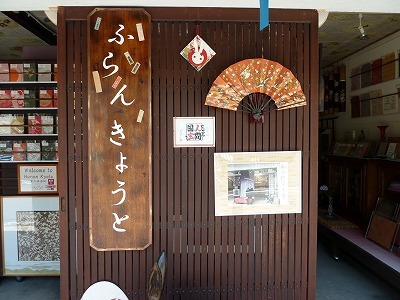 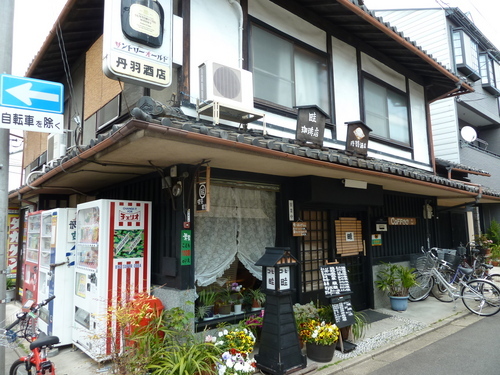 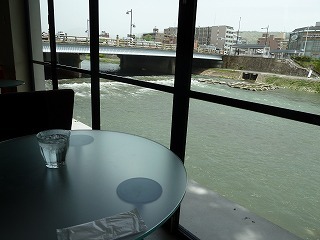 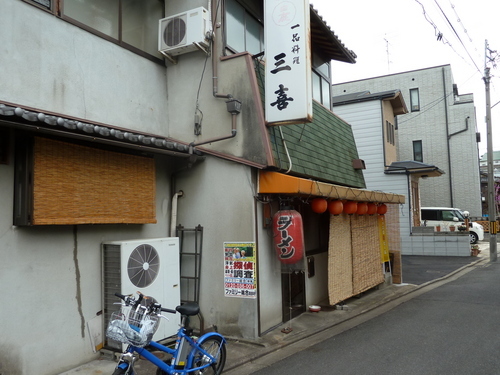 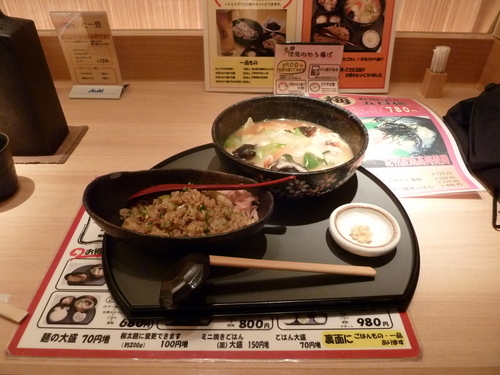 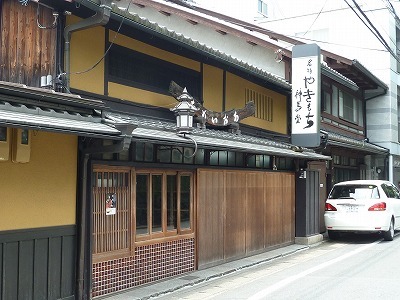 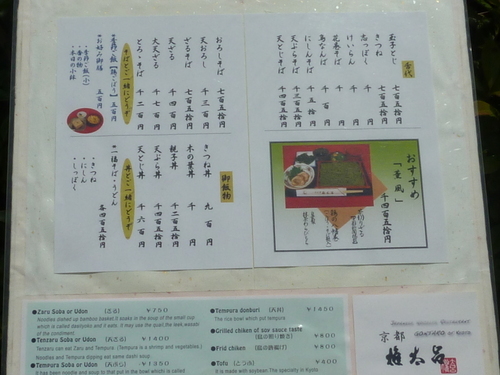 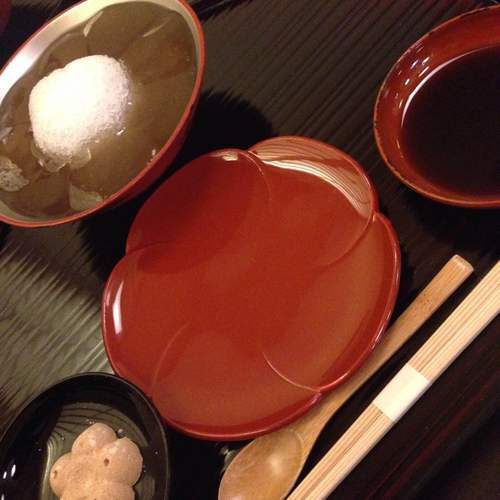 Next time I will introduce some nice restaurants around Gion area. 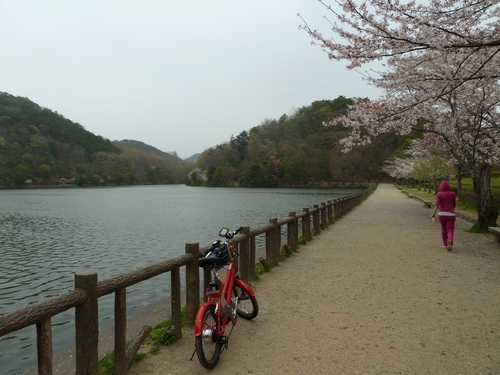 Today's weather made me to visit some places where I'd never been before so I biked for 2 hours to experience something new. 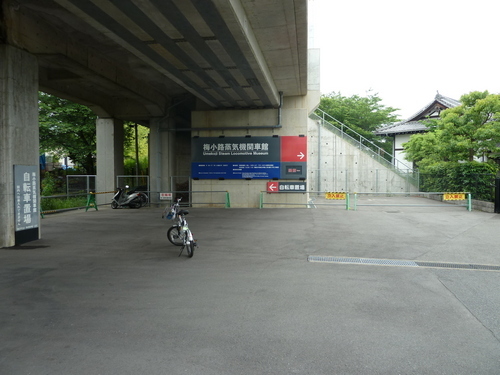 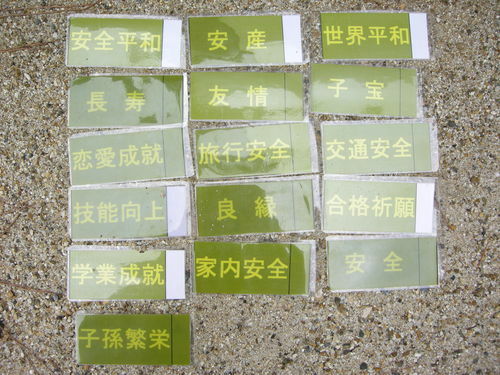 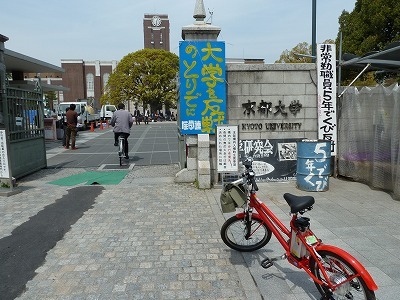 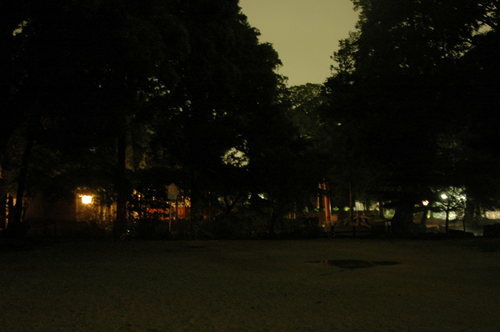 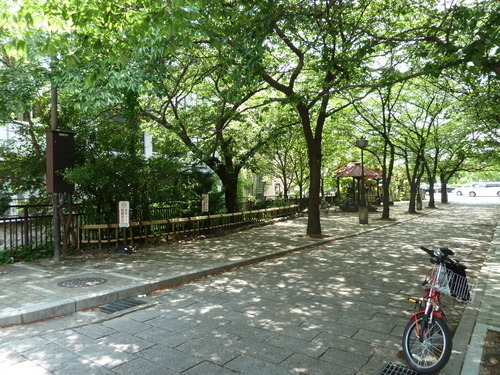 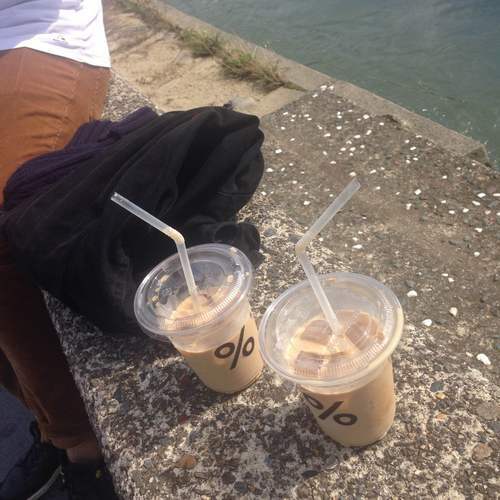 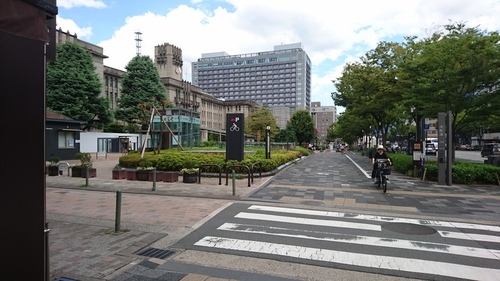 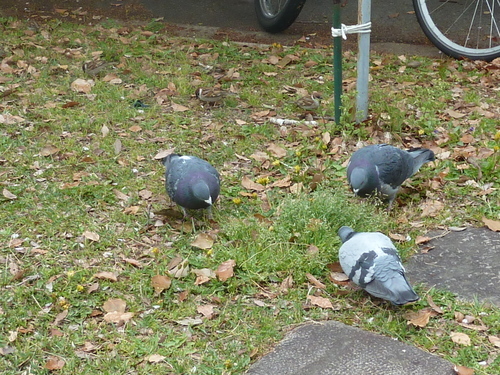 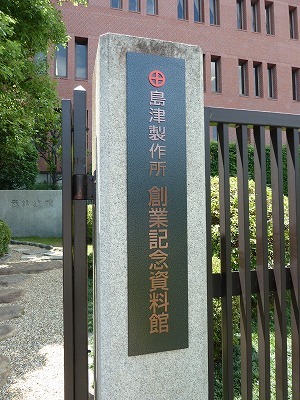 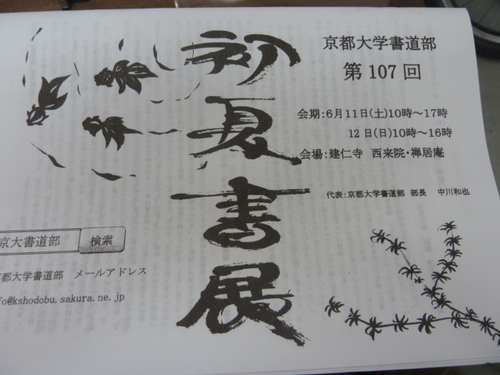 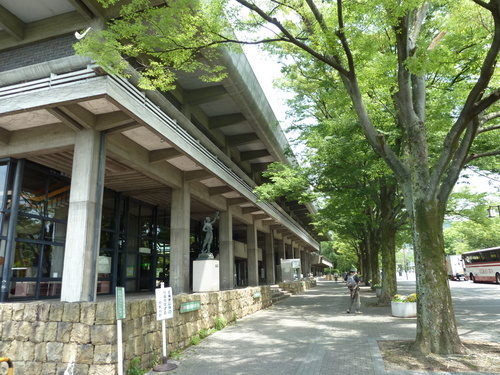 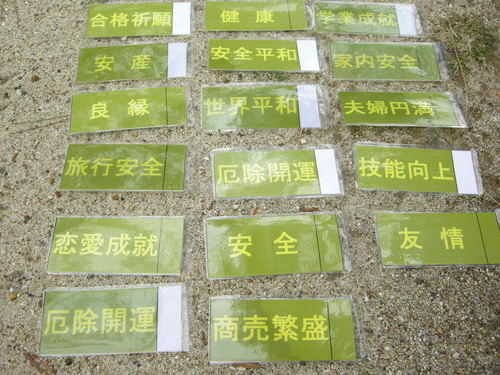 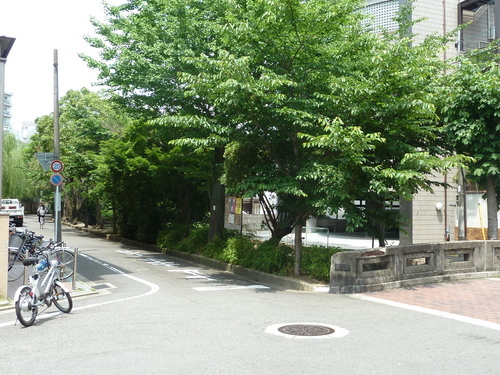 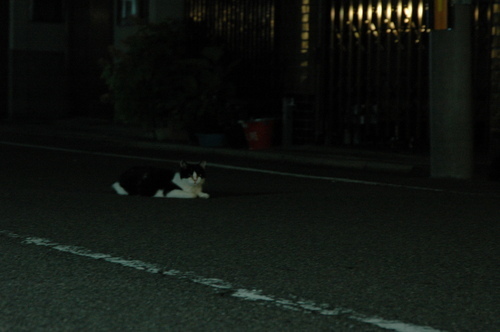 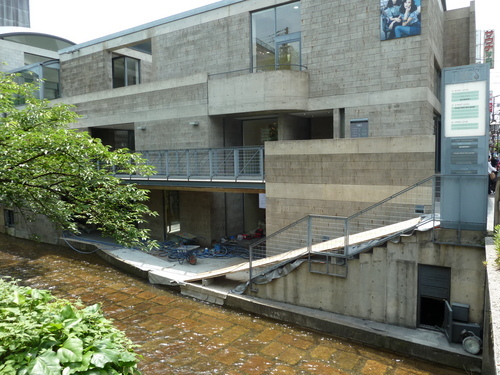 Firstable, I got to Kyoto university. 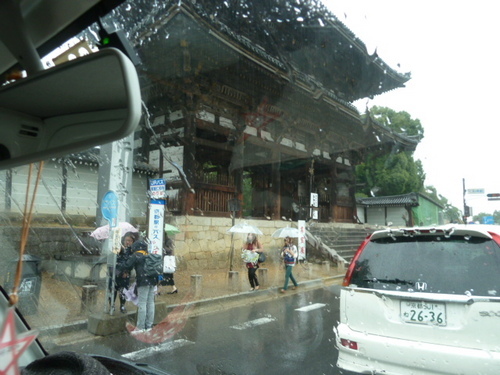 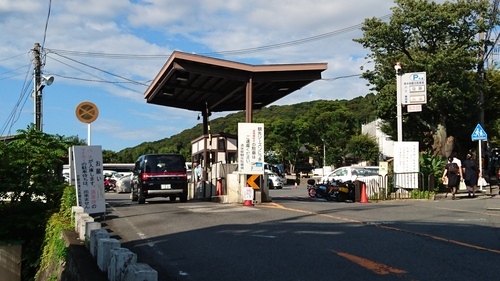 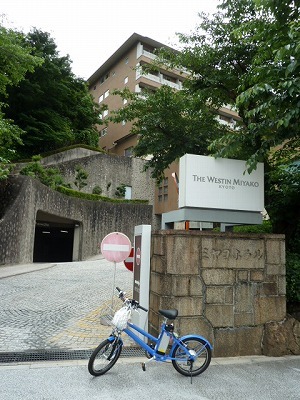 I grew up here in Kyoto but it was my first time to enter there. 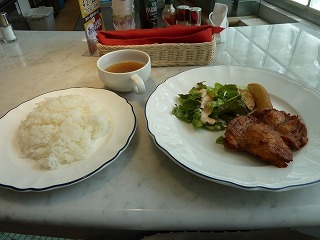 There are some good restaurants in the university.One of them is very very popular so I couldn't taste but a lot of people recommend it. 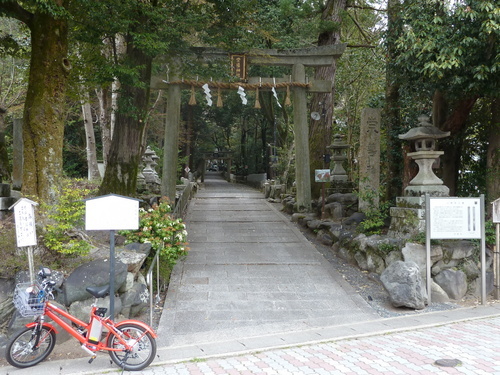 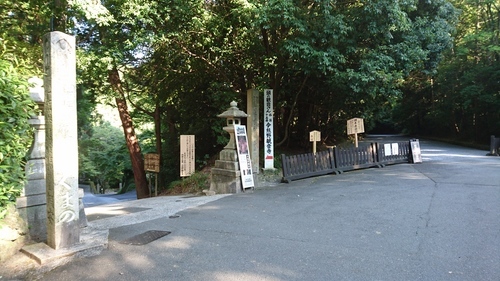 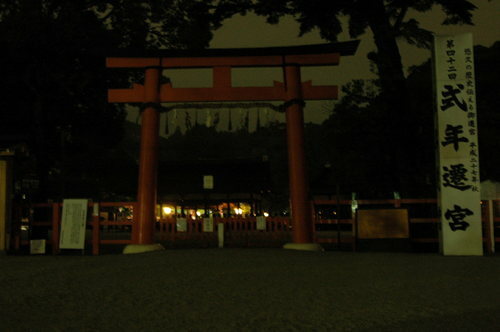 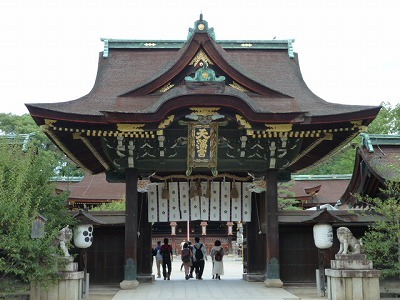 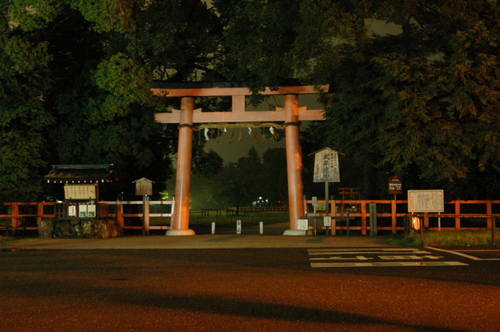 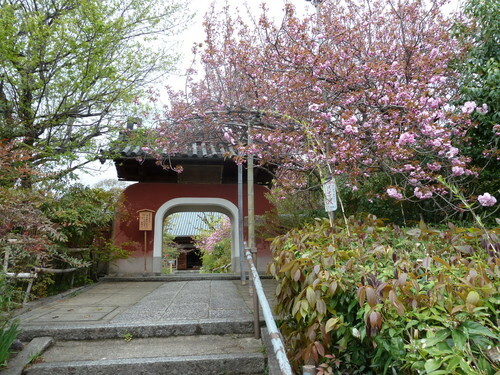 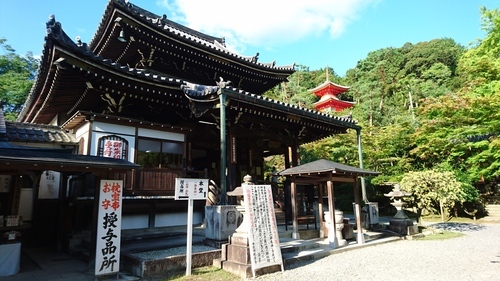 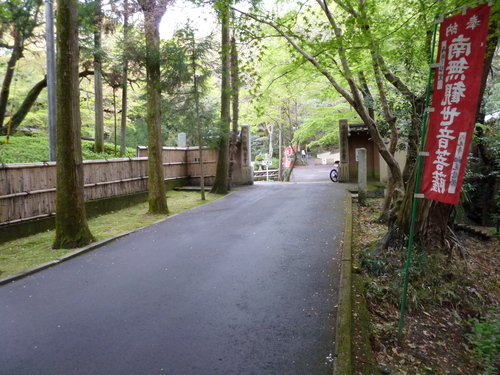 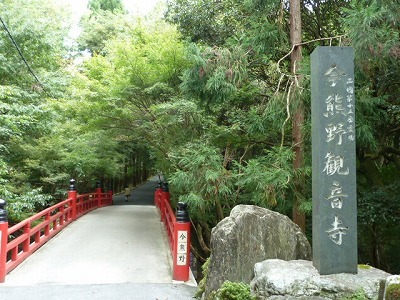 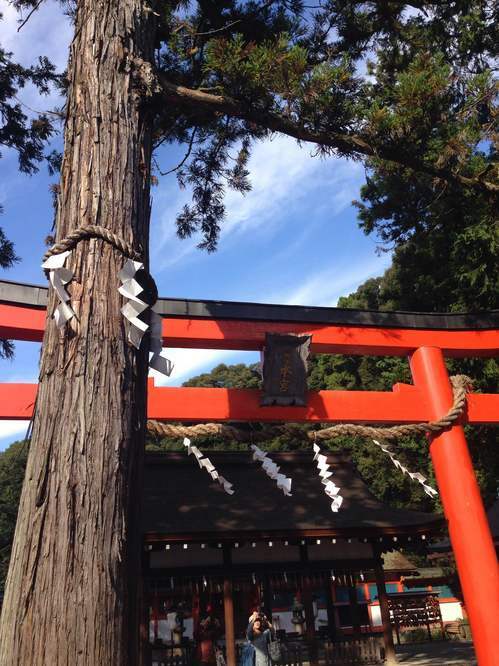 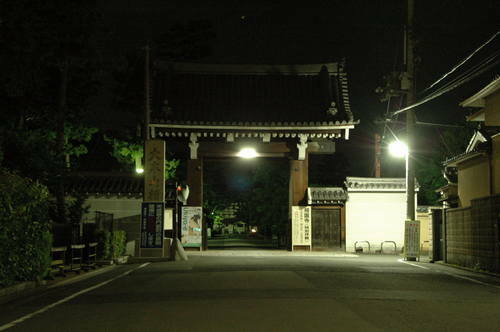 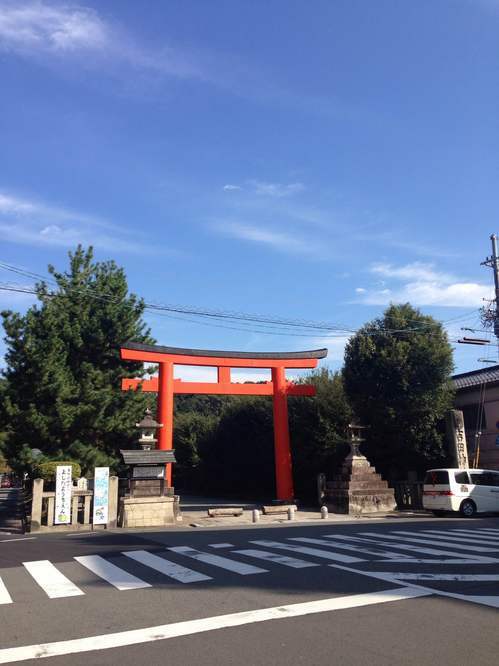 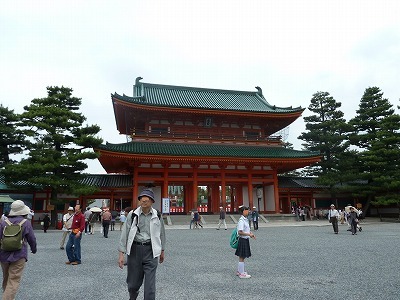 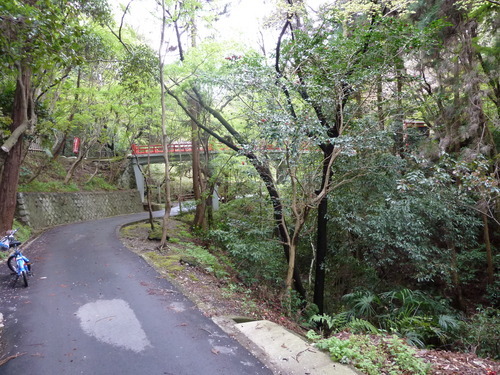 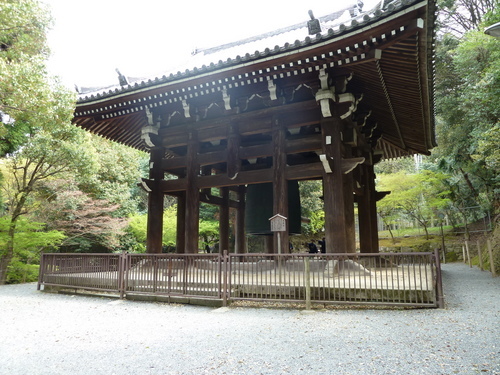 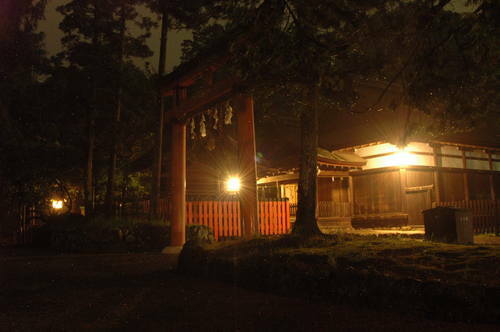 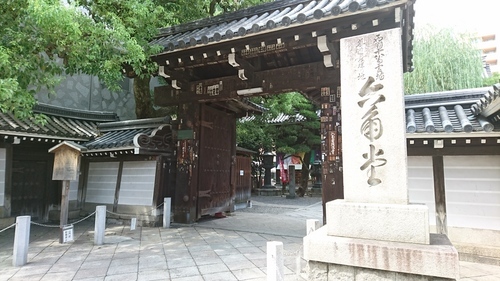 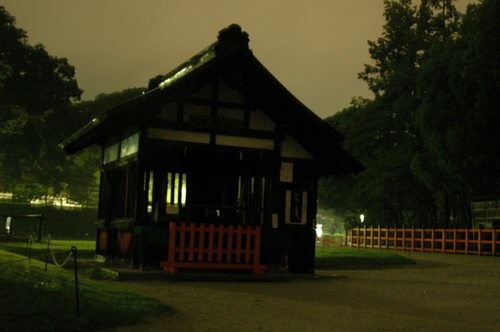 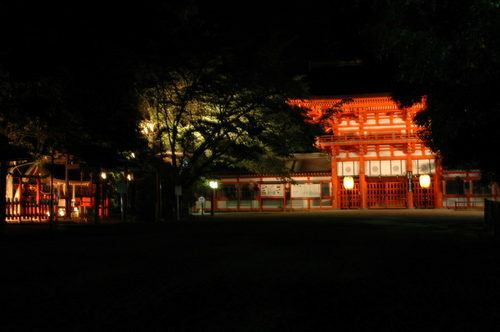 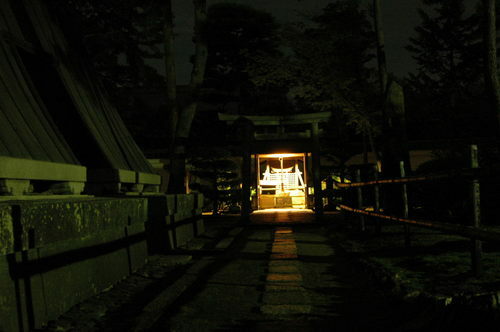 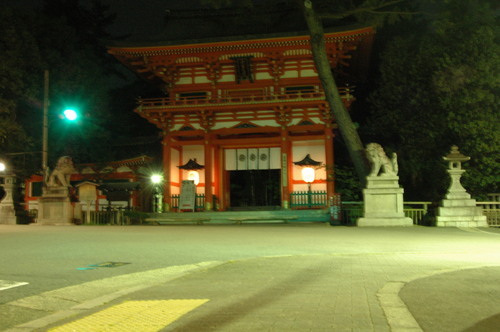 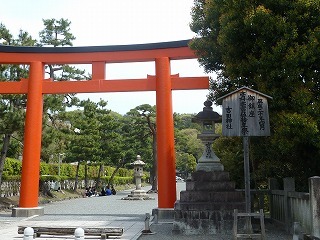 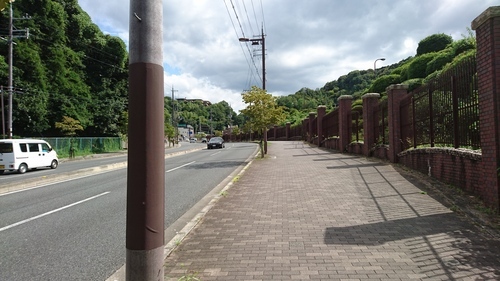 Very close to main entrance of the university, there is Yoshida shrine.The shrine is famous for traditional celemony of end of winter.If you like to hike, there is short trail. 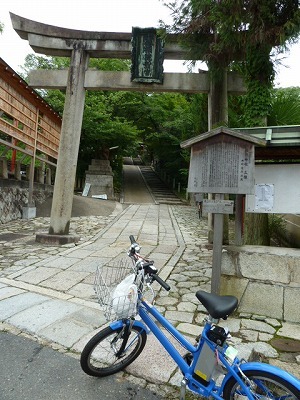 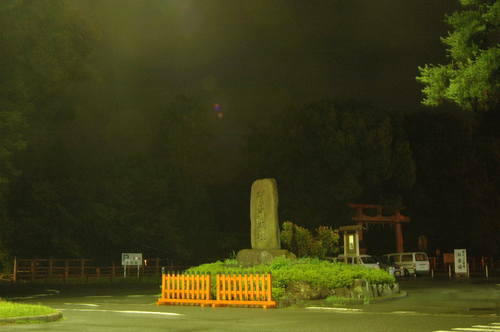 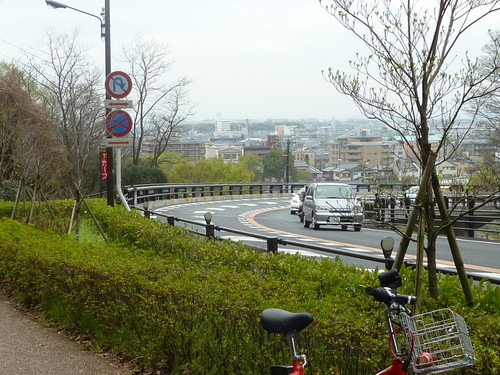 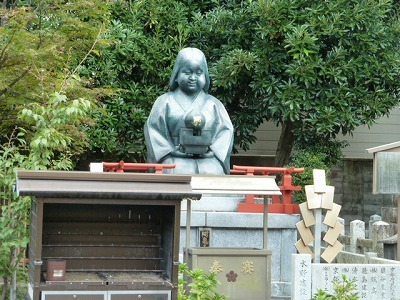 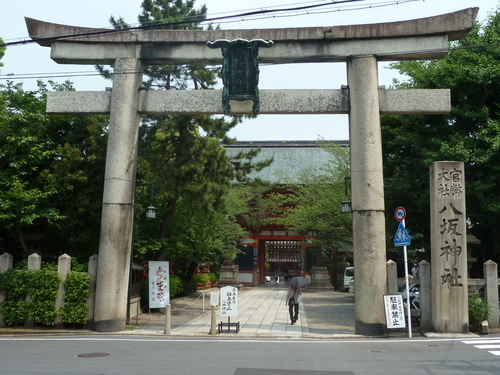 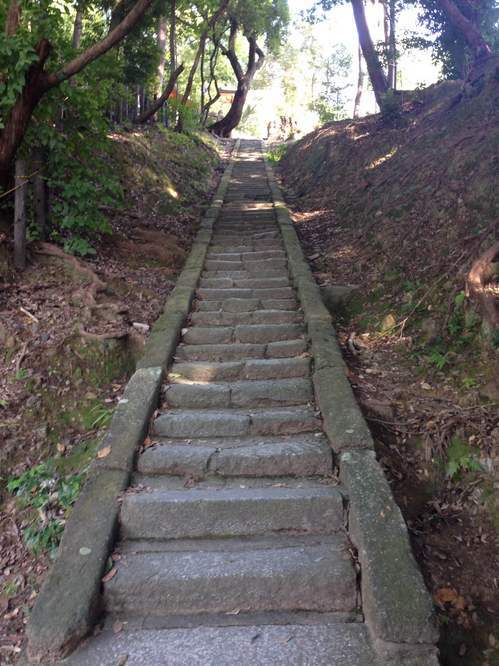 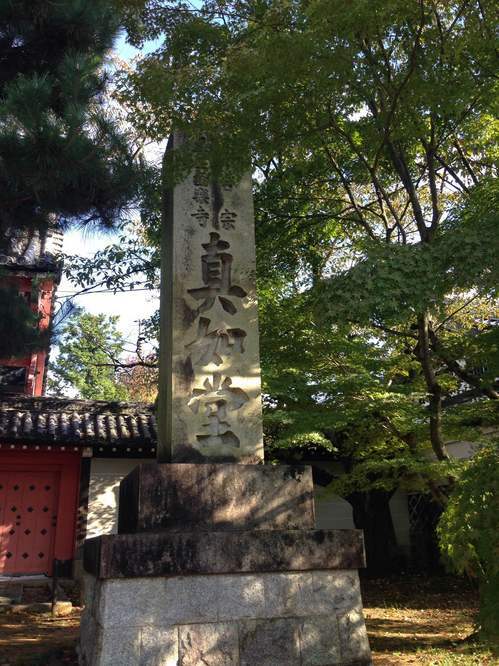 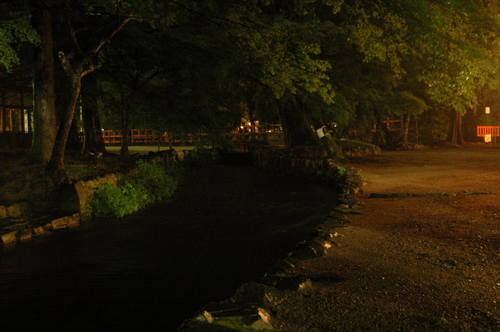 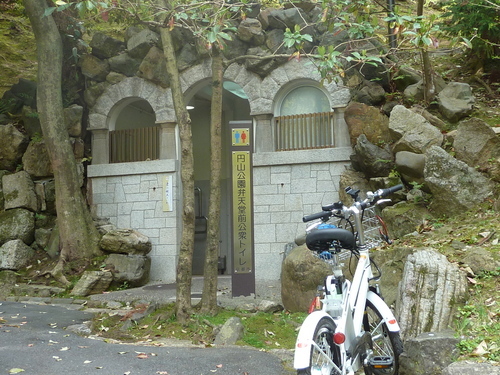 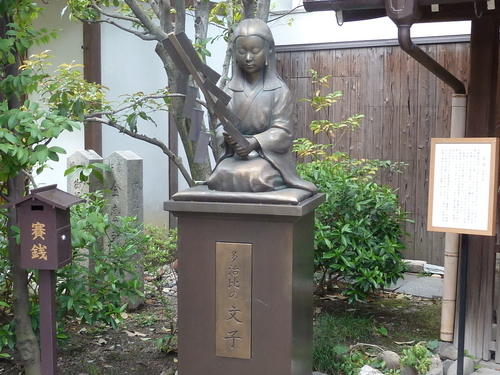 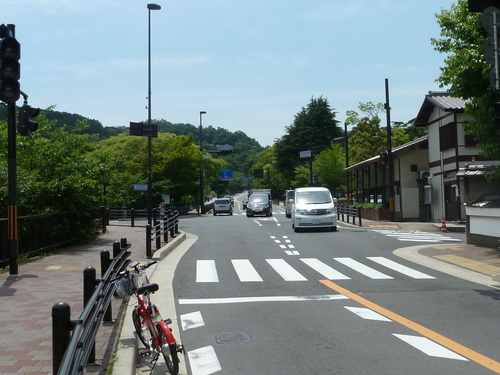 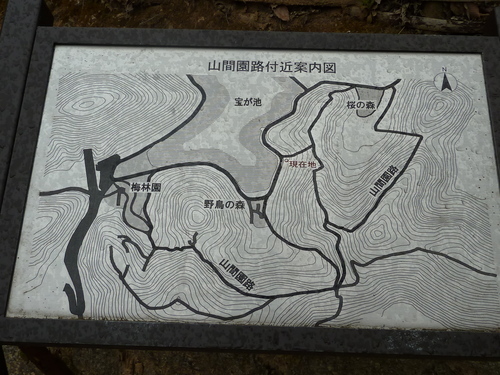 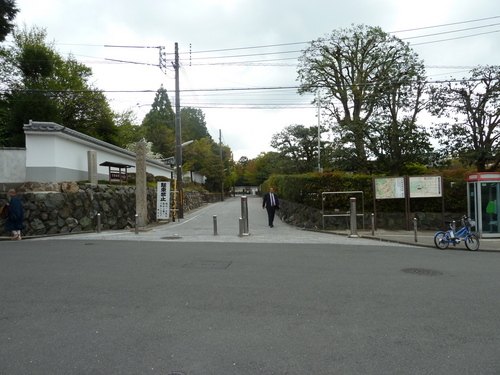 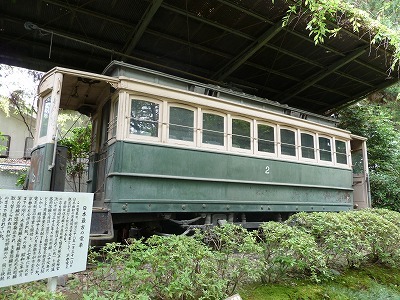 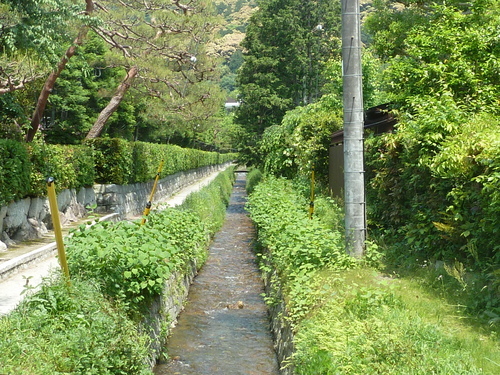 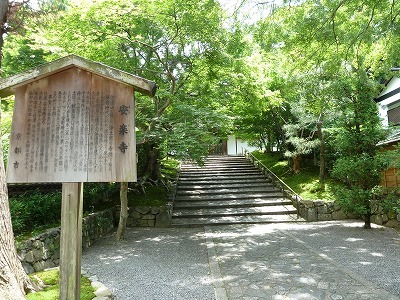 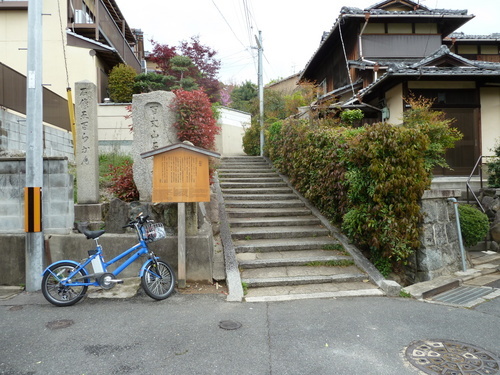 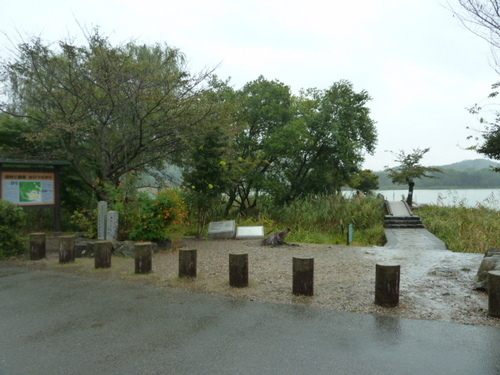 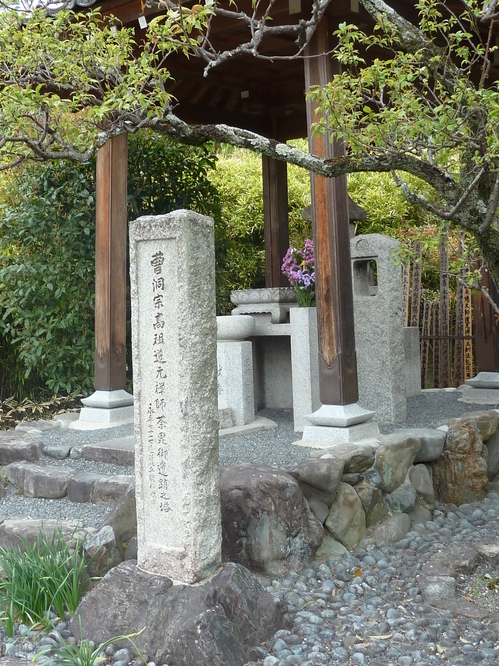 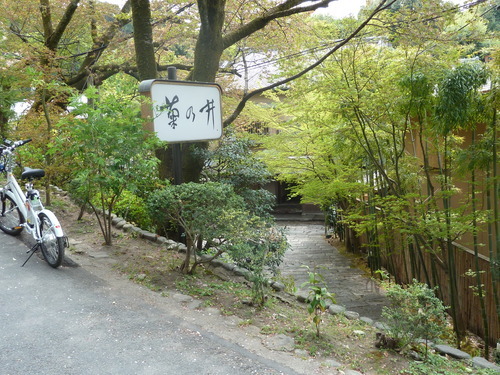 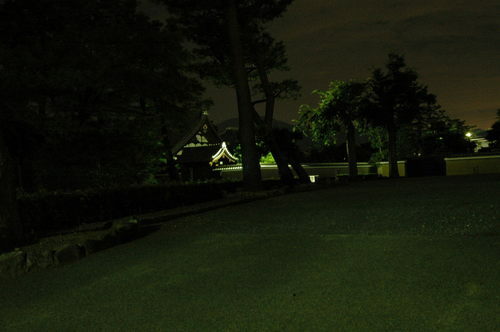 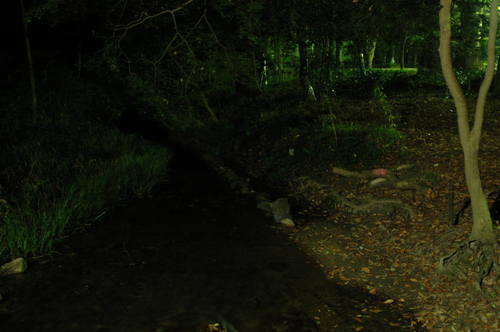 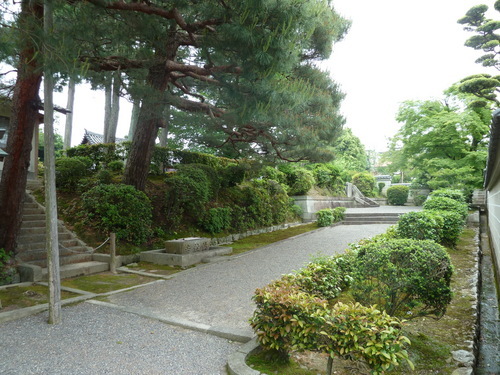 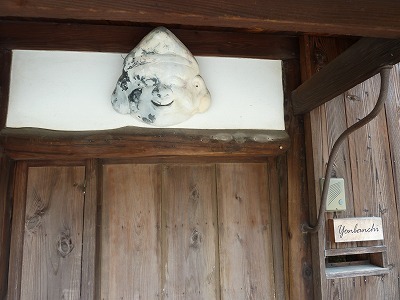 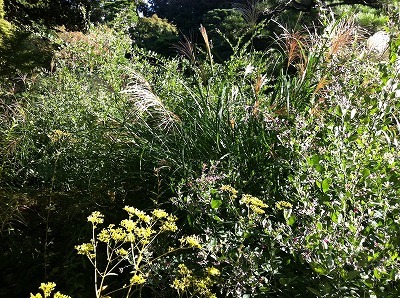 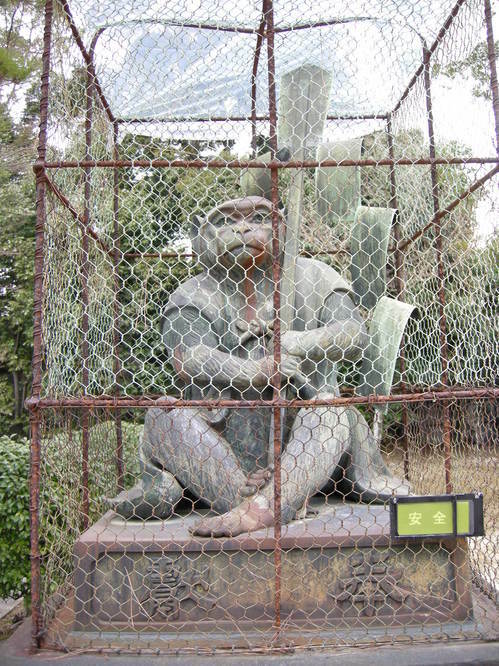 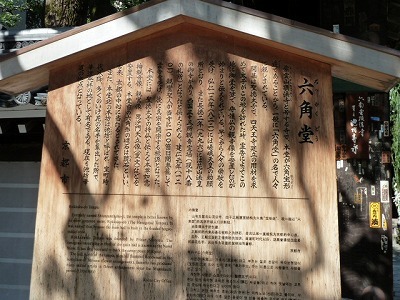 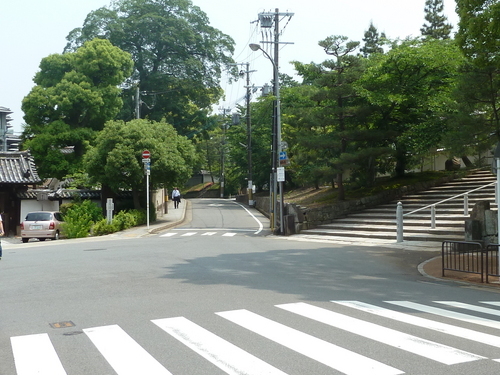 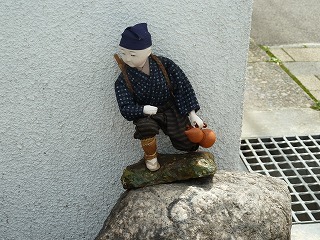 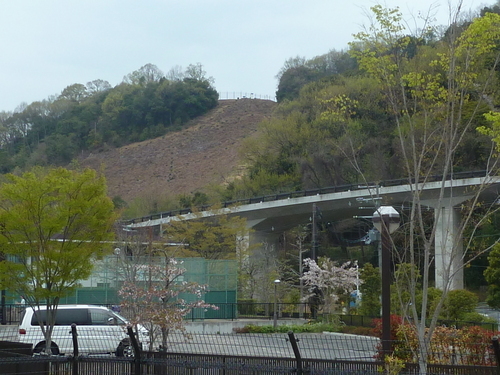 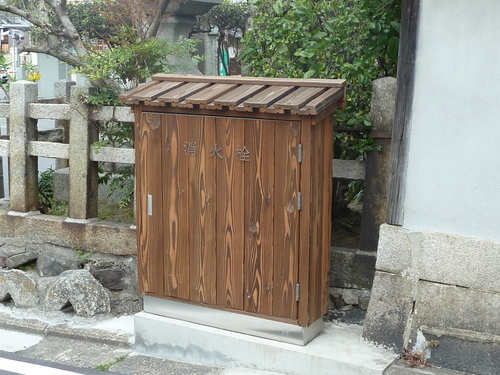 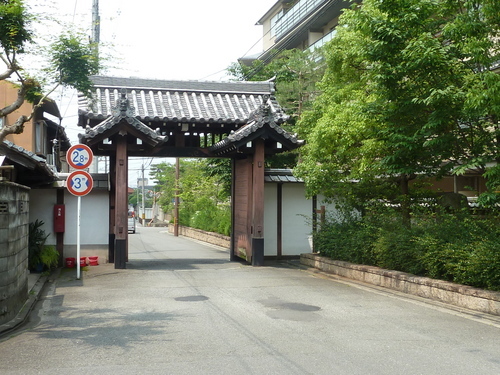 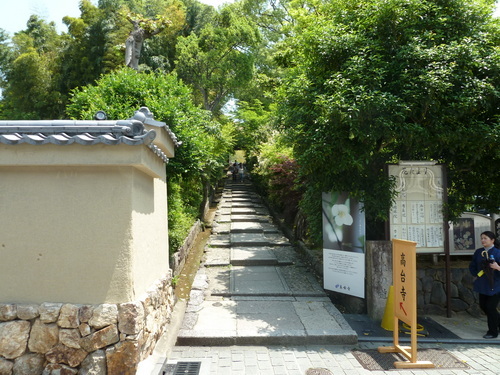 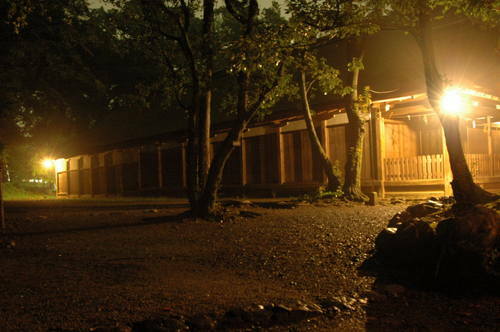 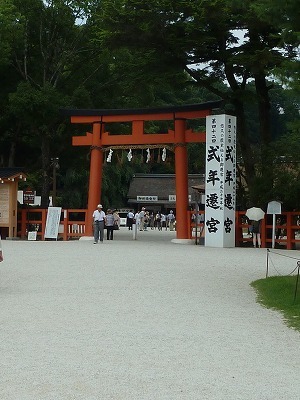 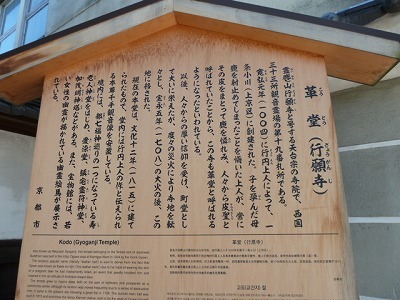 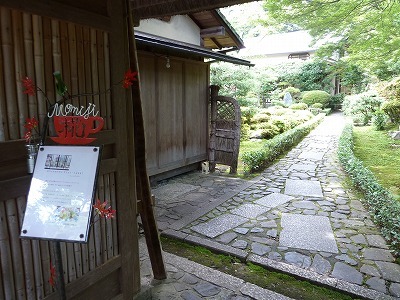 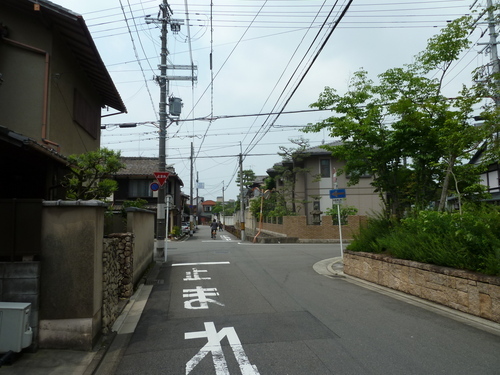 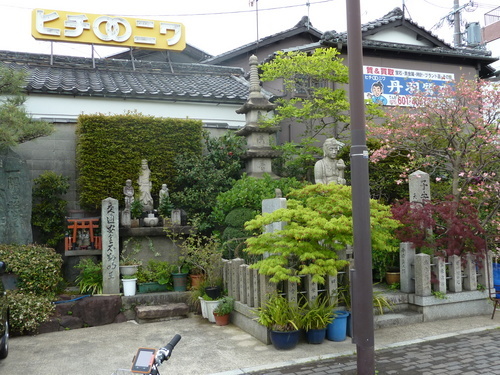 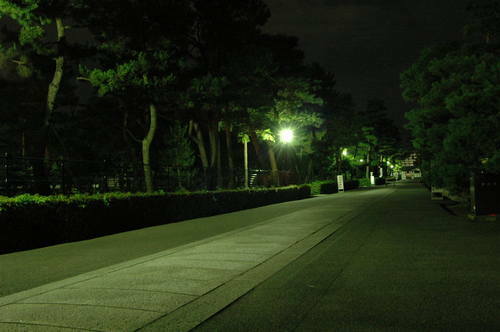 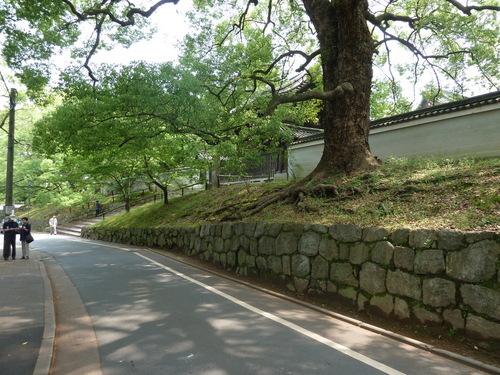 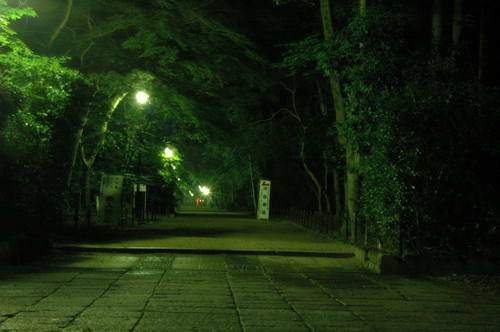 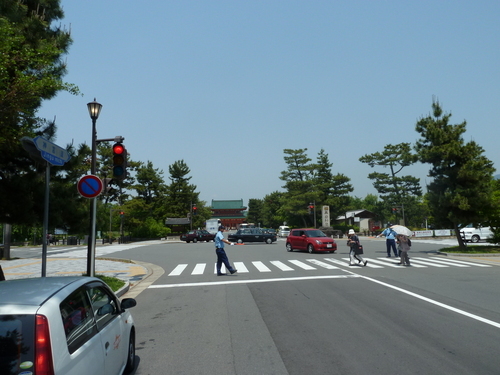 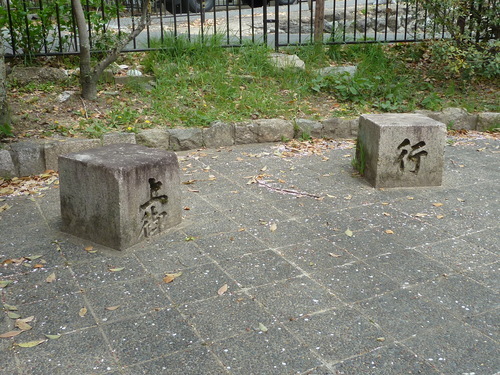 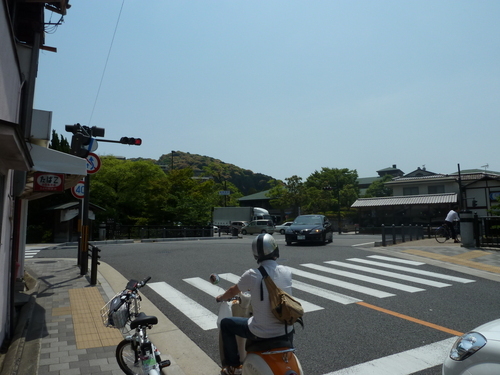 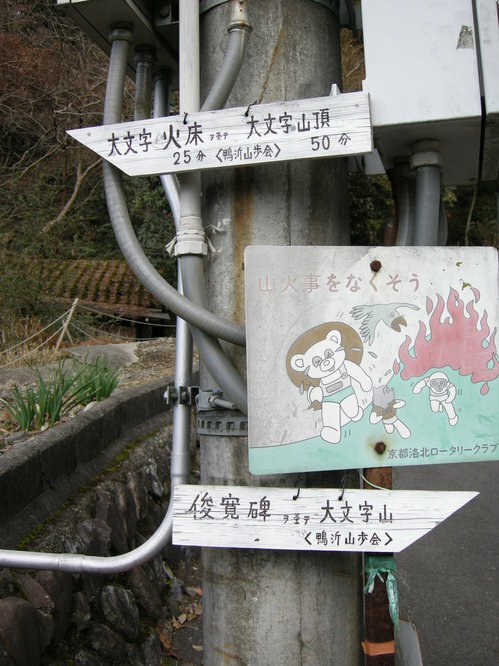 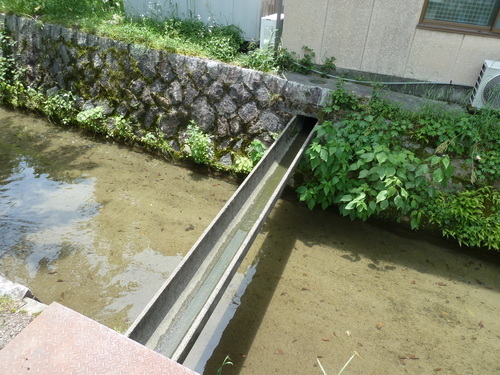 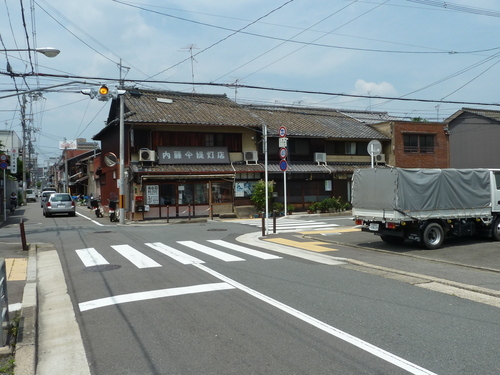 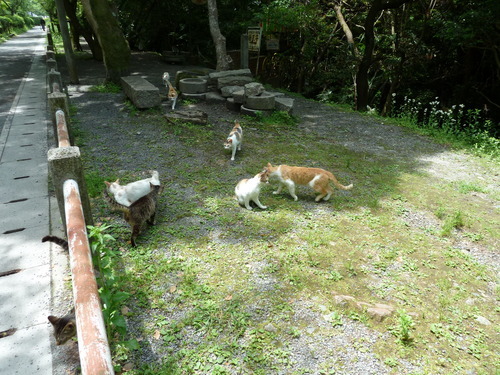 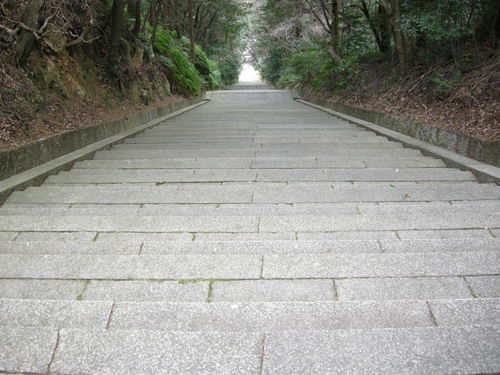 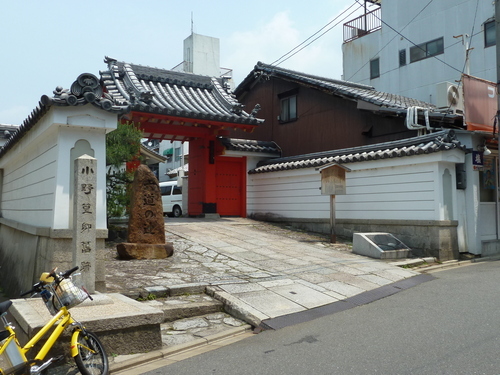 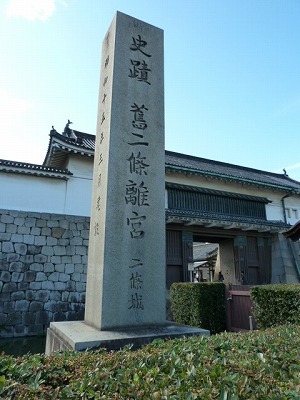 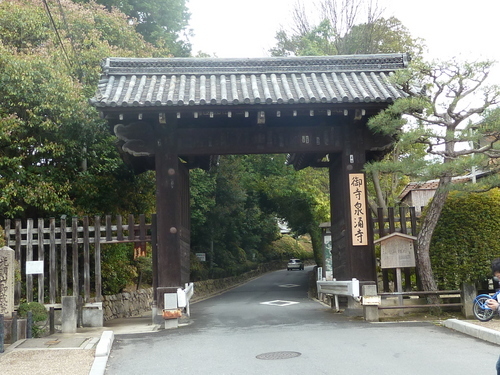 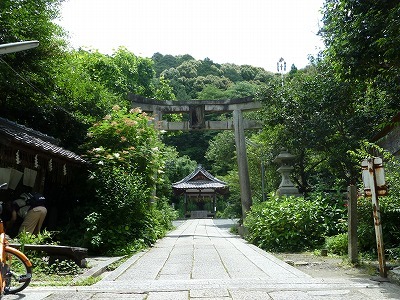 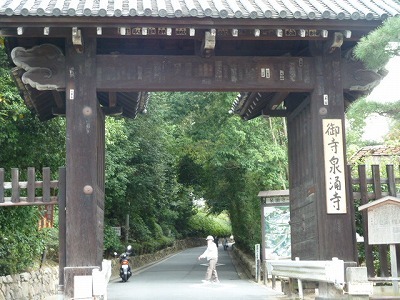 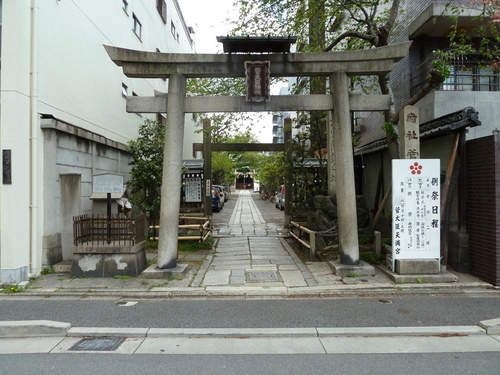 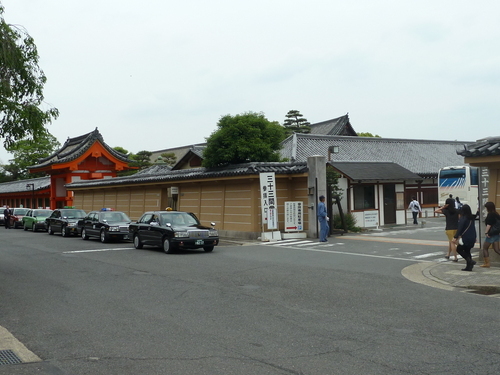 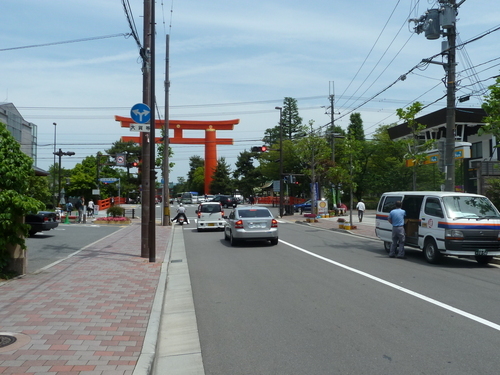 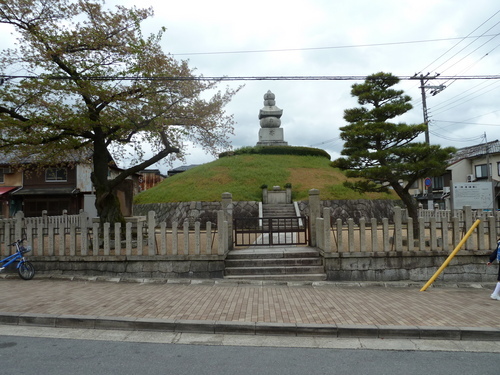 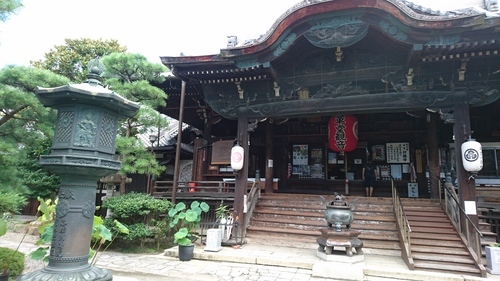 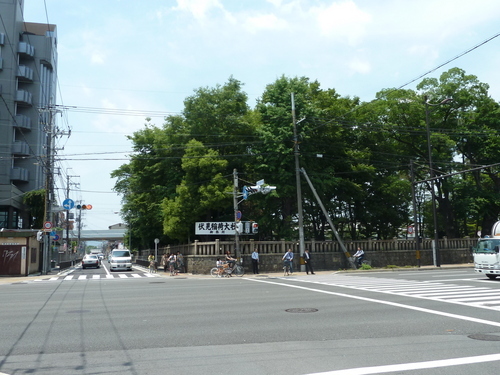 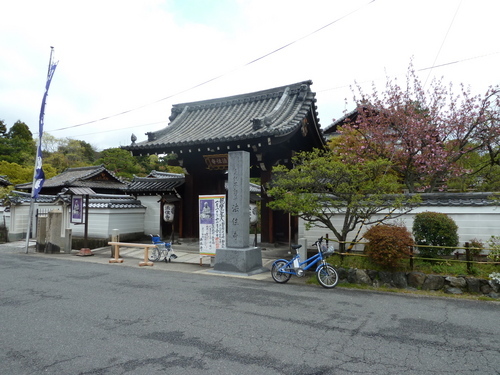 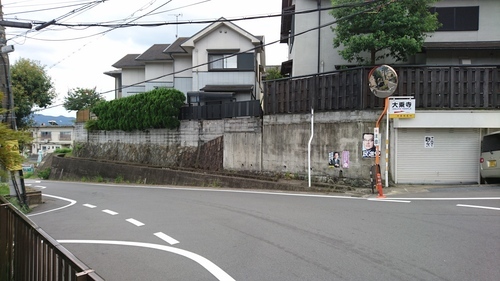 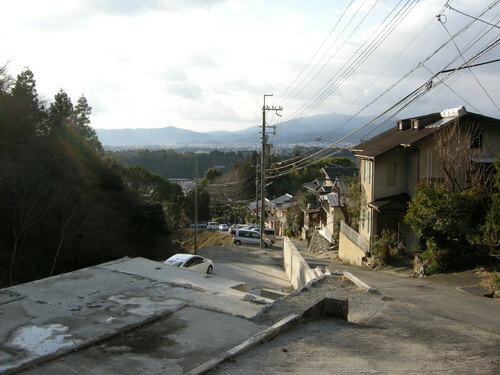 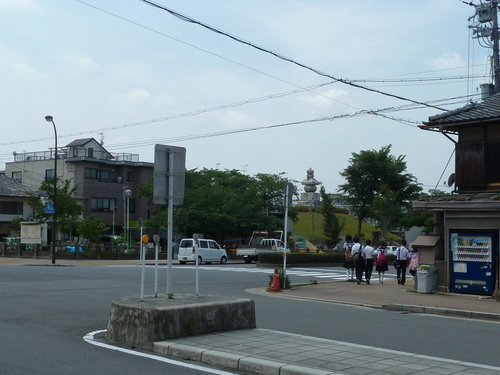 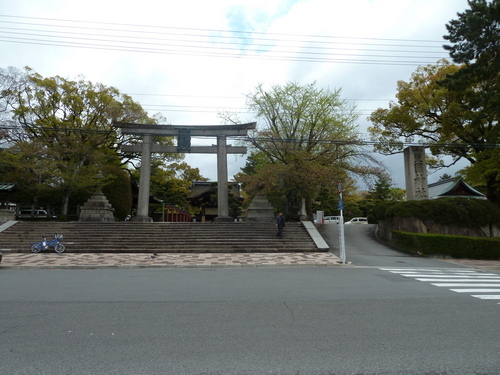 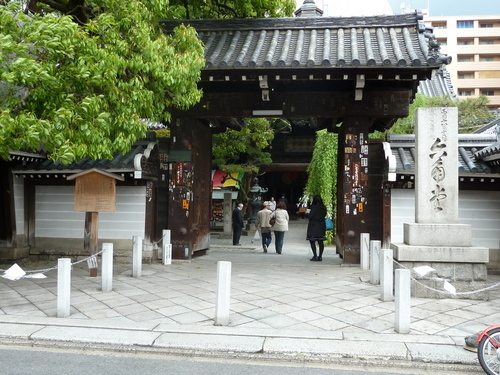 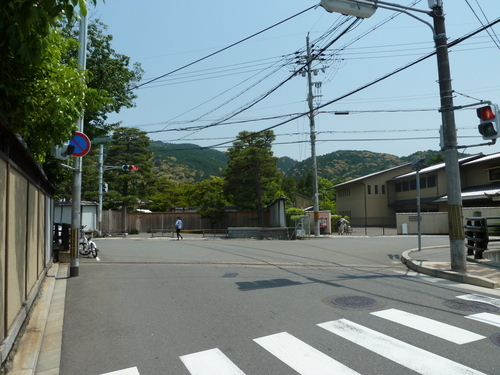 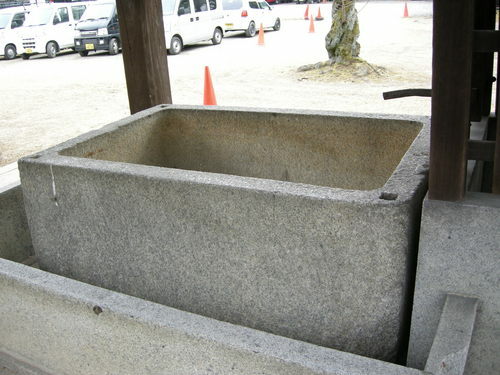 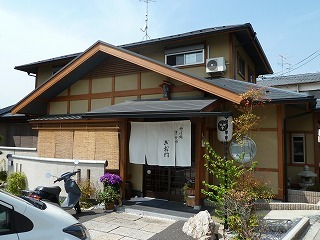 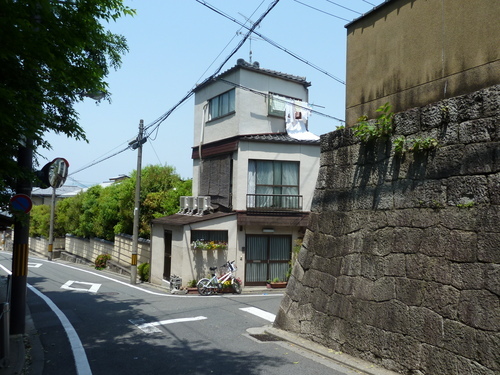 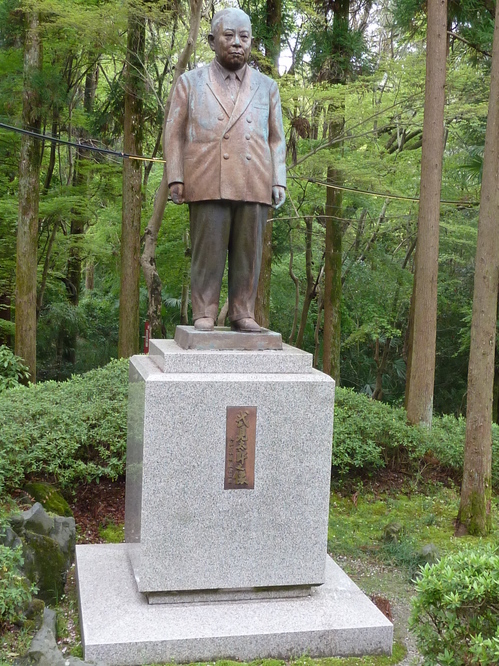 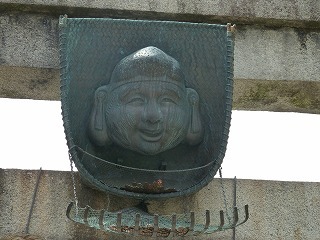 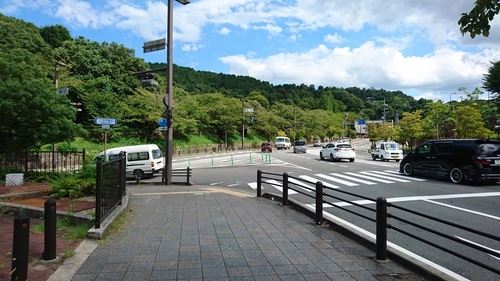 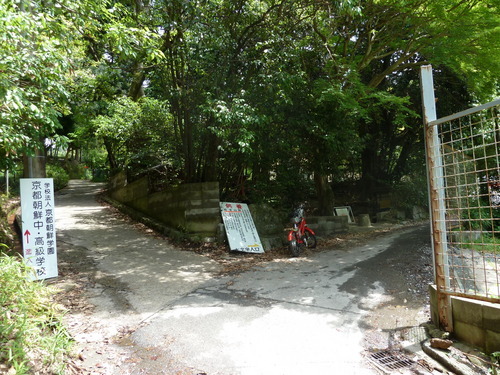 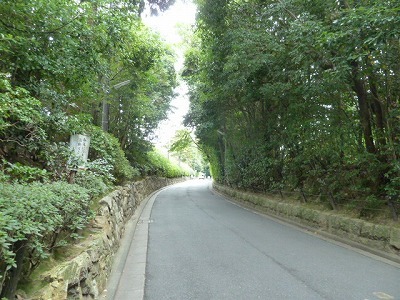 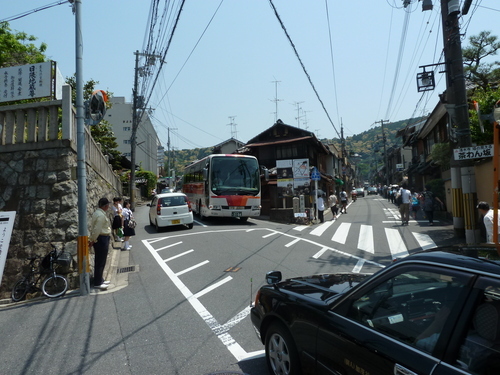 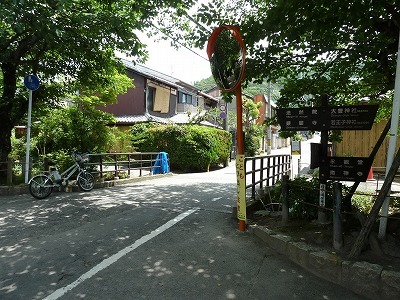 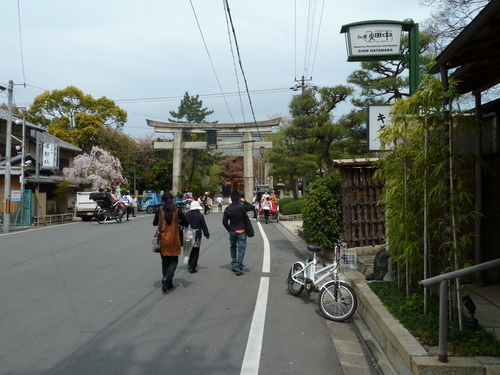 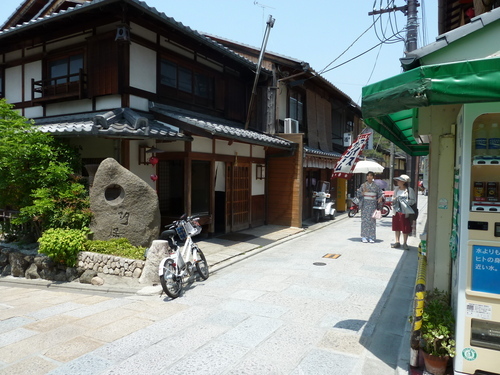 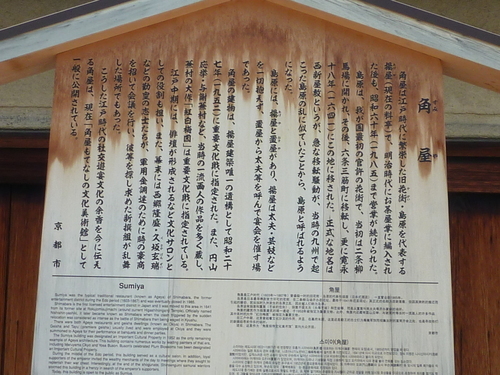 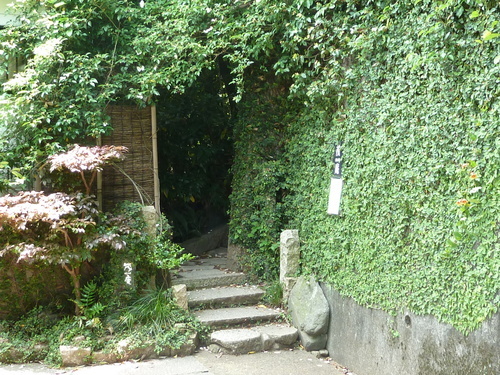 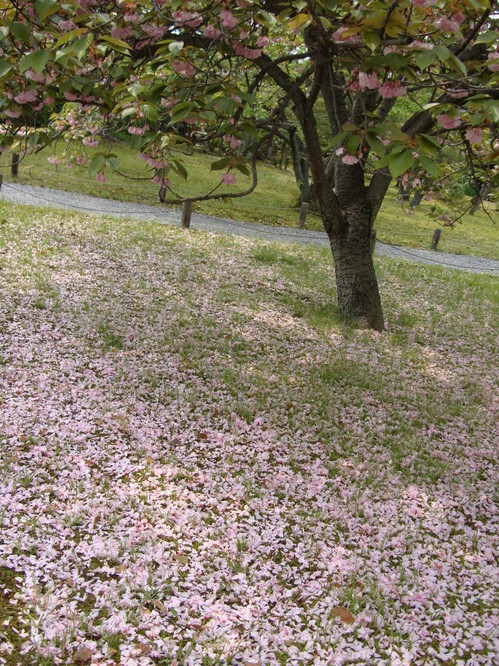 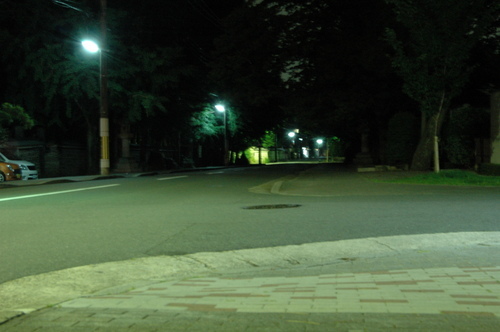 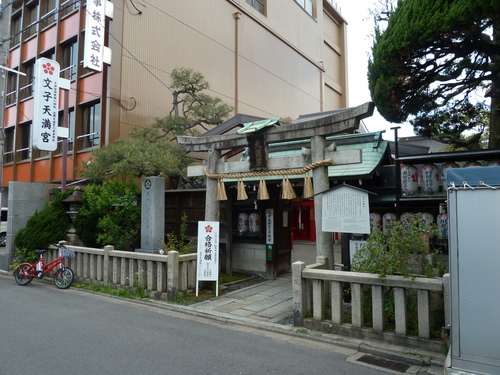 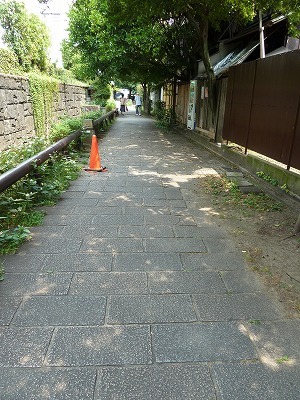 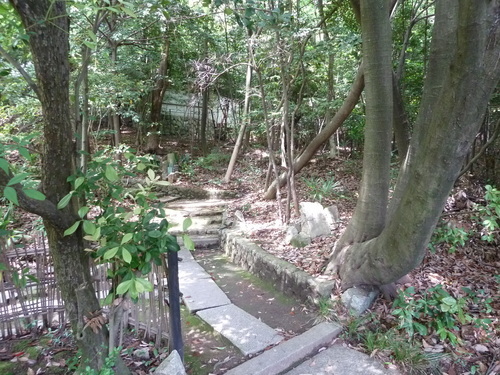 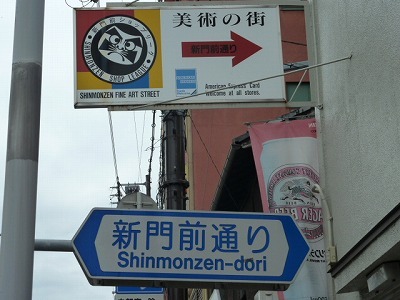 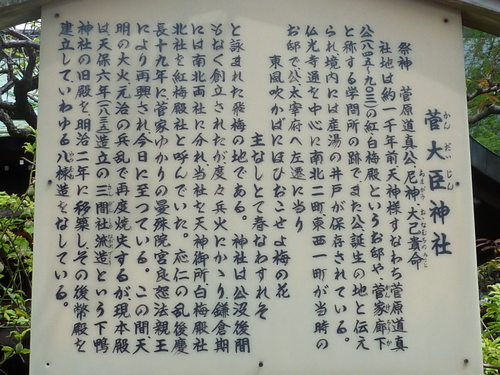 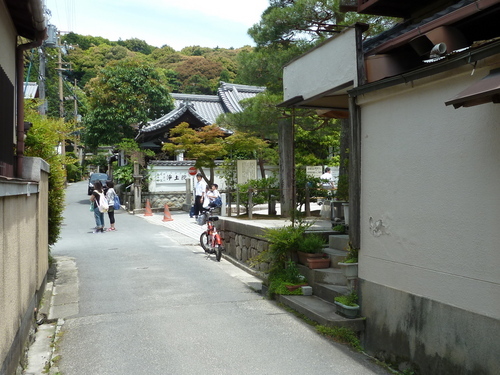 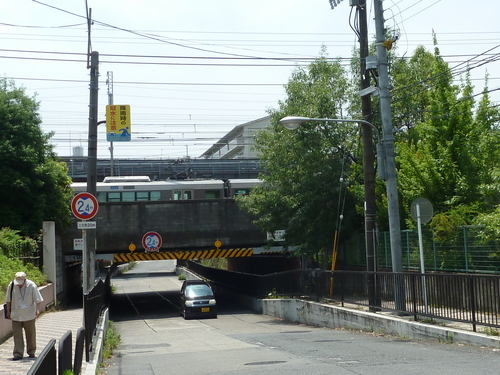 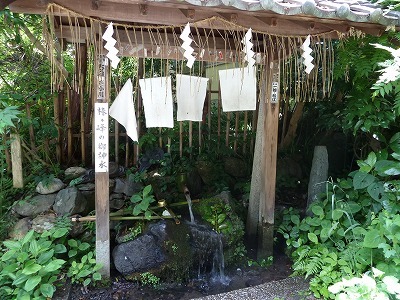 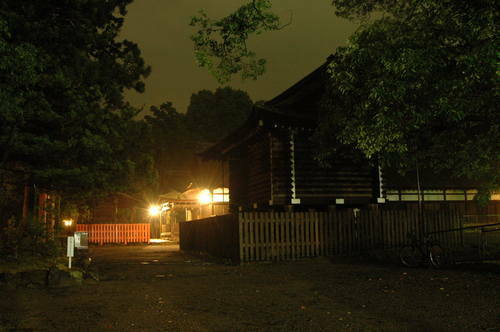 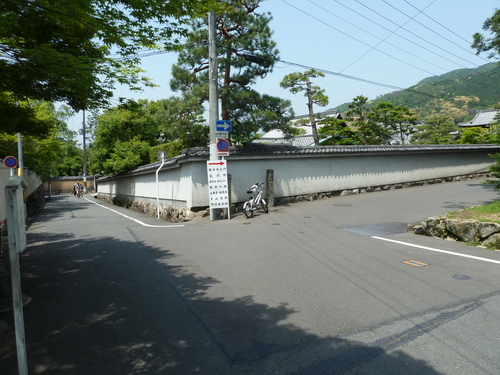 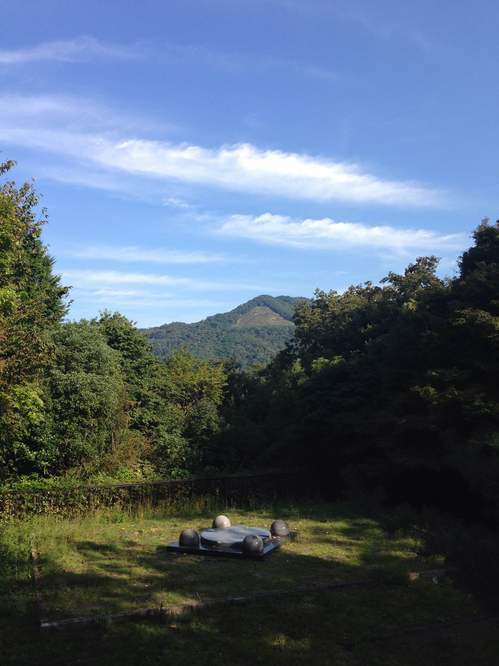 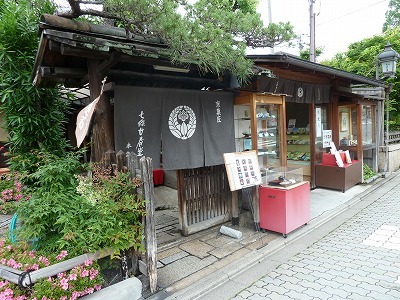 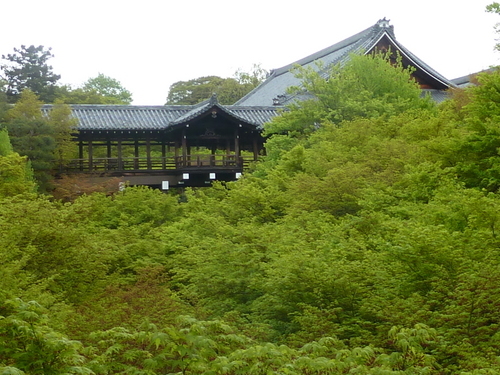 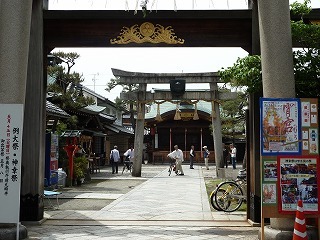 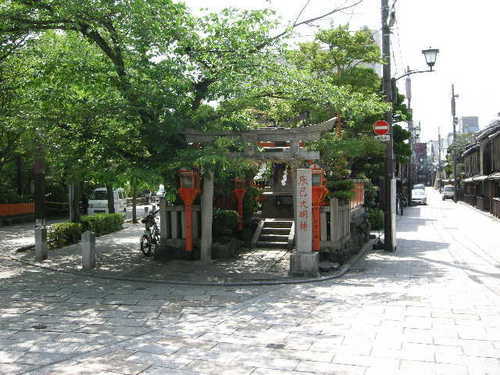 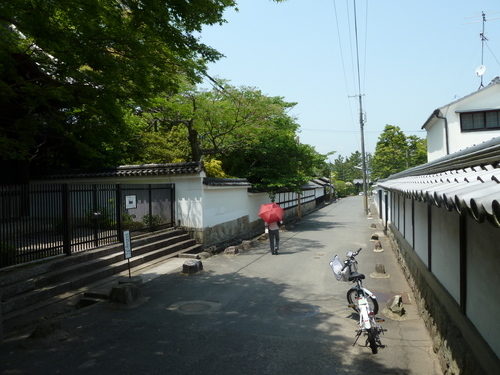 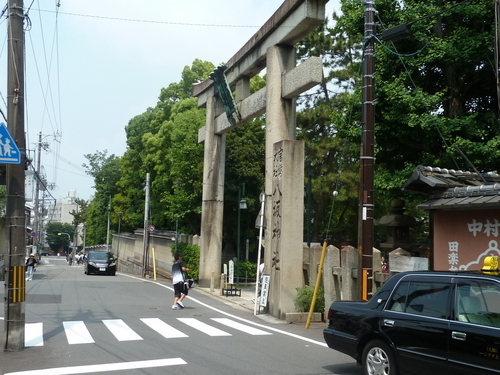 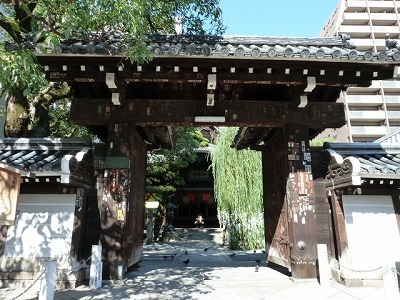 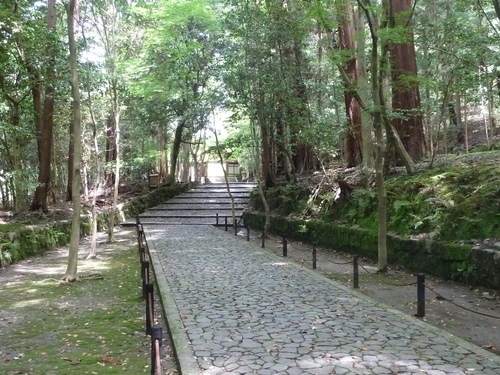 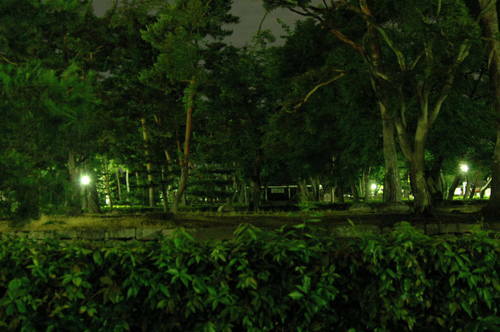 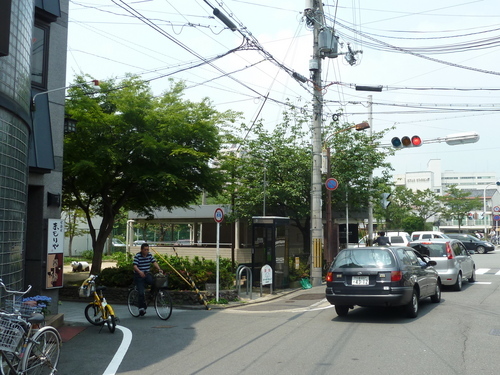 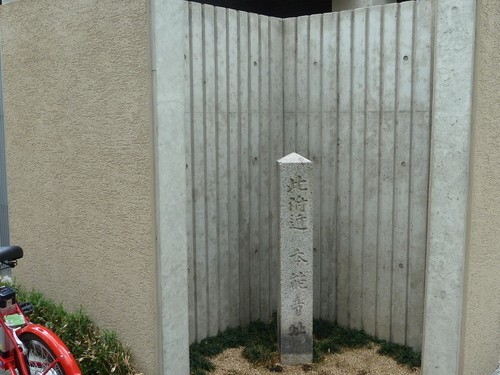 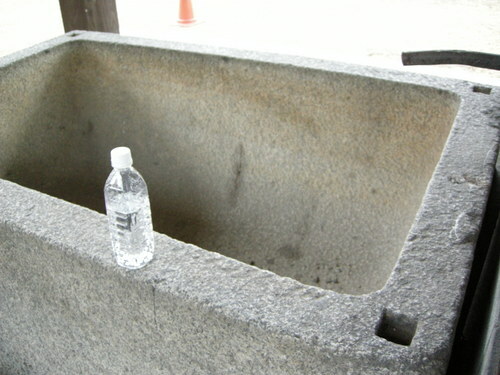 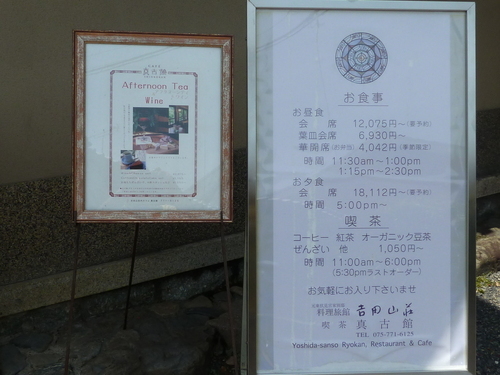 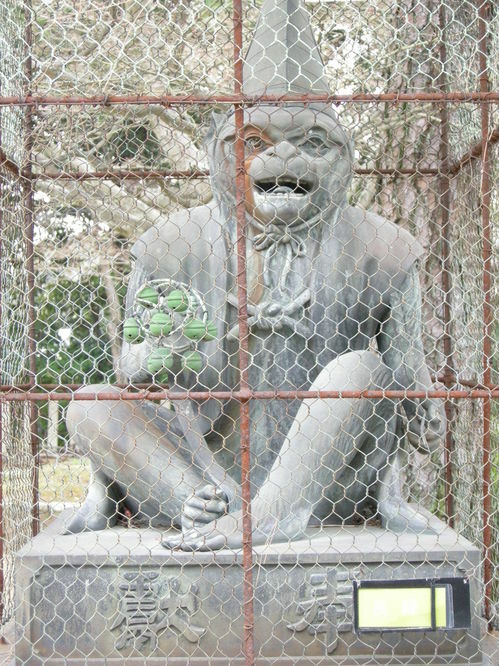 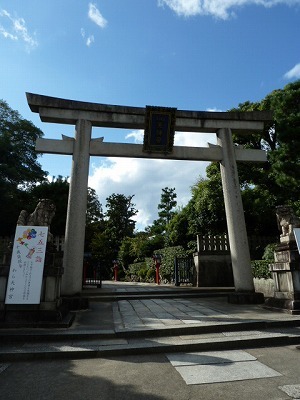 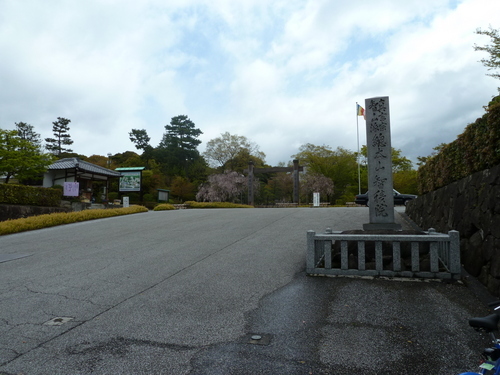 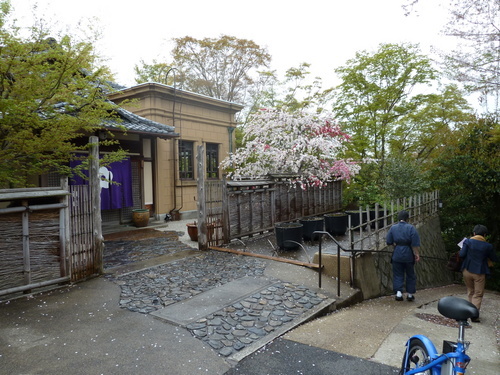 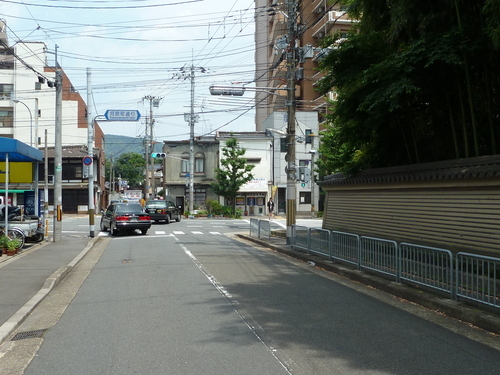 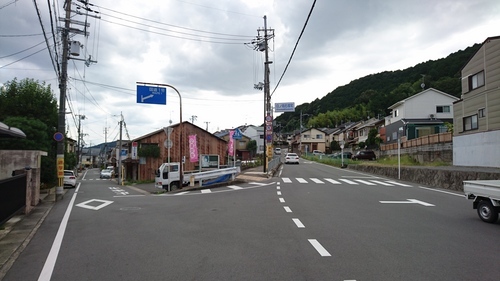 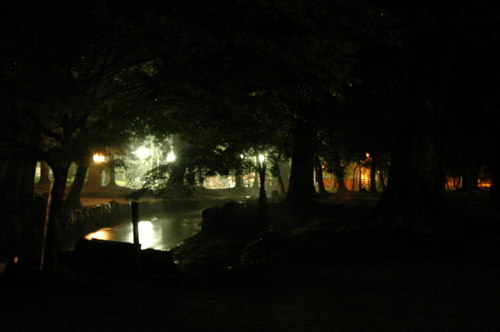 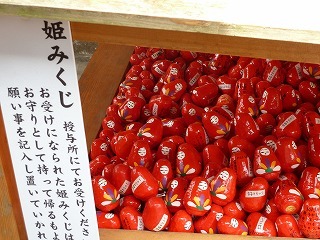 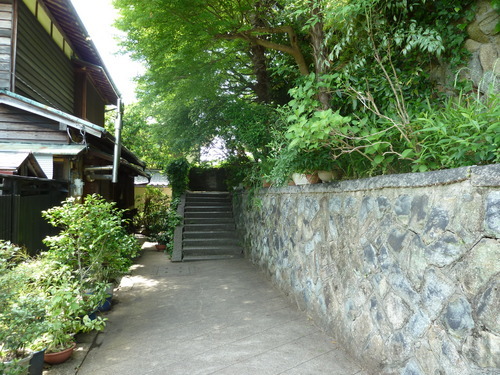 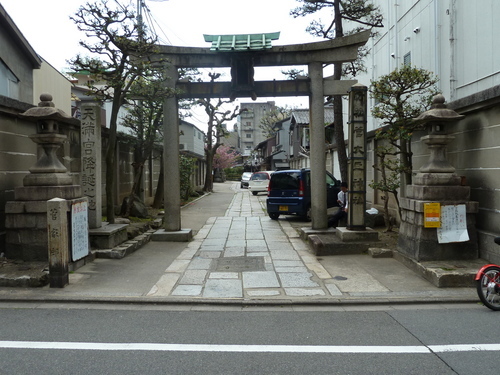 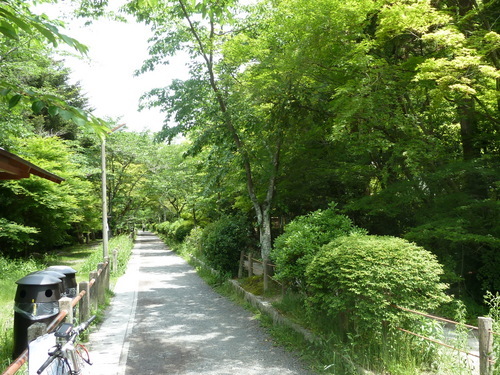 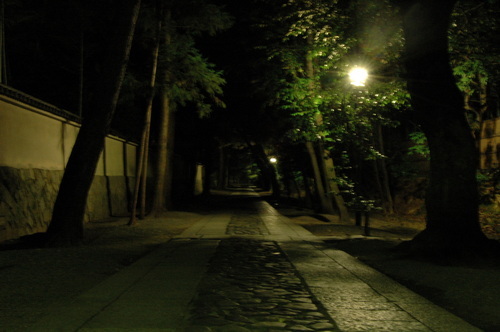 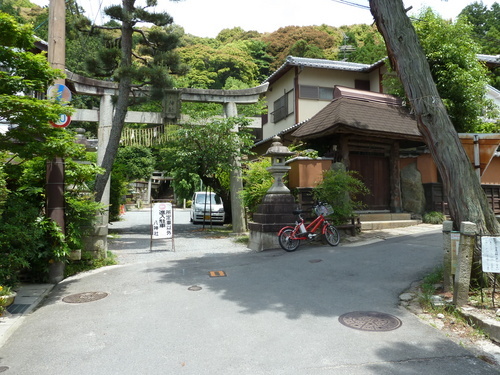 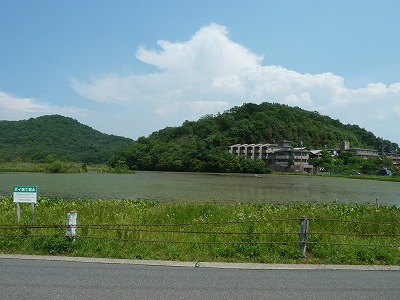 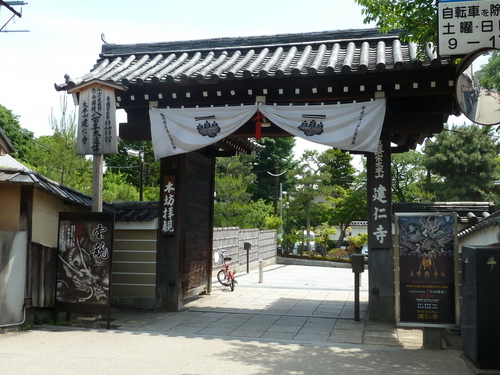 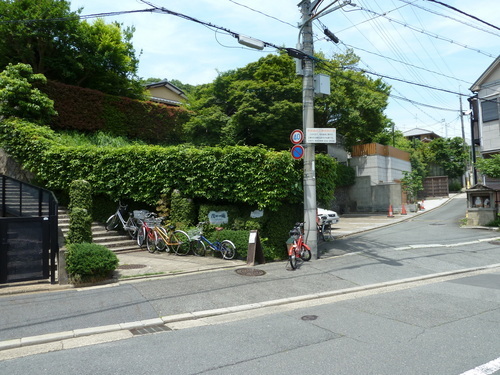 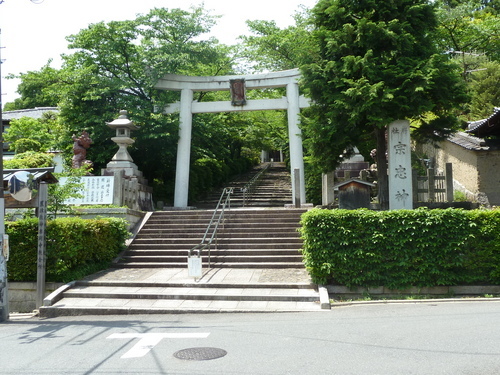 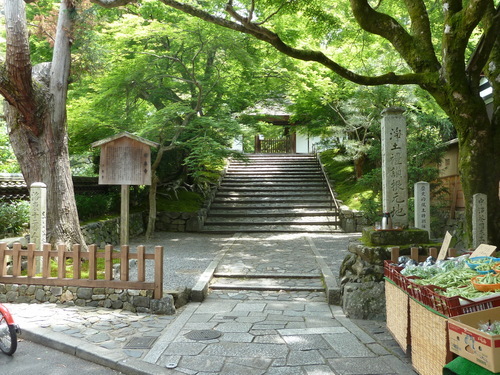 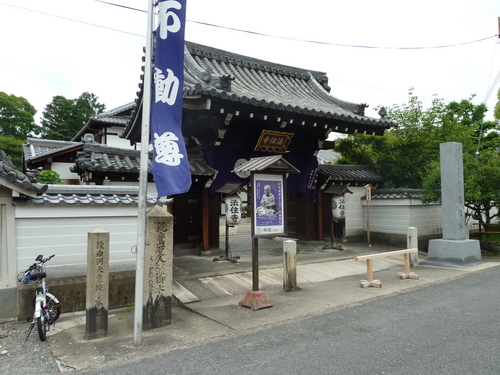 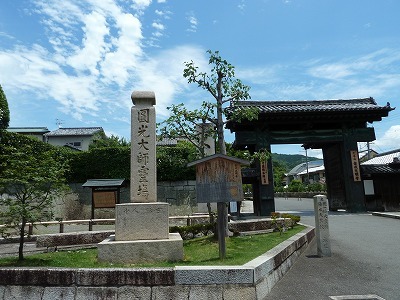 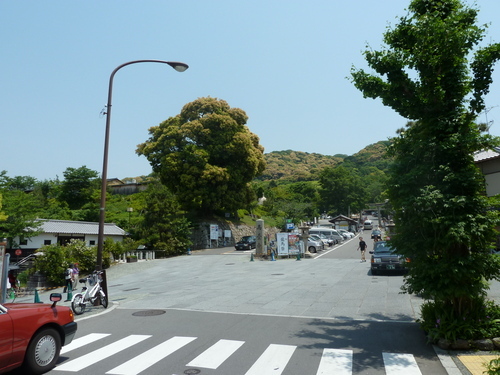 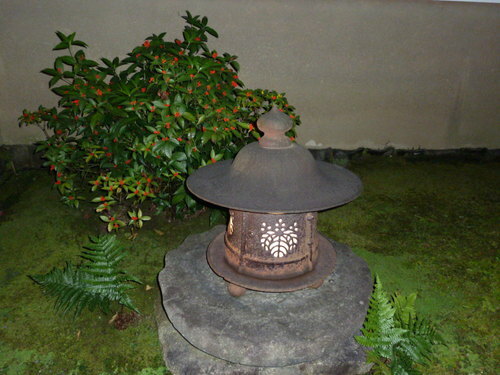 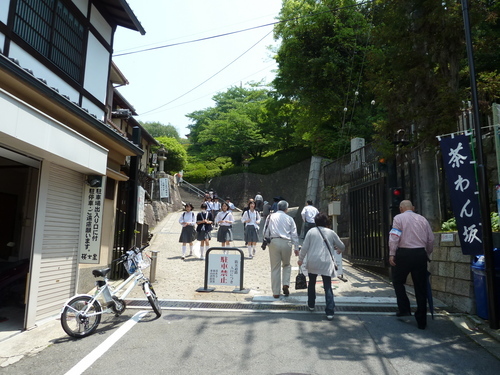 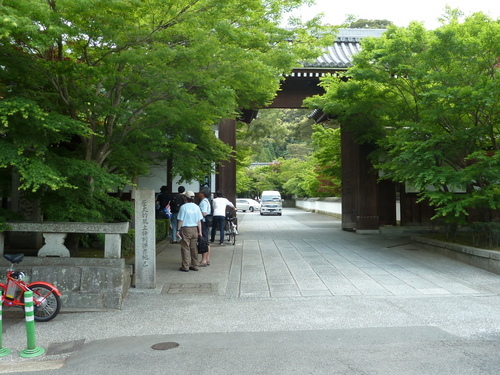 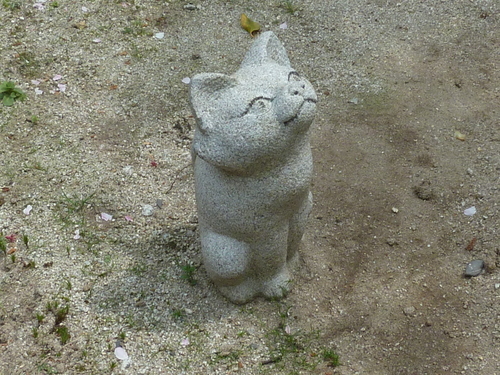 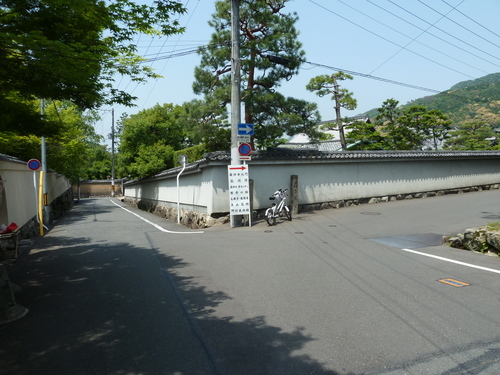 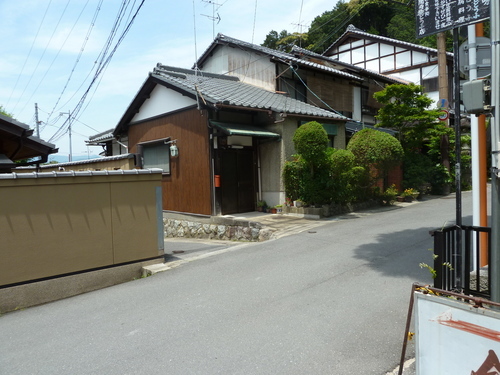 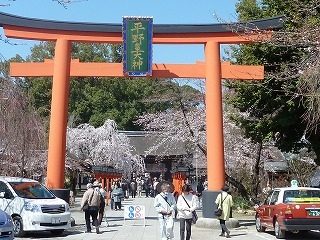 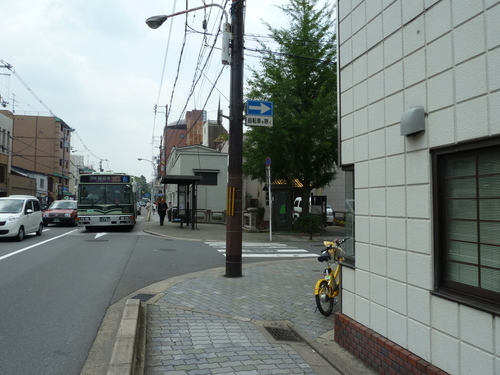 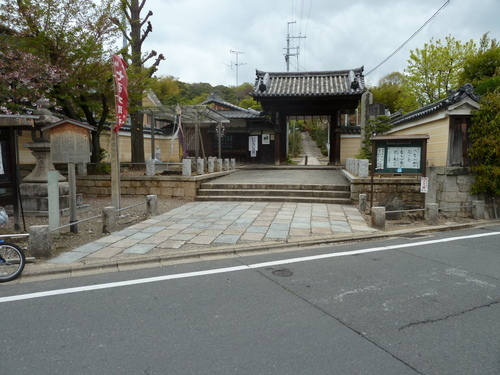 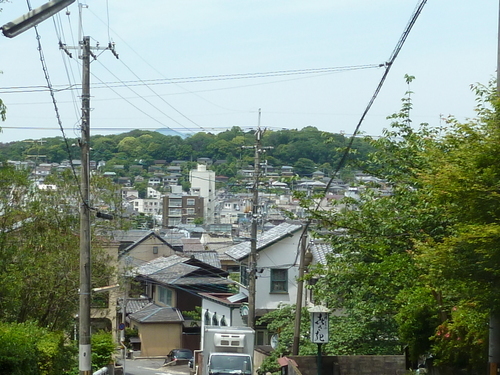 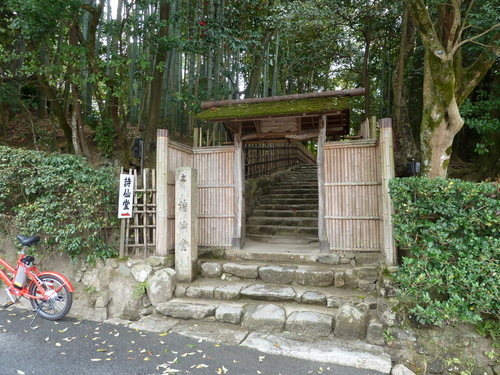 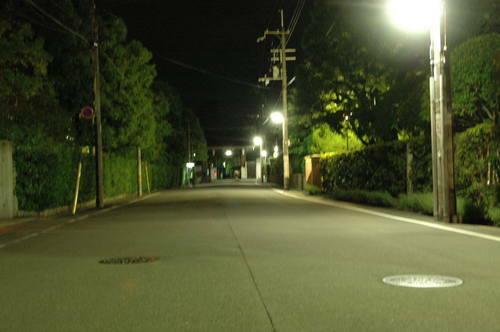 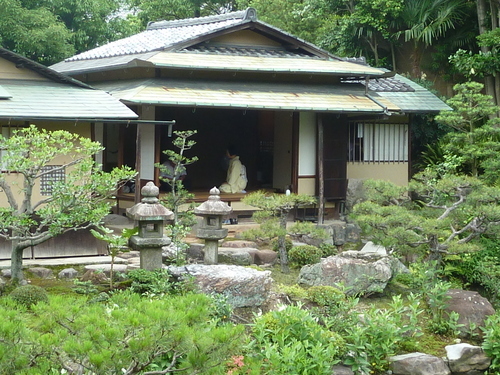 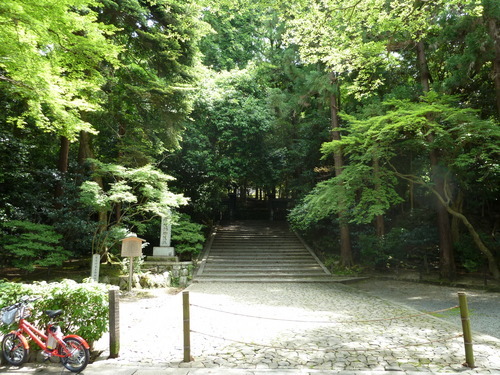 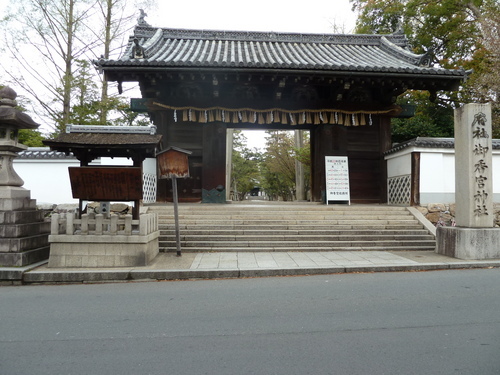 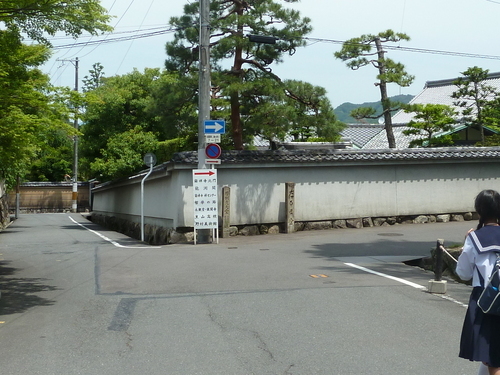 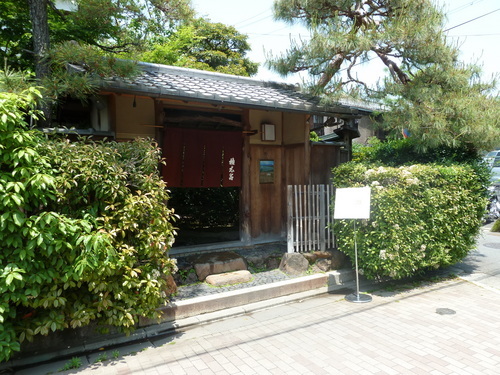 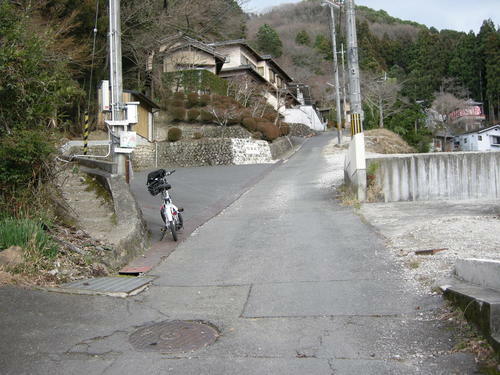 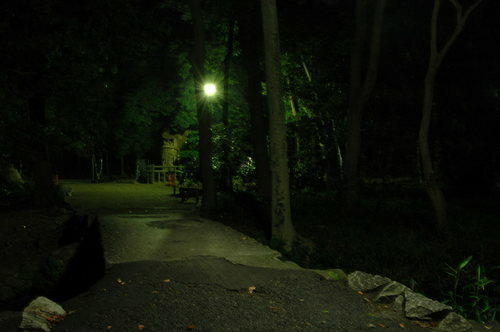 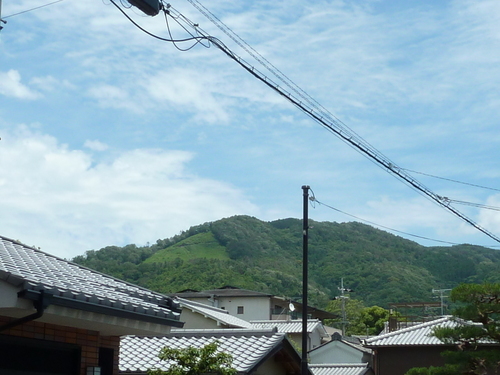 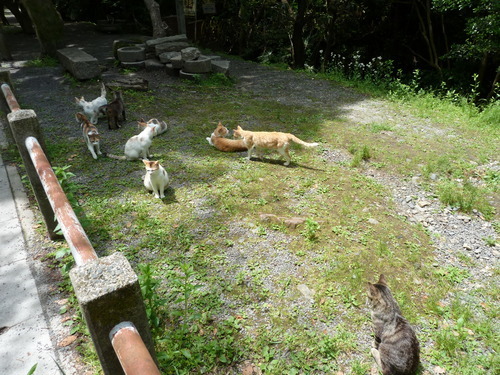 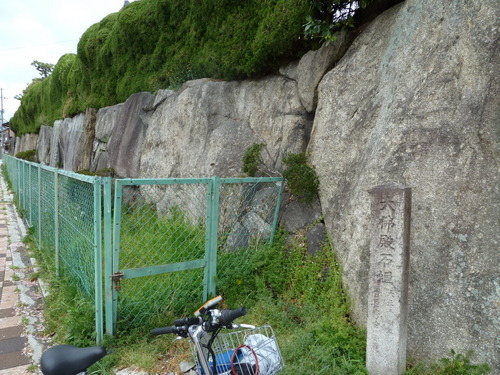 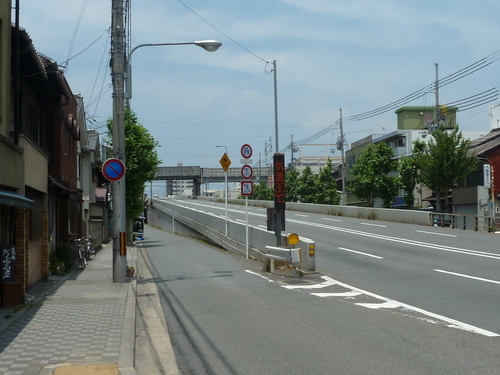 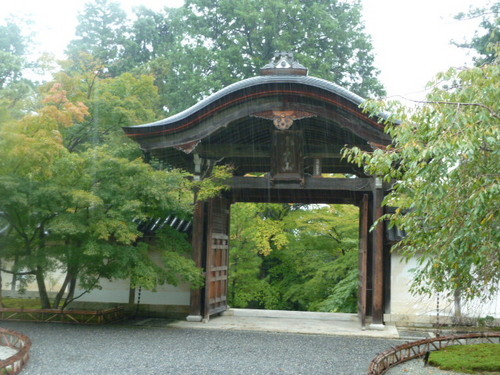 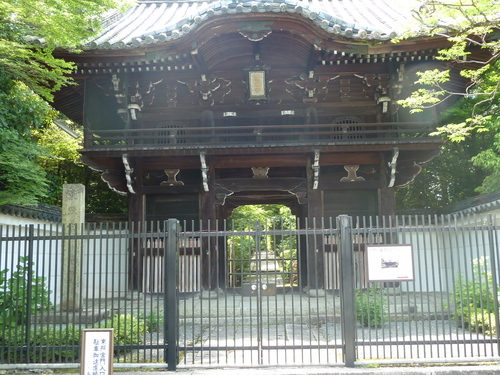 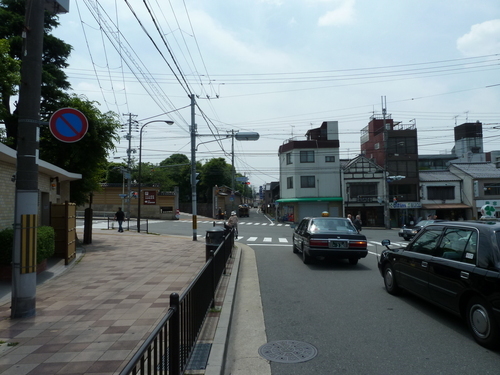 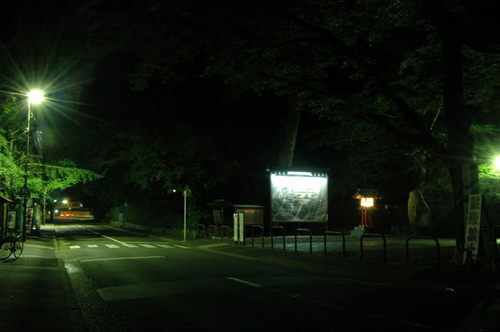 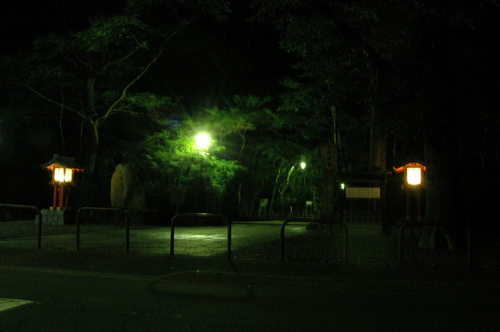 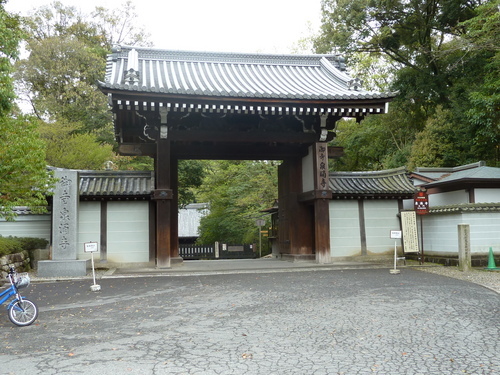 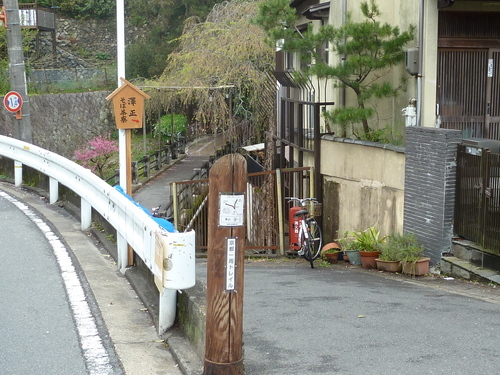 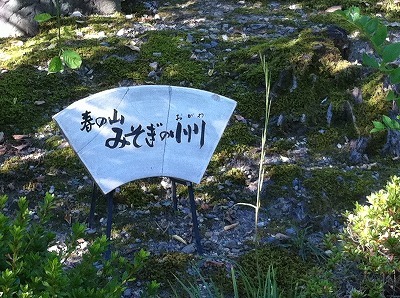 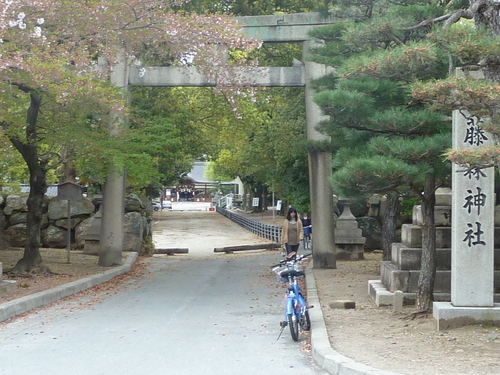 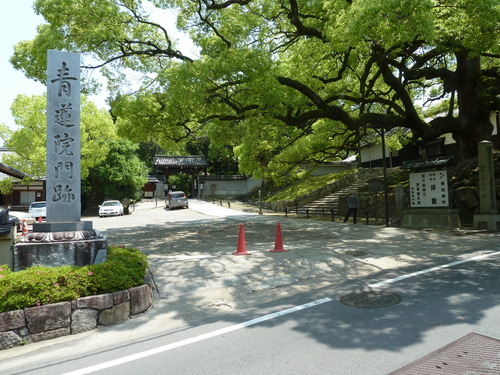 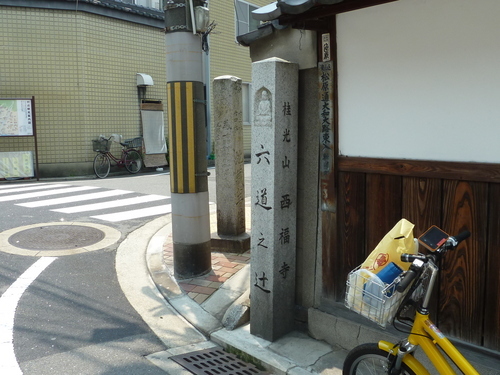 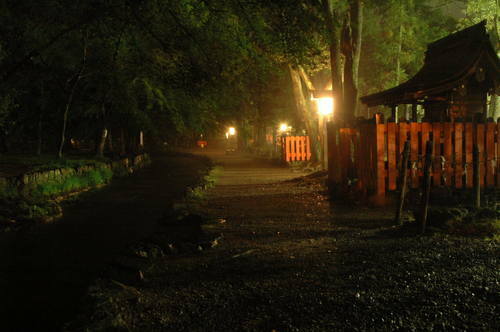 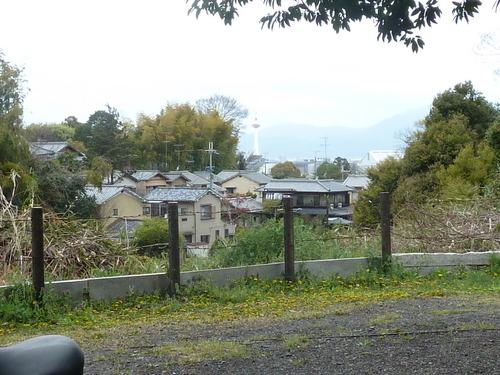 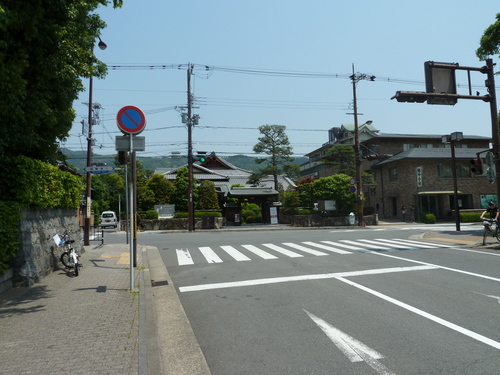 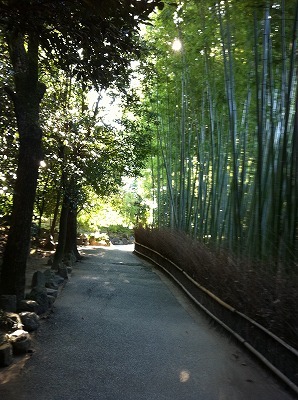 Then I went to Shinnyodou which is near Yoshida shrine but it is located on a hill and a bit confusing to find. 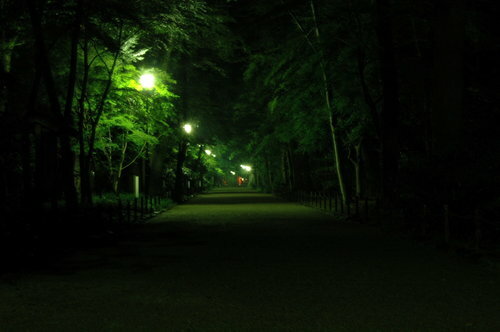 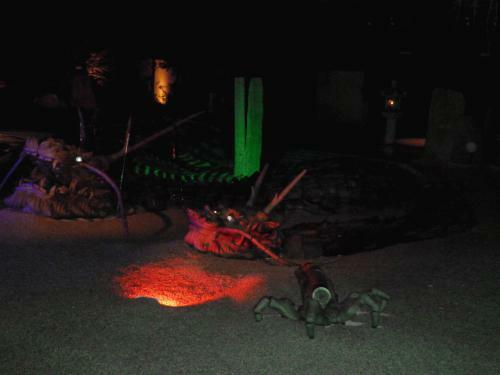 I would say it is really worth it to visit there. 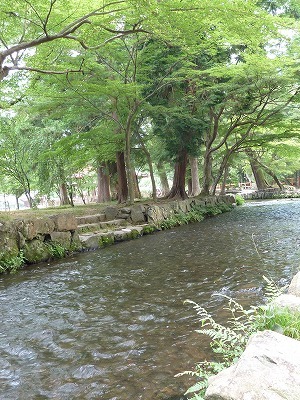 Not too many people and very beautiful scenery. 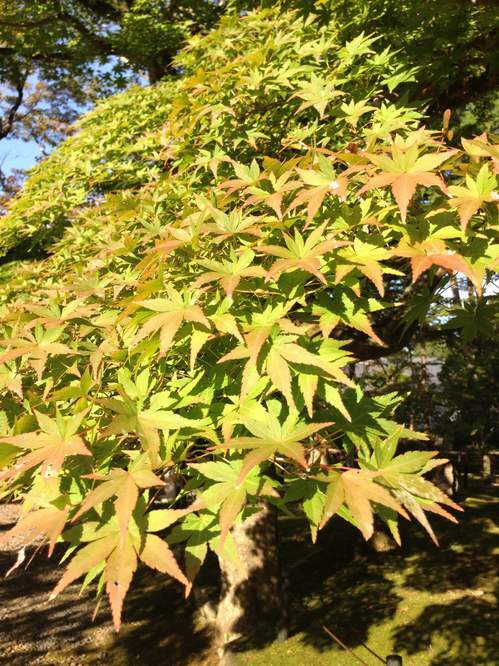 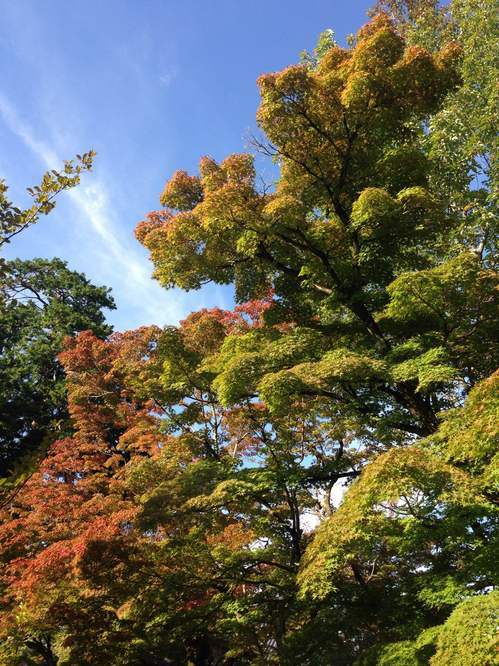 It is just middle of October but I found some beautiful Autumn leaves.It is not common in Kyoto. 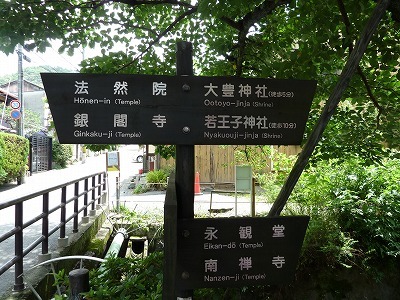 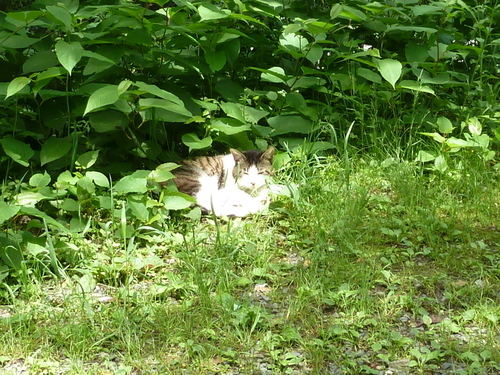 I recommend these spots if you like to be away from busy areas.